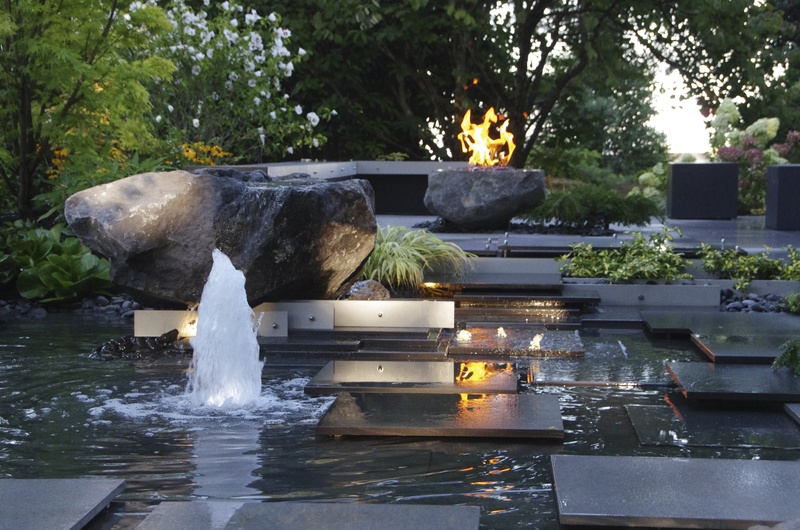 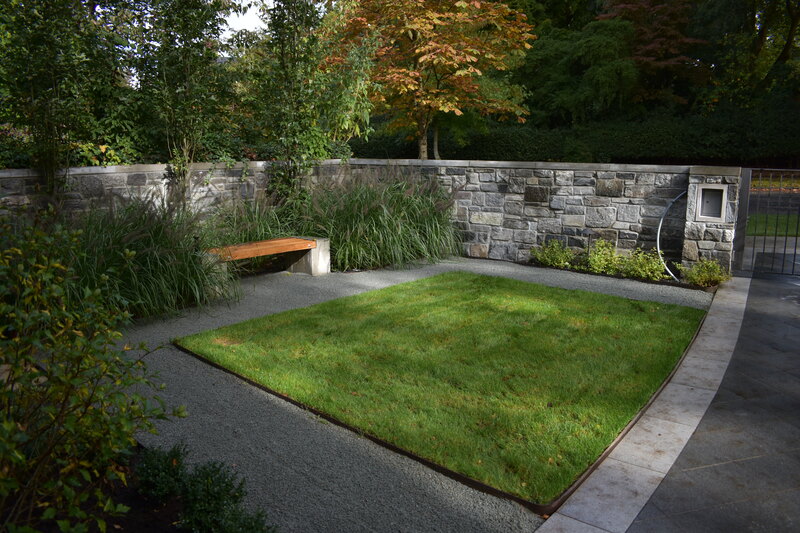 This garden is the result of renovating a mature landscape that was damaged by construction. 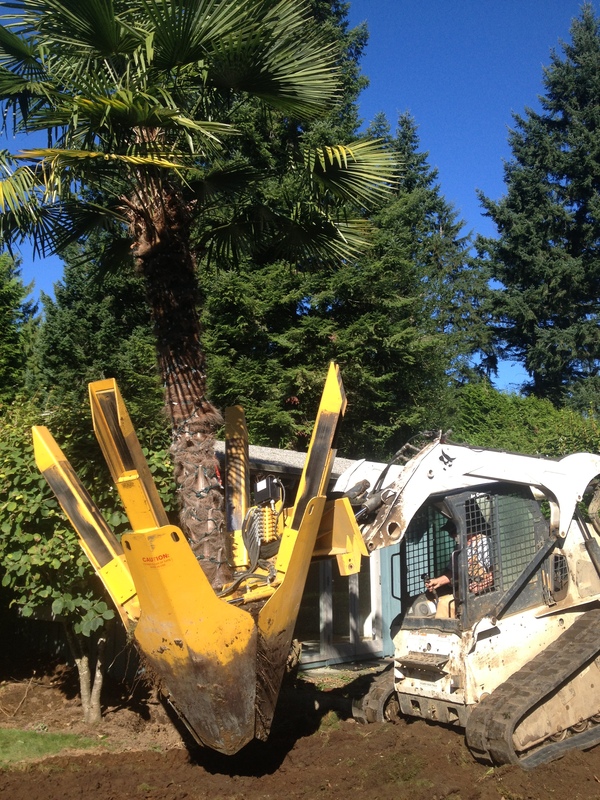 To achieve privacy, large trees were added. 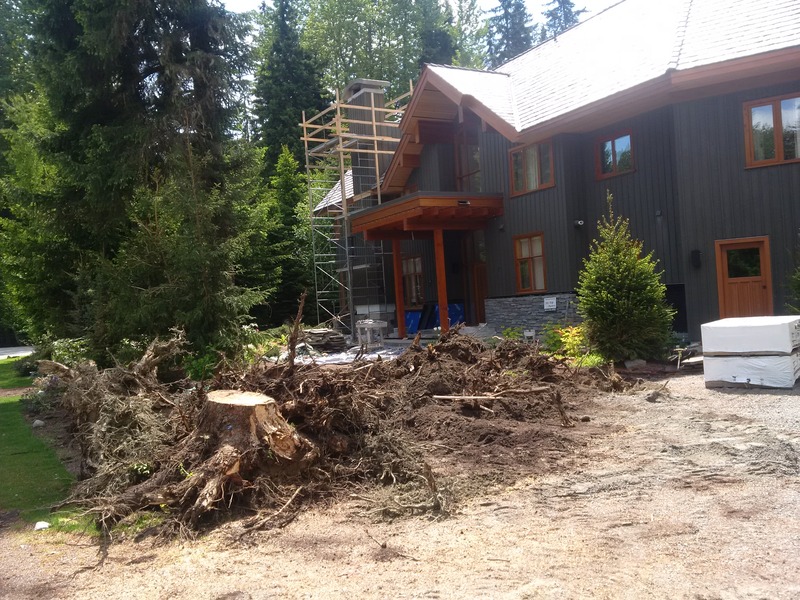 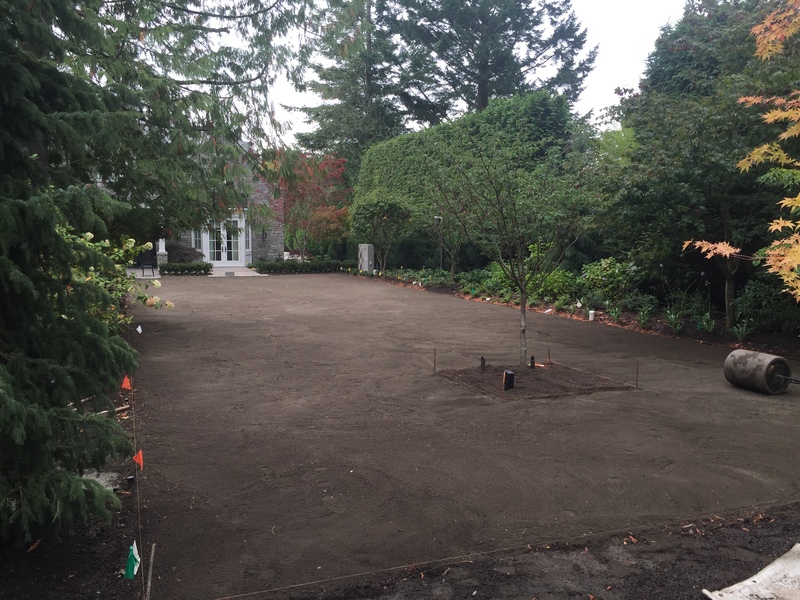 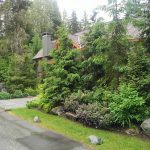 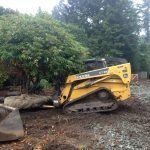 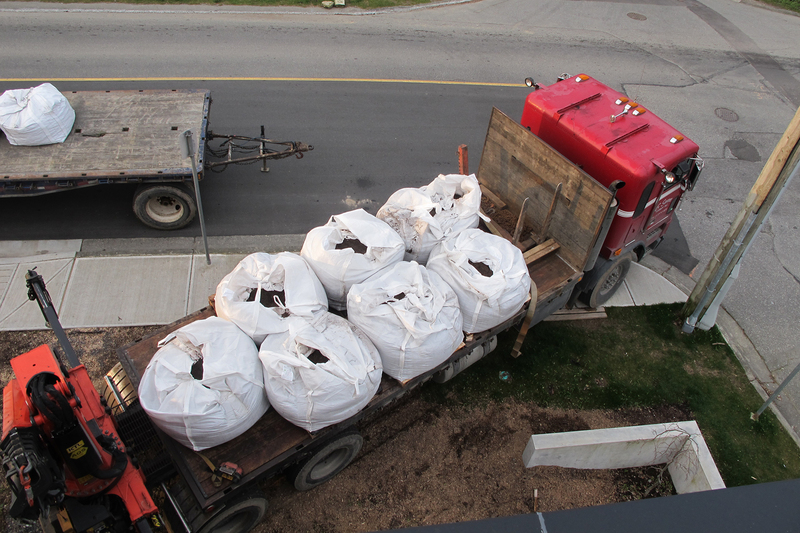 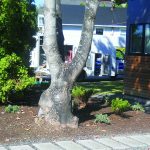 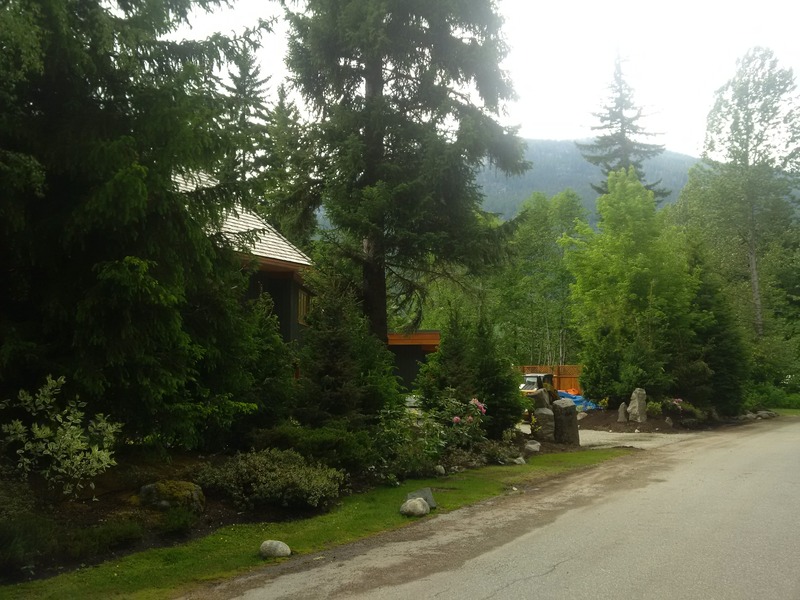 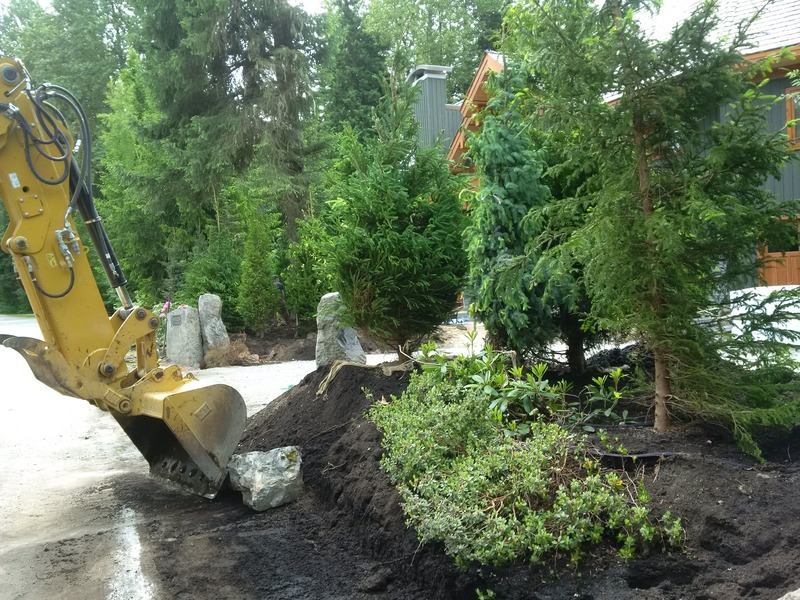 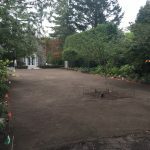 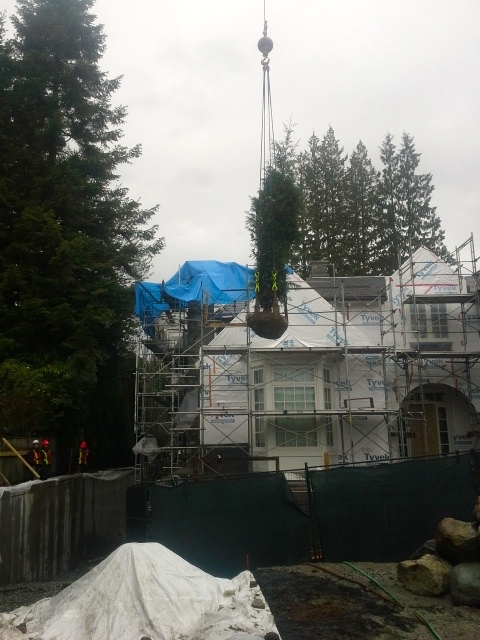 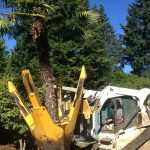 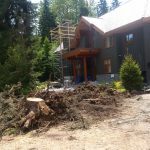 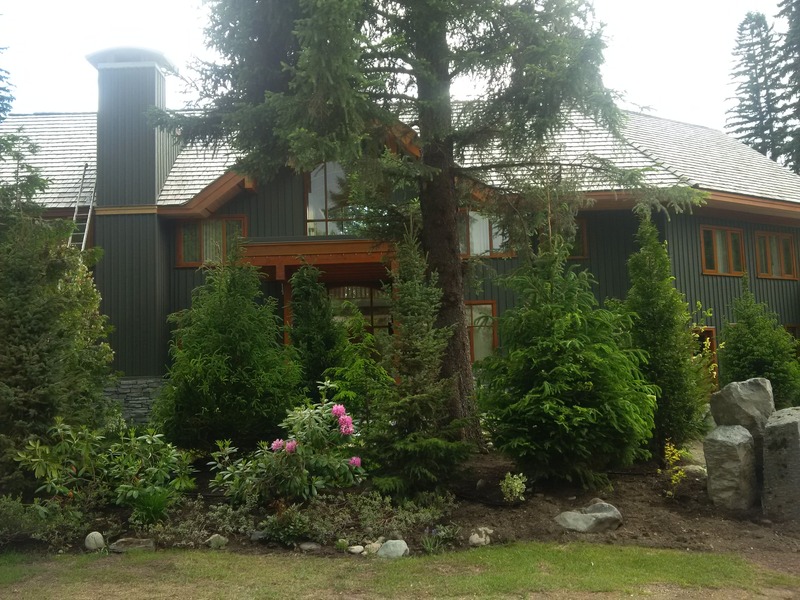 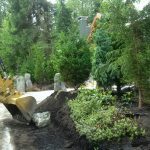 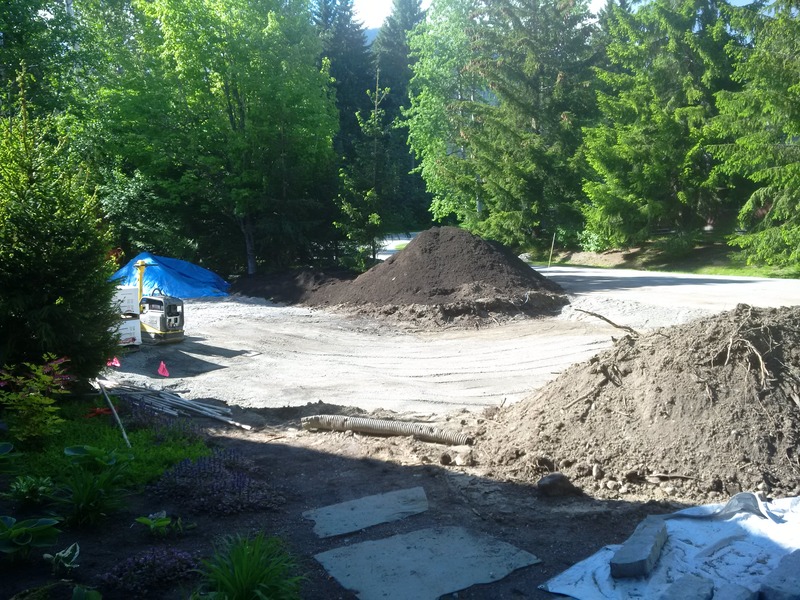 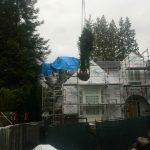 Existing plant material had to be saved for re-planting after ‘switching’ driveway and forested planting area in the front. 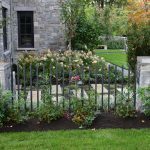 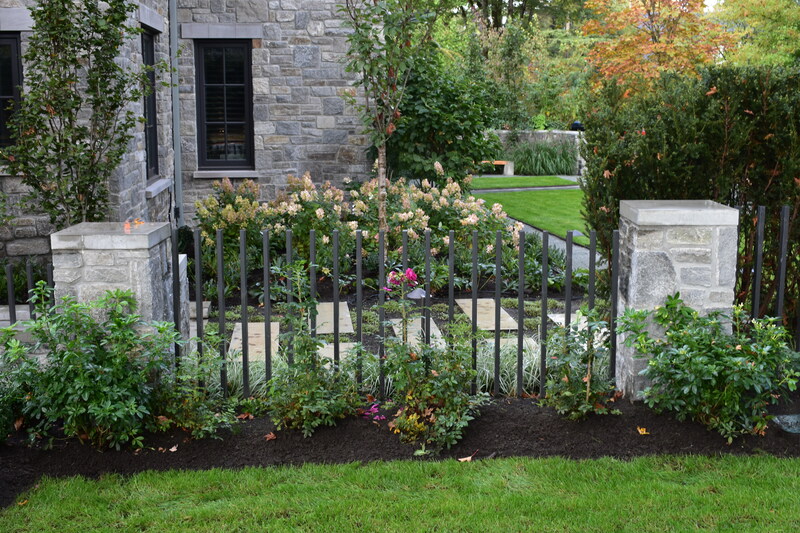 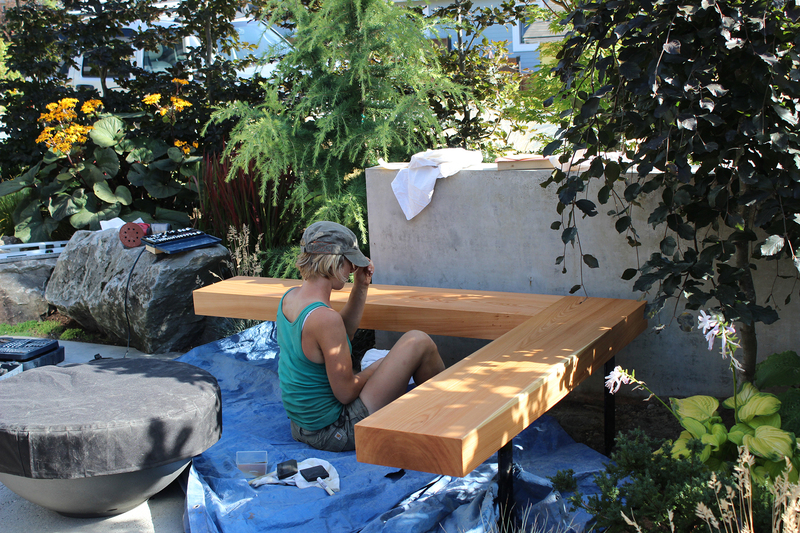 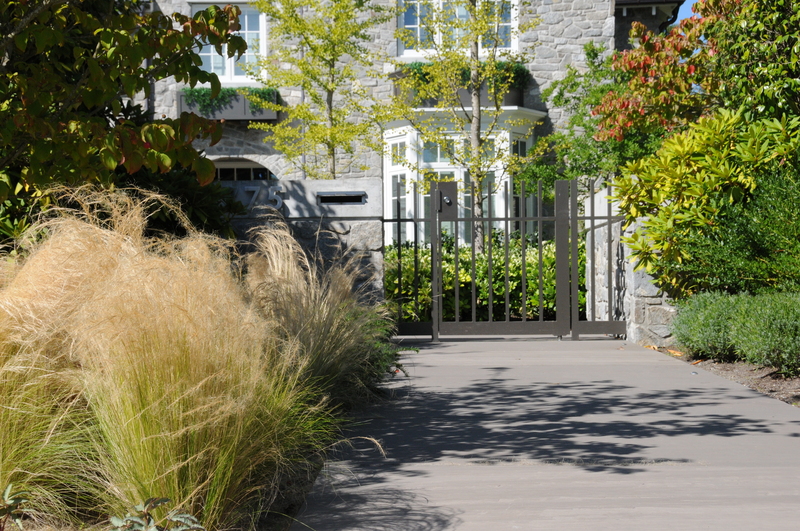 The new gardens blends with the existing and provide privacy, colour and seasonal interest. 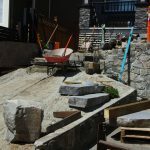 Pathways, planting- and play-areas were re-created according to the new building’s, the owners’ and their young children’s as well as individual plants’ requirements. 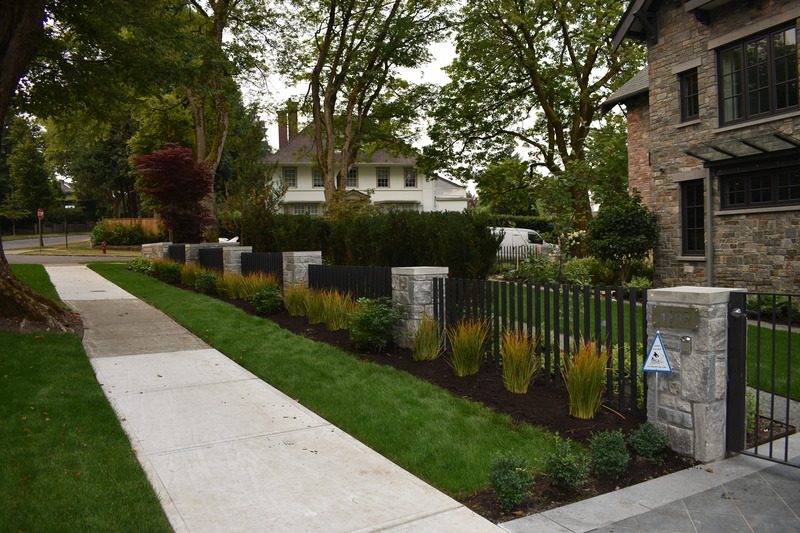 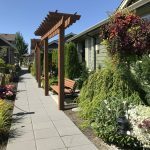 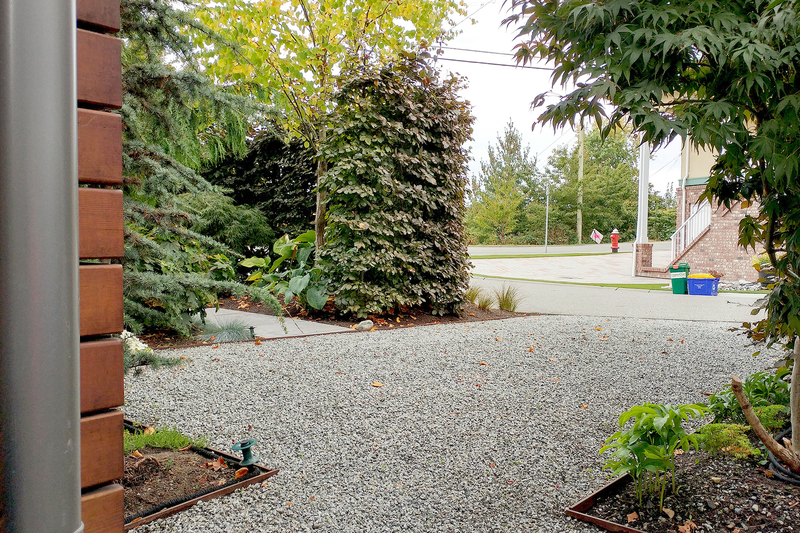 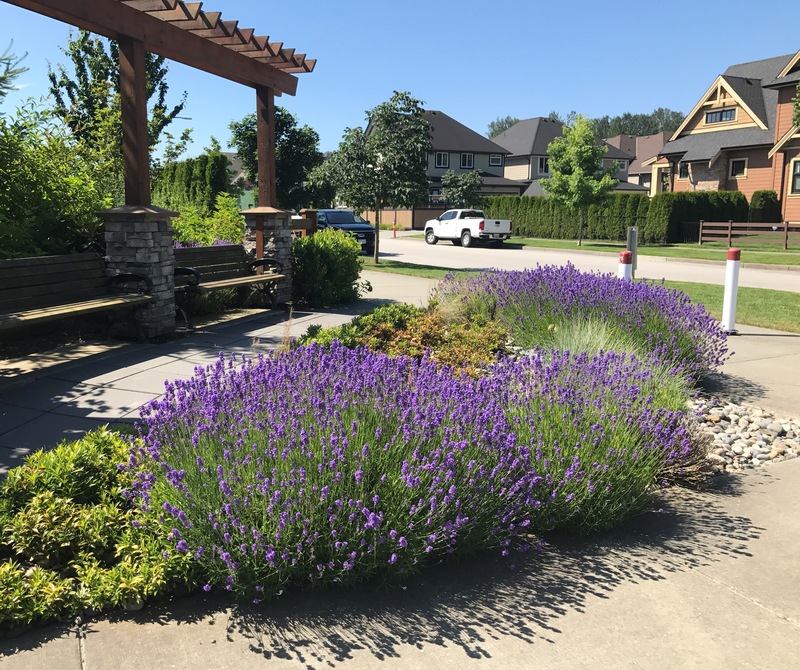 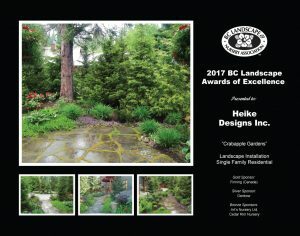 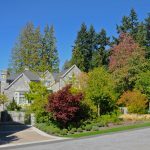 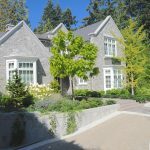 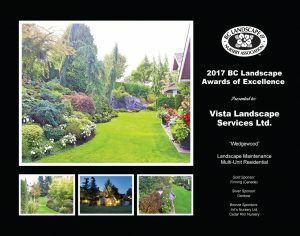 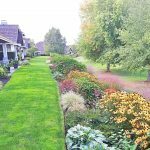 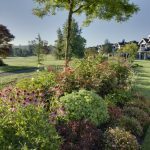 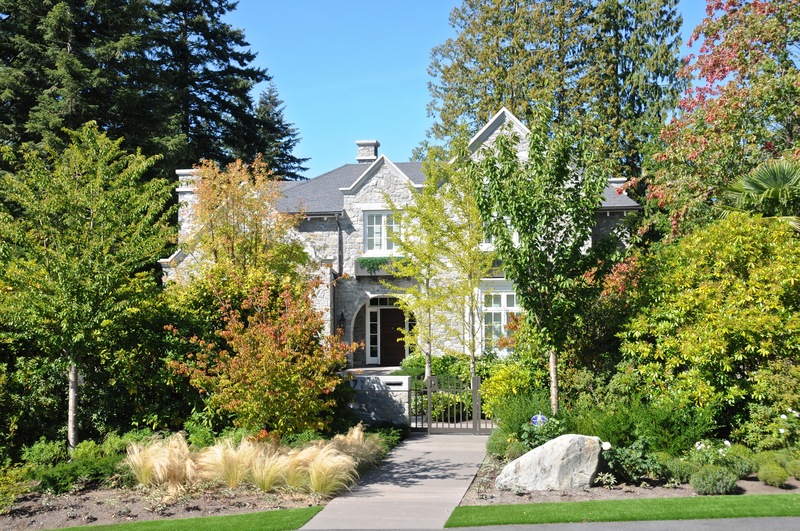 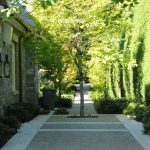 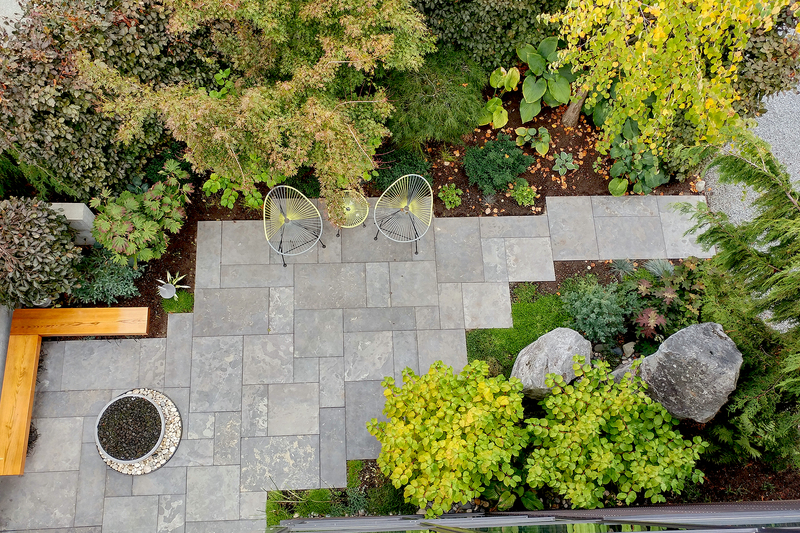 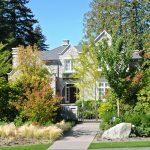 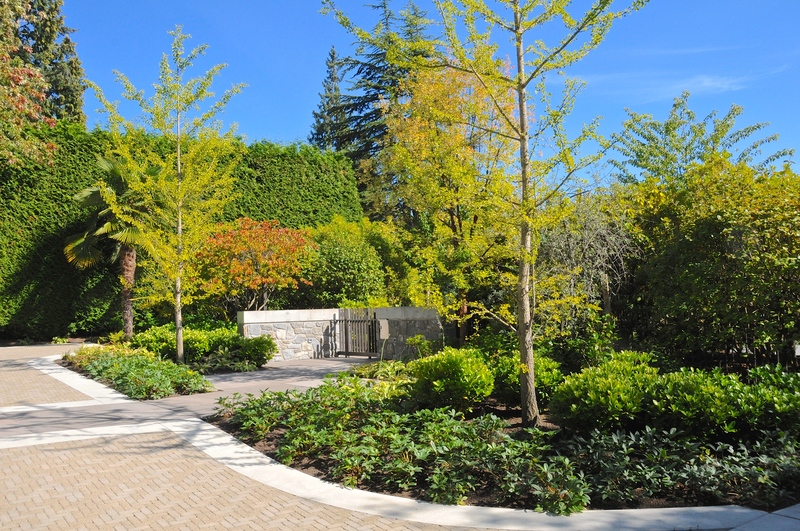 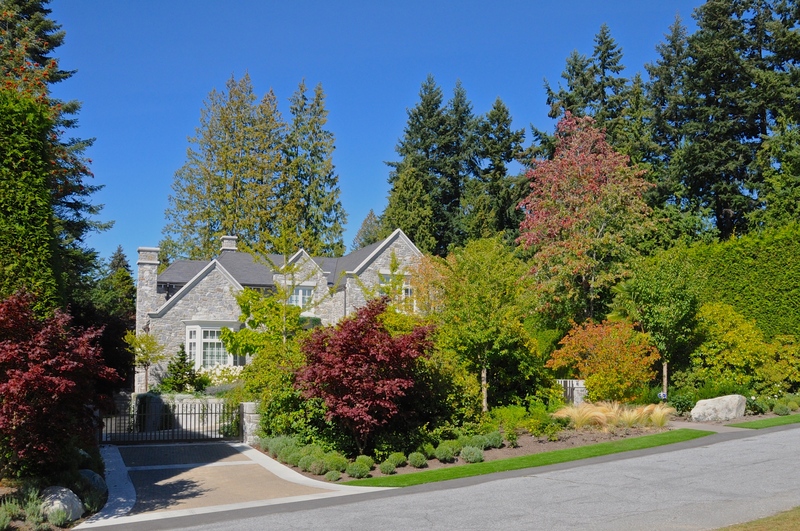 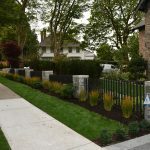 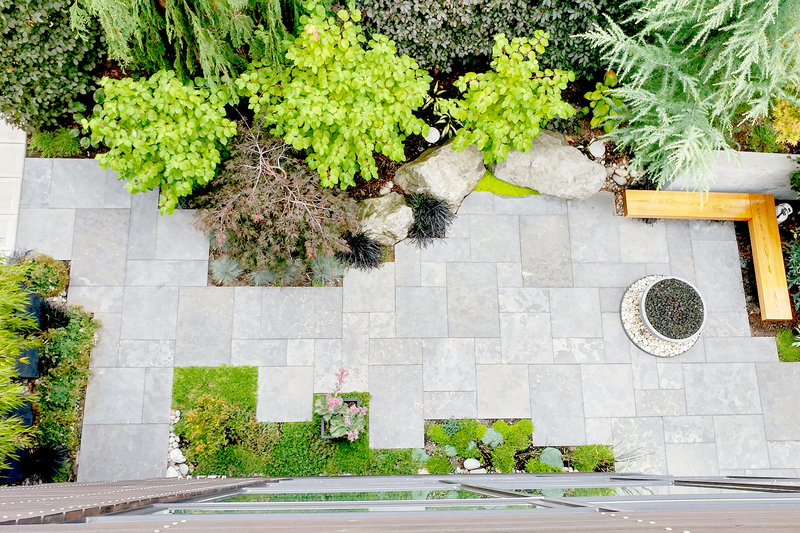 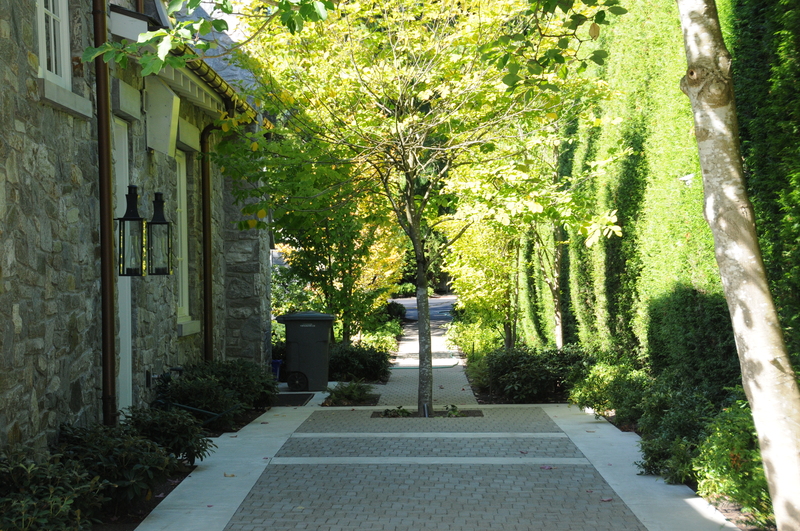 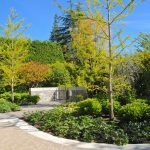 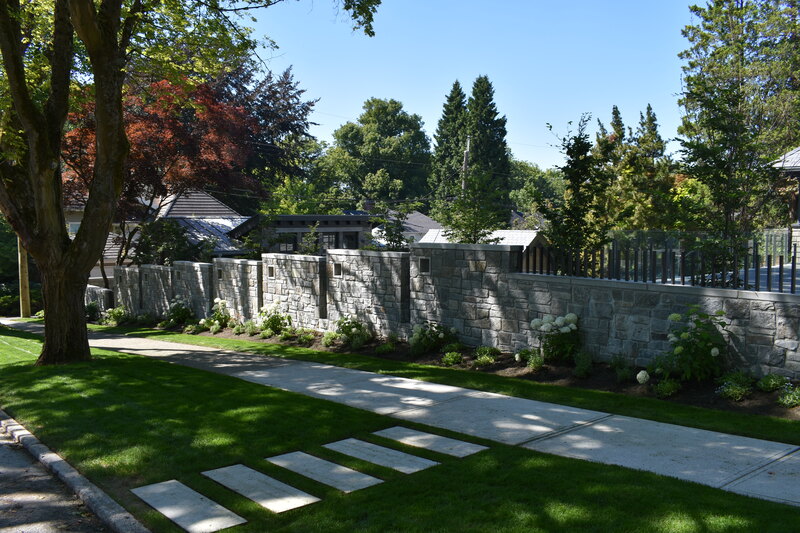 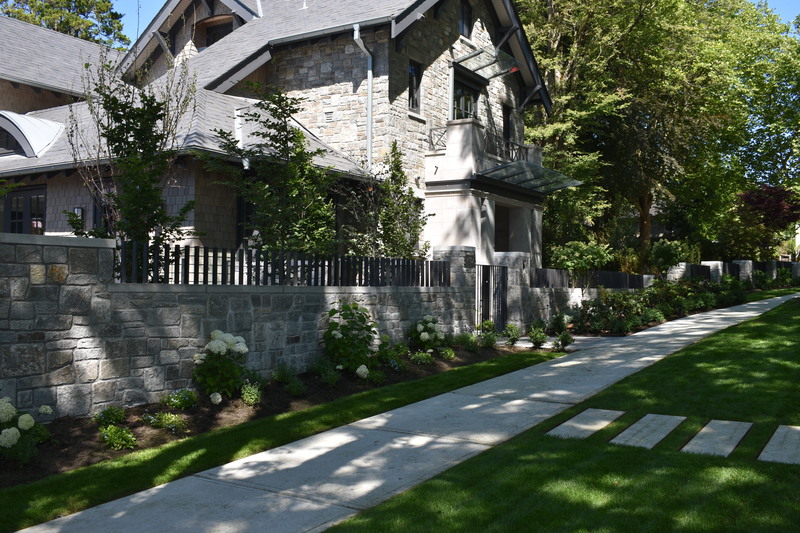 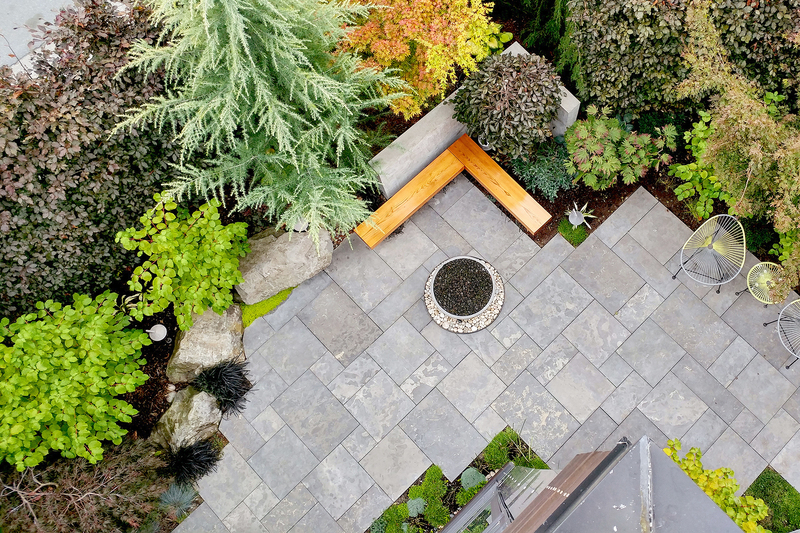 Various plantings include edibles and lawn, combined with pathways and play zones create an array of landscape areas around the renovated residence. 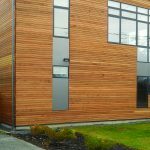 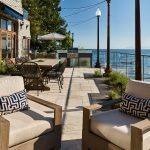 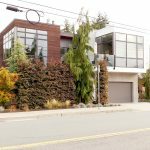 This state-of-the-art modern home is located in White Rock on a corner lot with stunning views of the ocean from the rooftop deck. 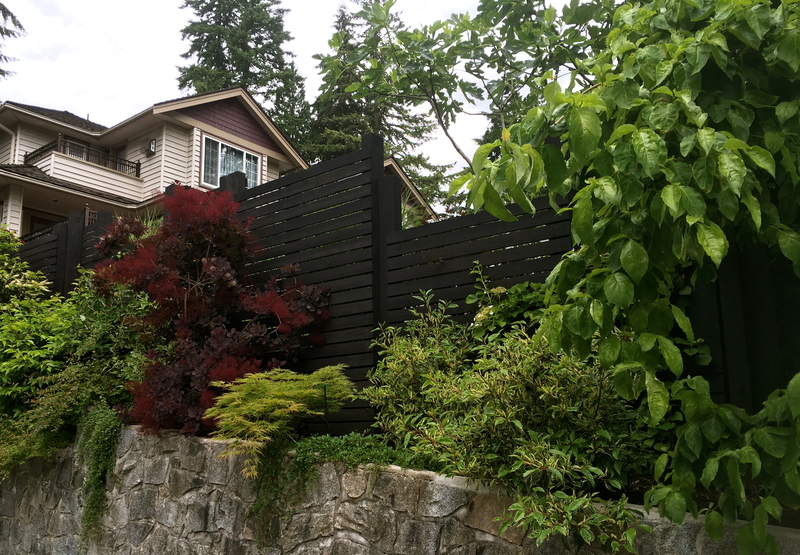 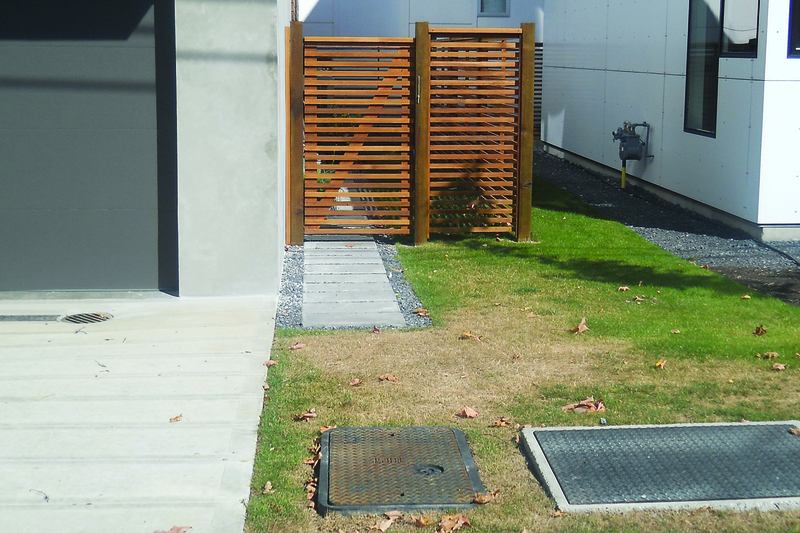 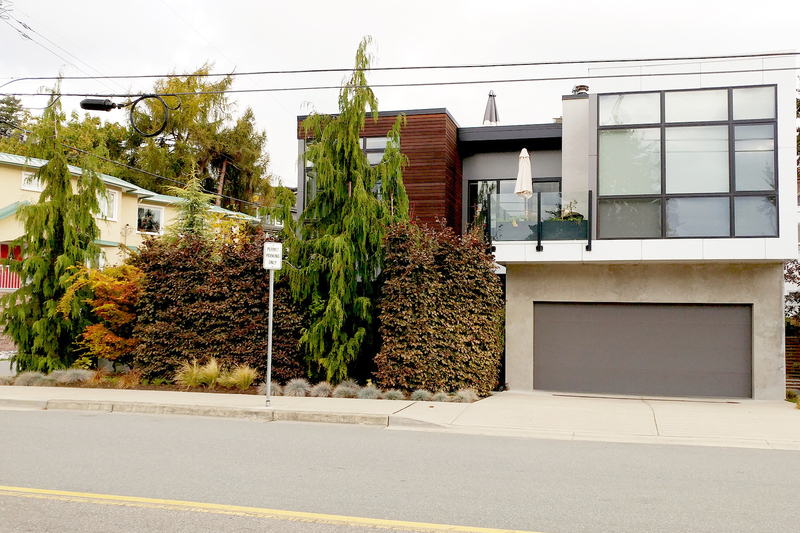 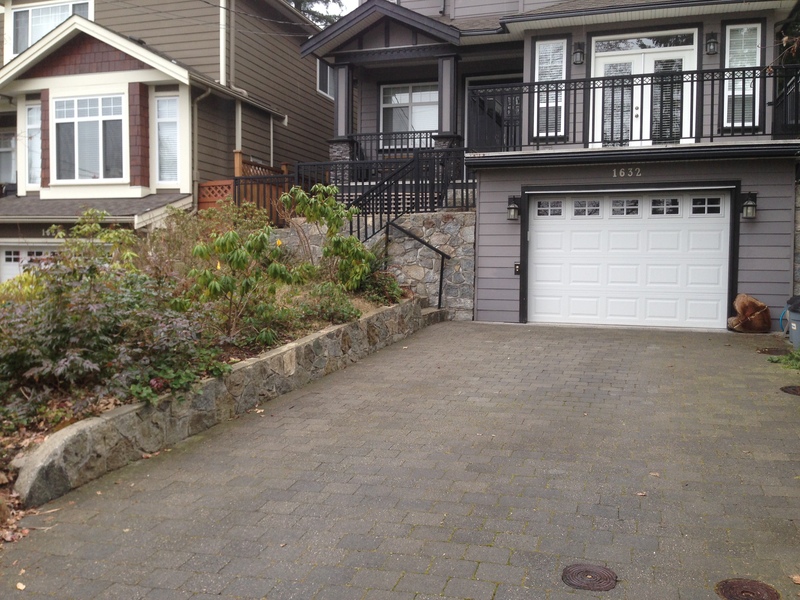 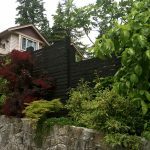 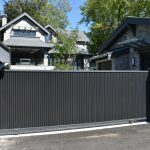 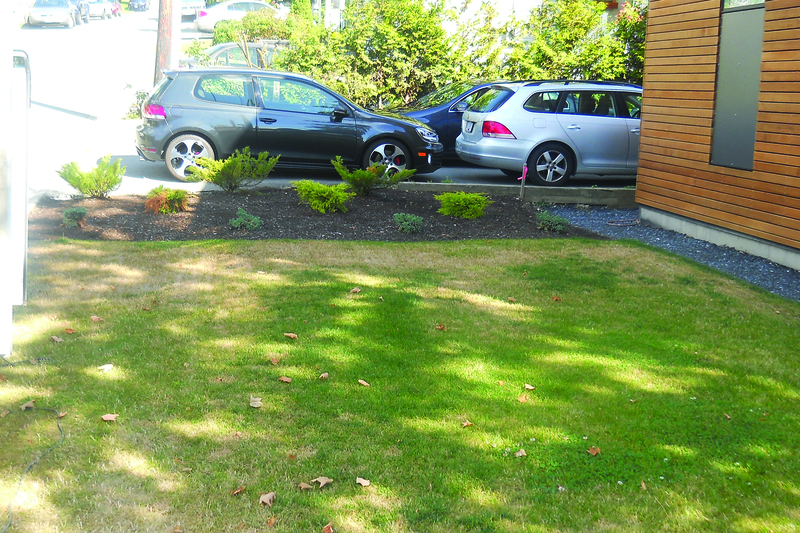 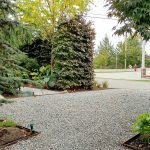 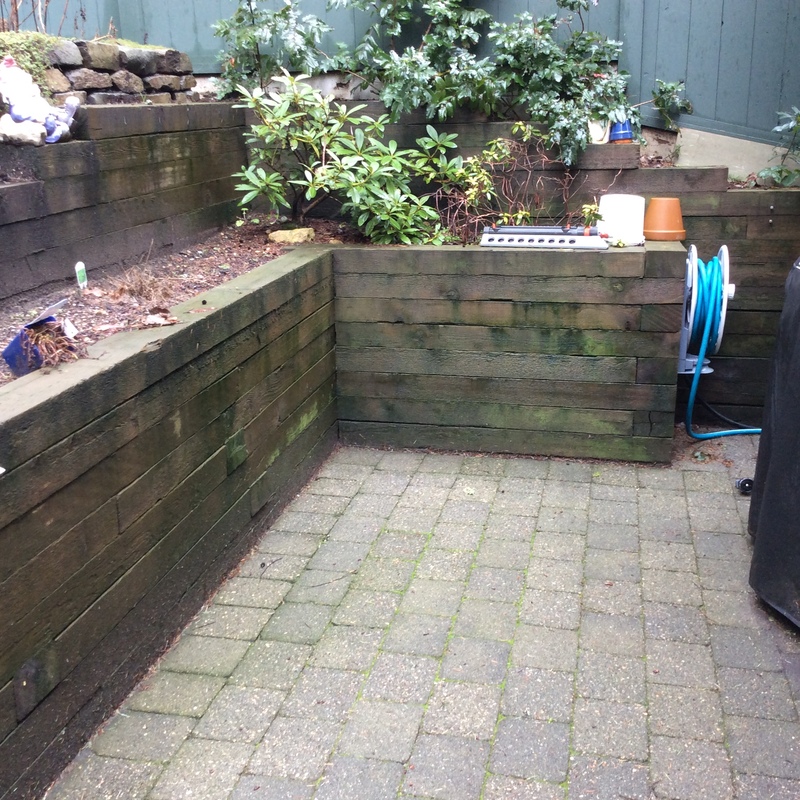 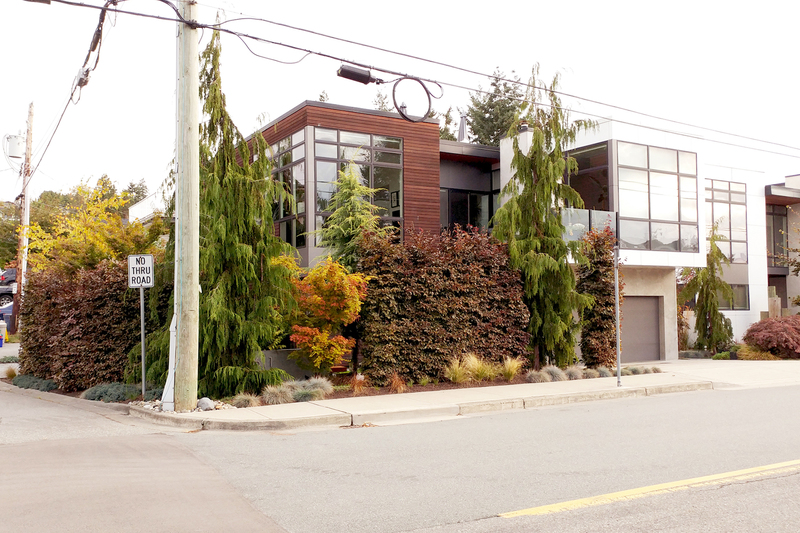 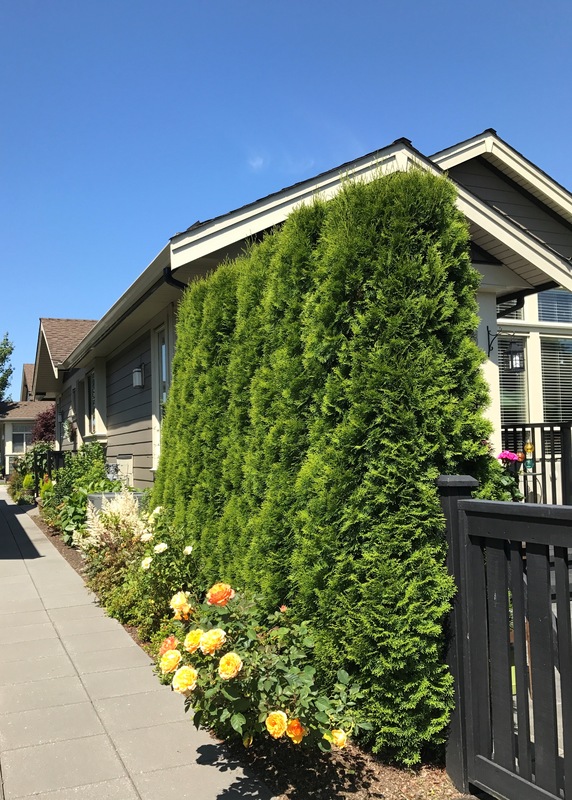 The only yard space bordered both roads, which made privacy an issue. 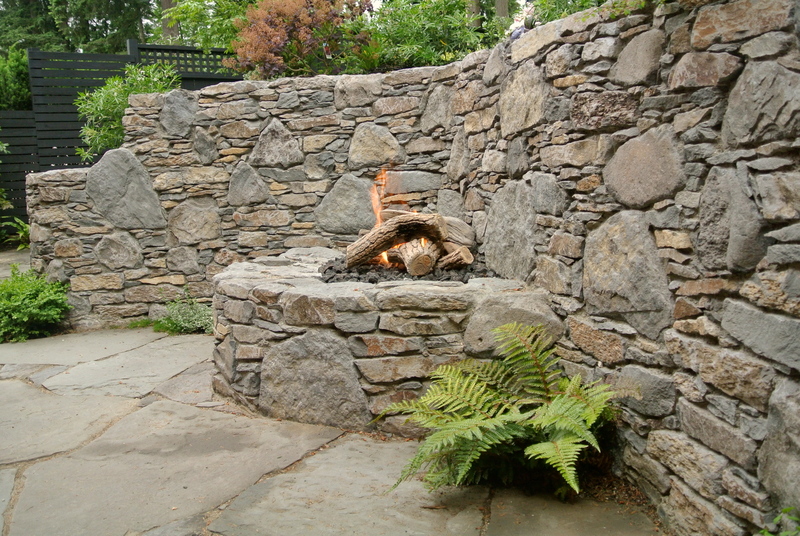 The landscape had to be interesting and unique, functional and offer privacy on all sides. 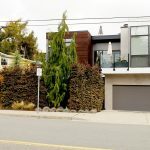 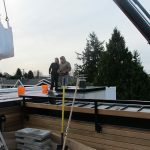 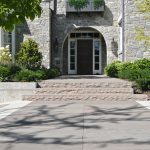 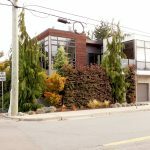 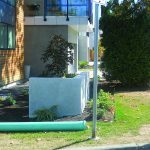 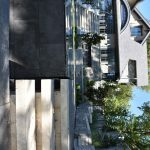 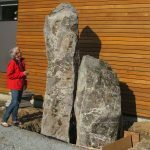 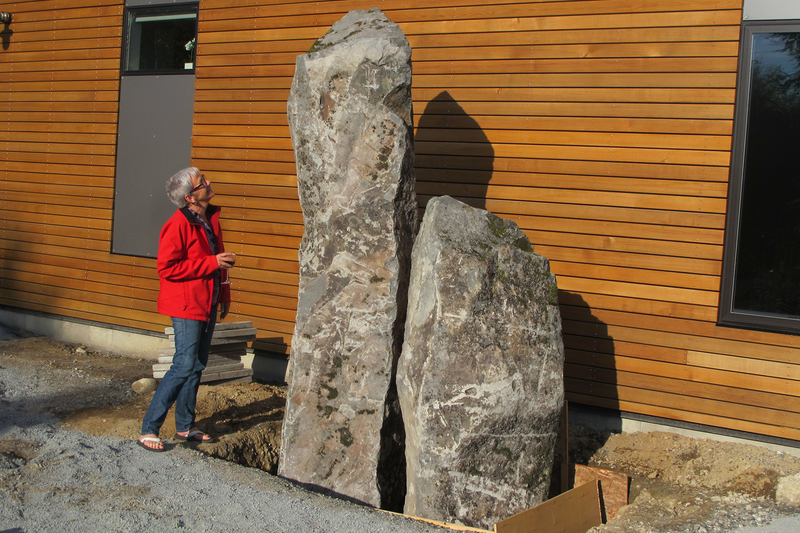 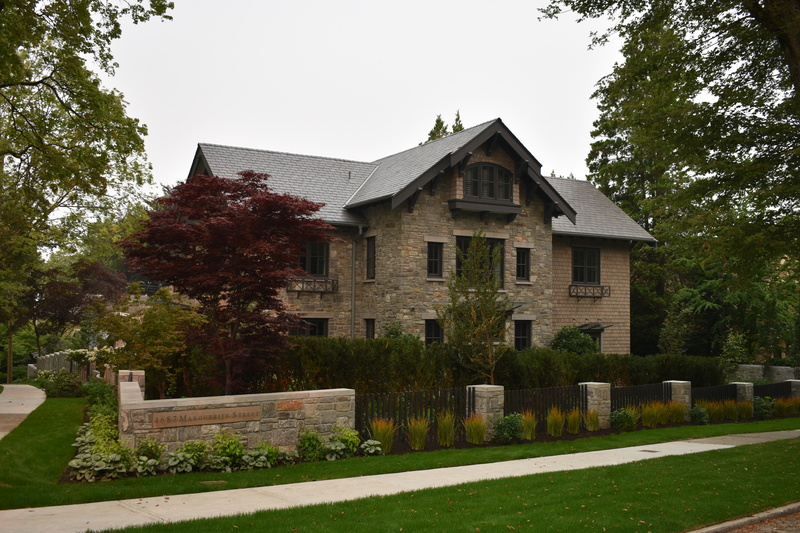 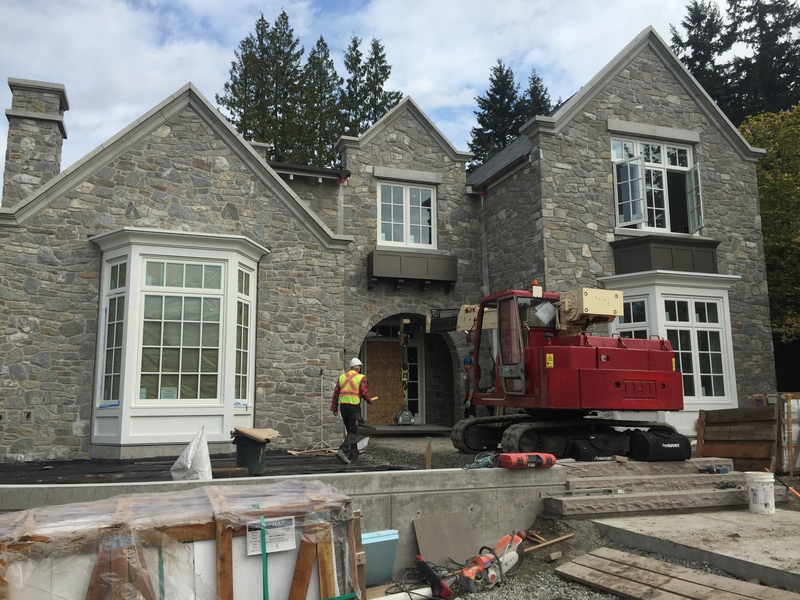 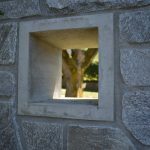 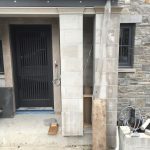 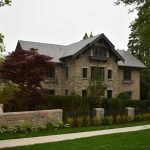 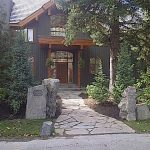 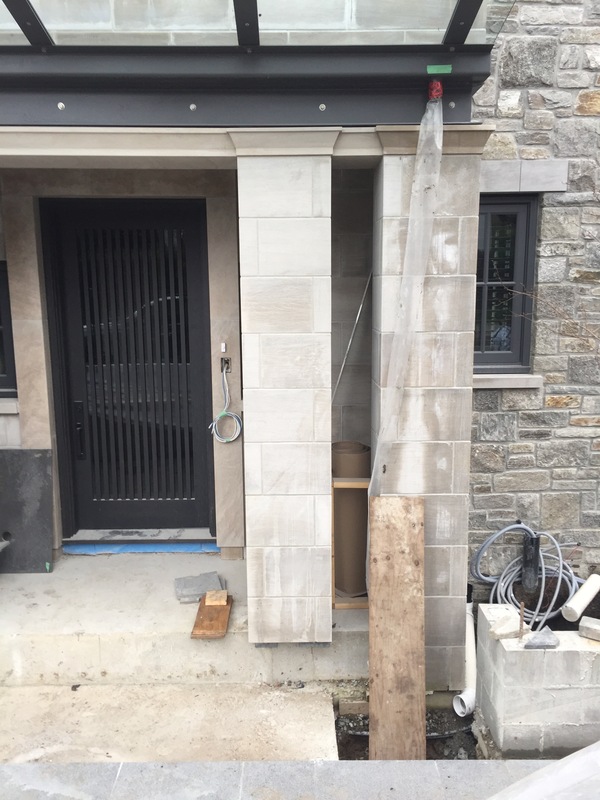 Some of the more prominent features include two massive pillar stones, a Birken Limestone wrap-around patio, Beech tree hedges and a 900 sf green roof. 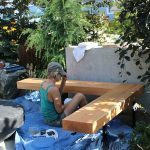 The client wanted something beautiful to look down on and also wanted to give her grandchildren a safe and interesting place to play. 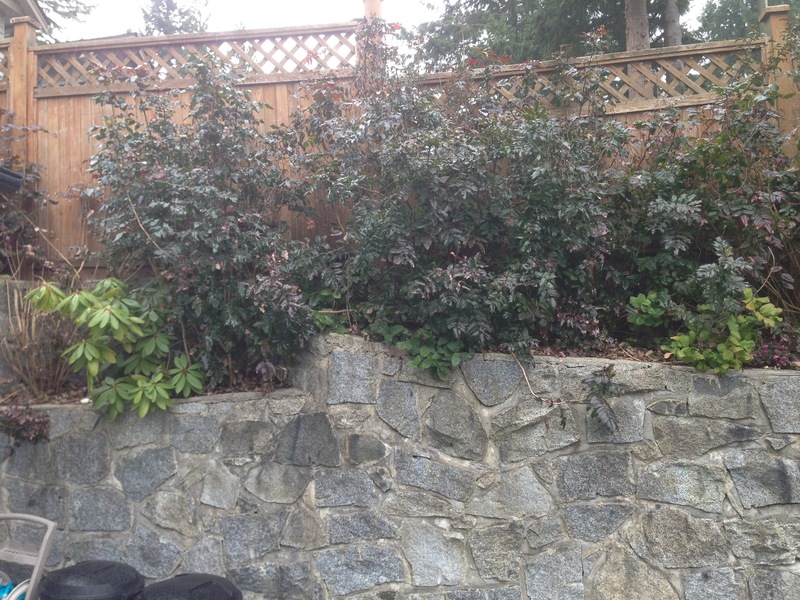 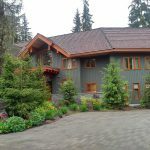 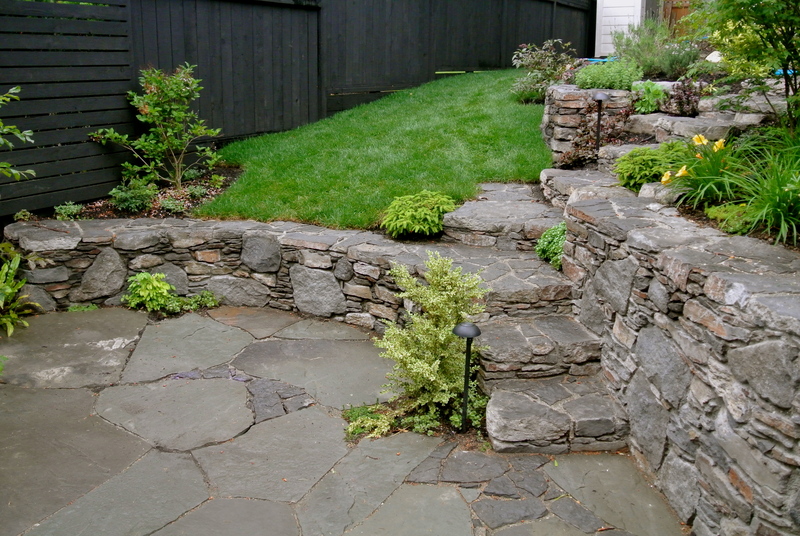 The builder of the house did the original landscaping for the owner. 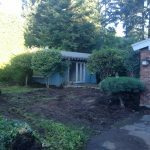 It was not what the owner expected. 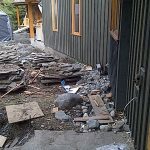 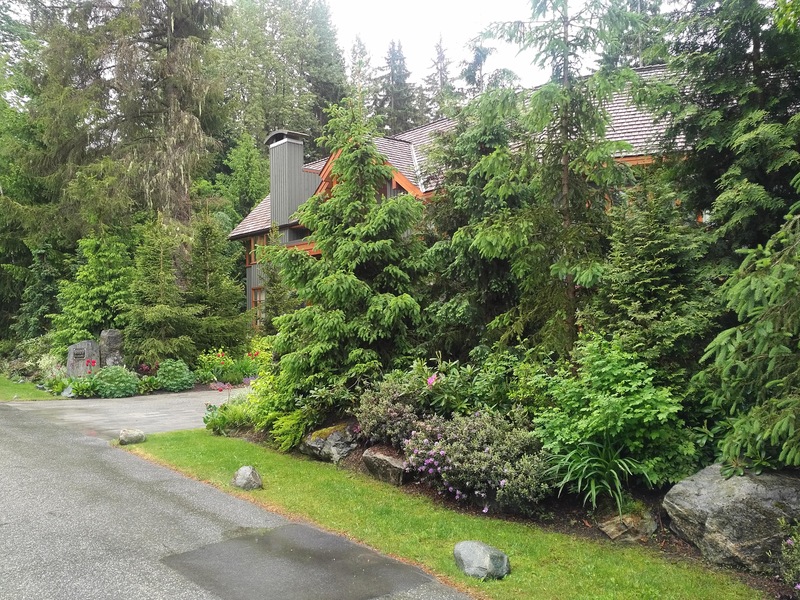 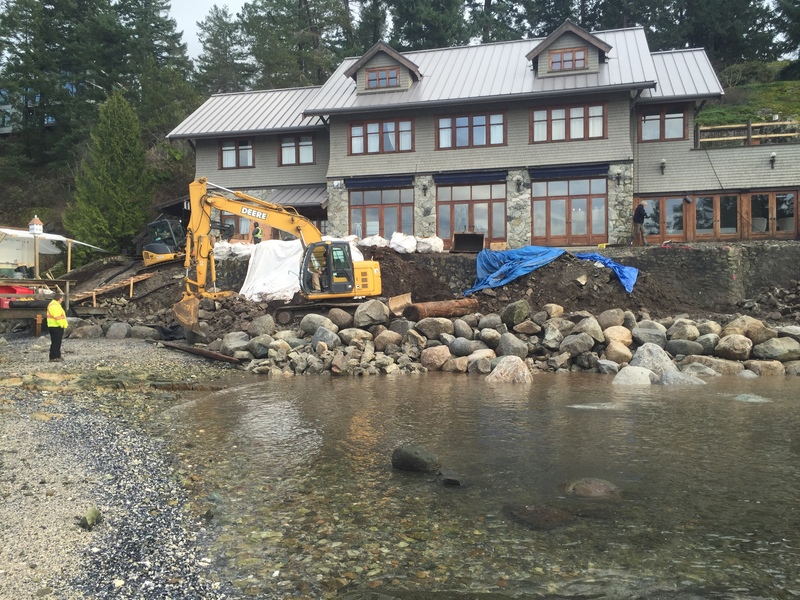 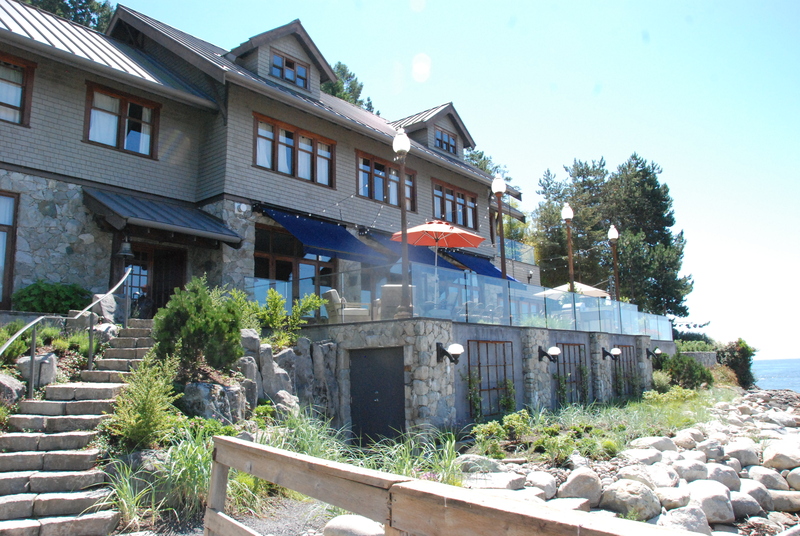 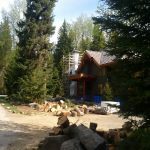 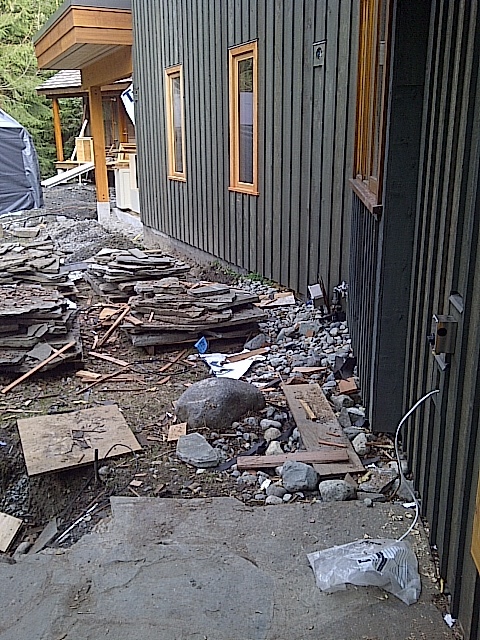 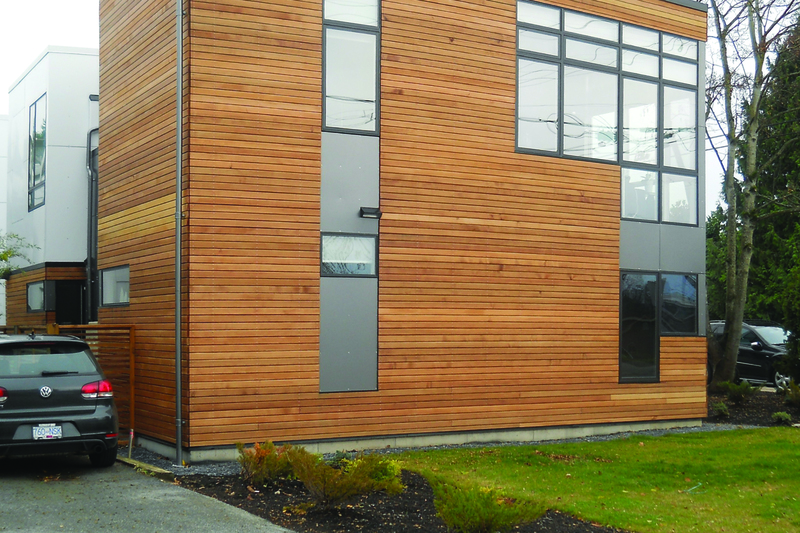 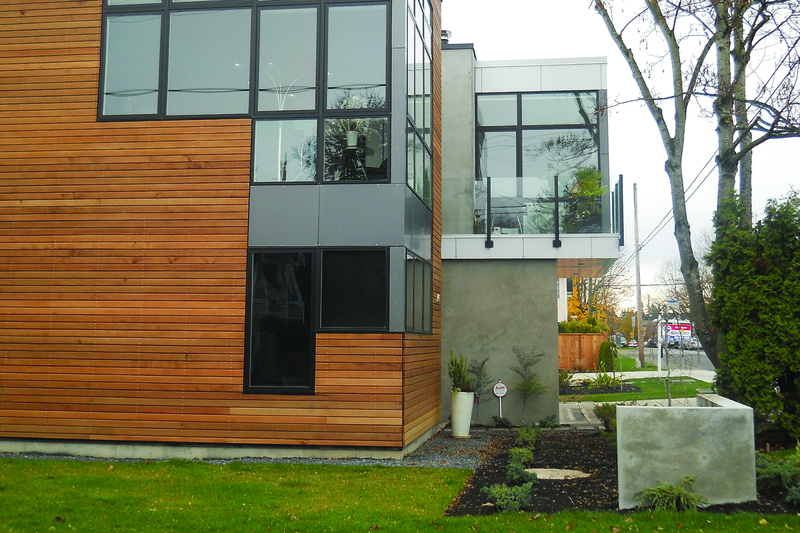 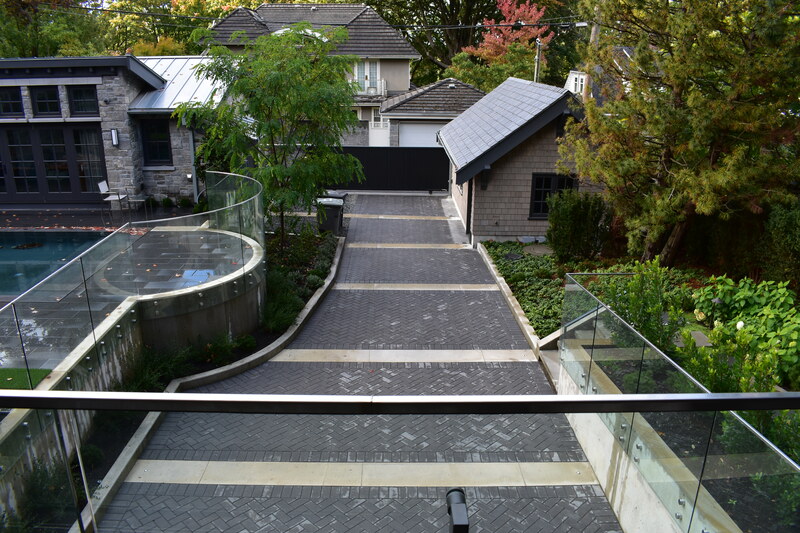 He approached Landscape 2000 Ltd. to review and present a plan to reconstruct the property. 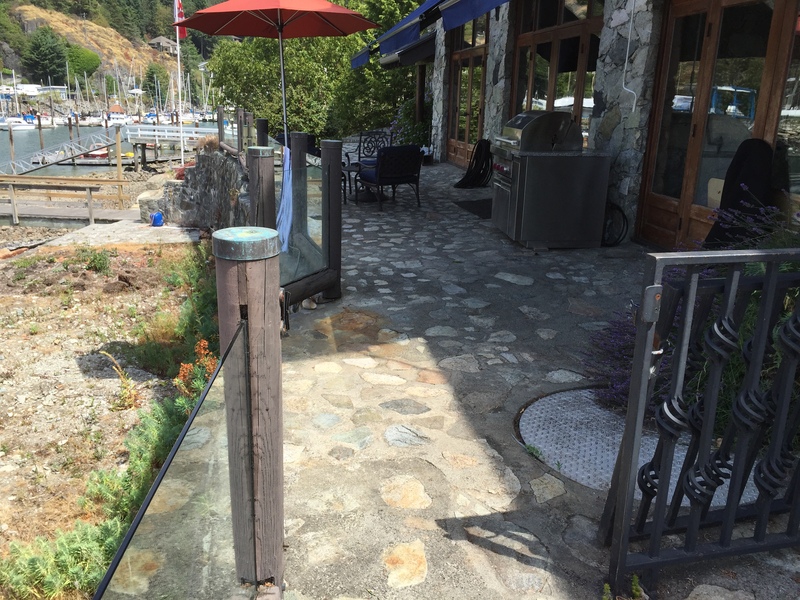 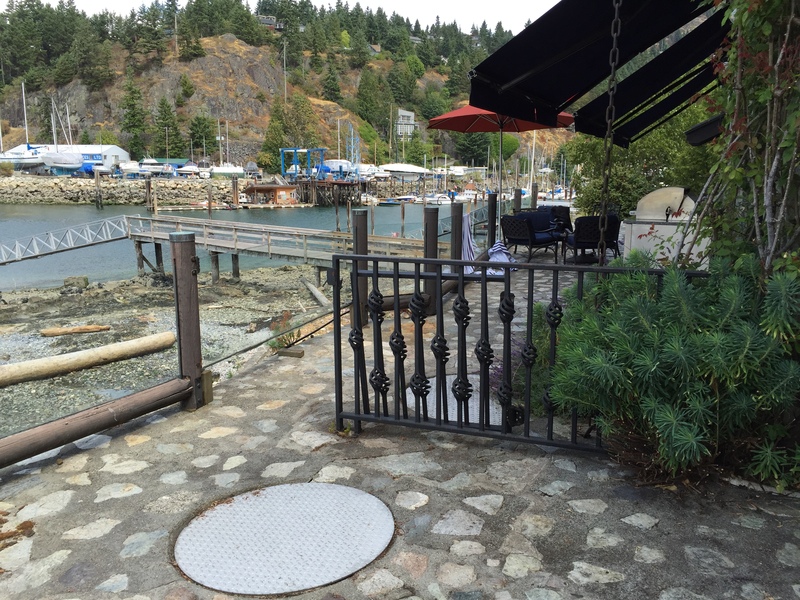 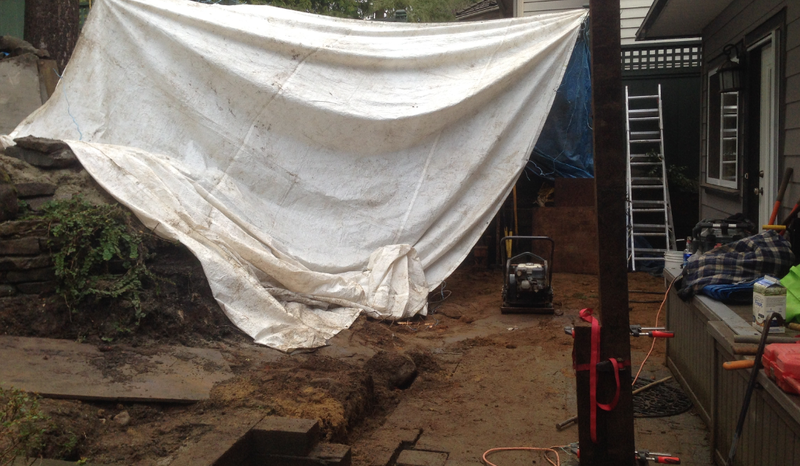 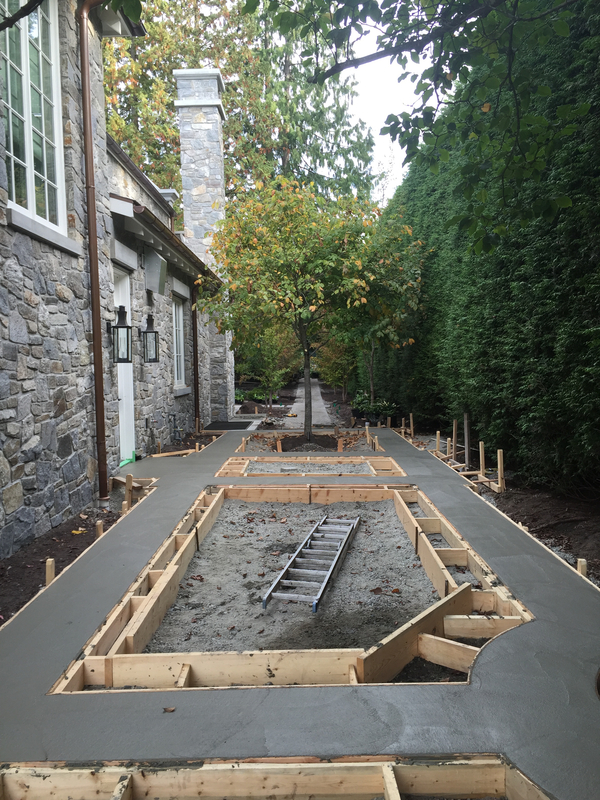 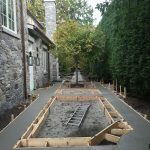 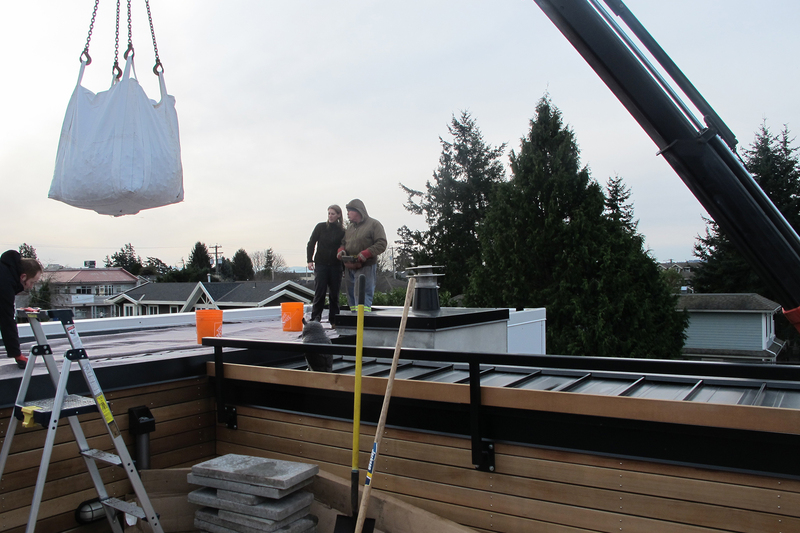 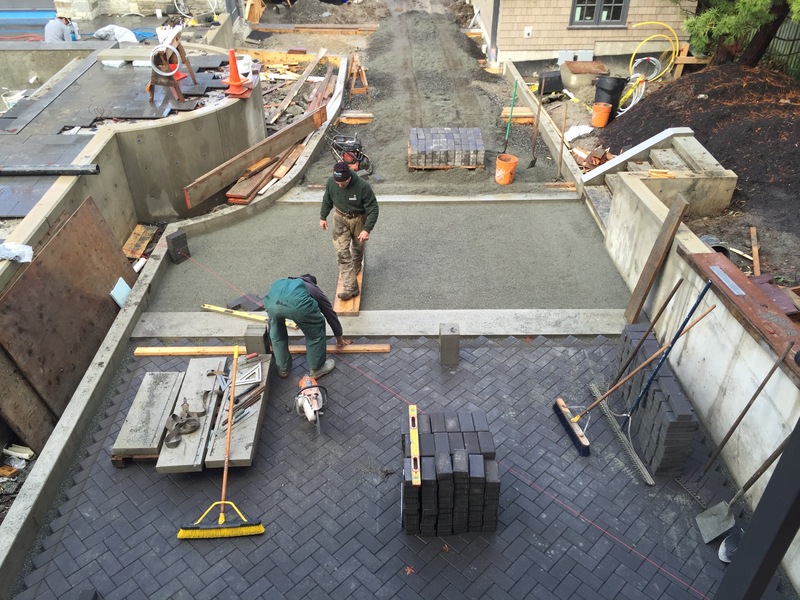 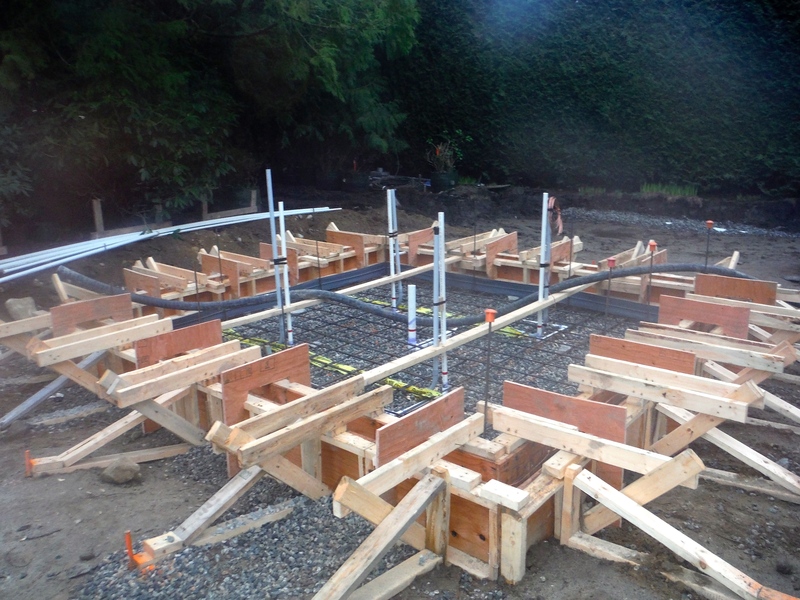 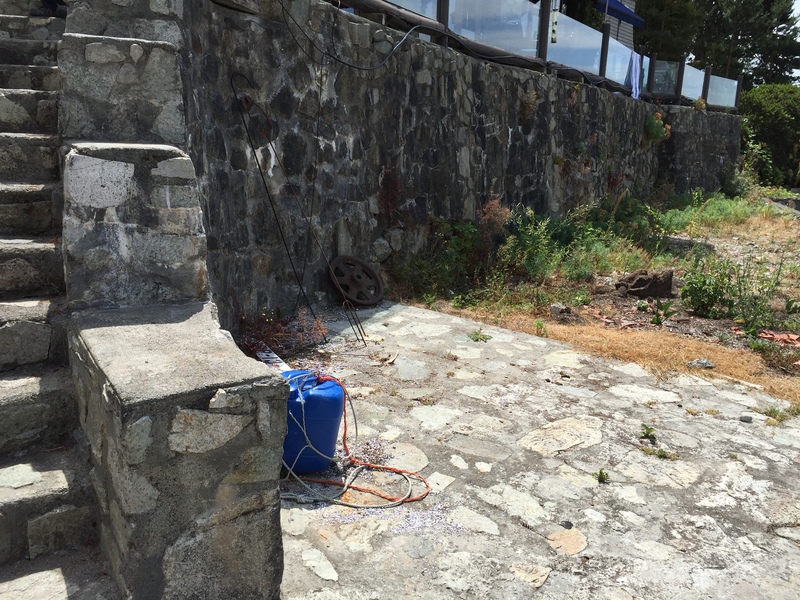 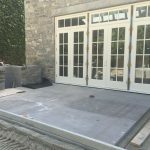 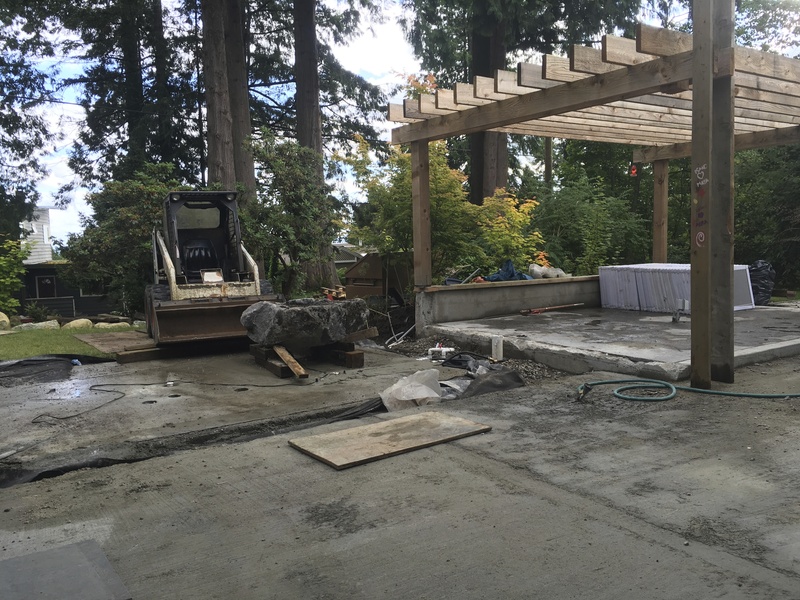 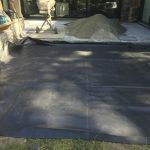 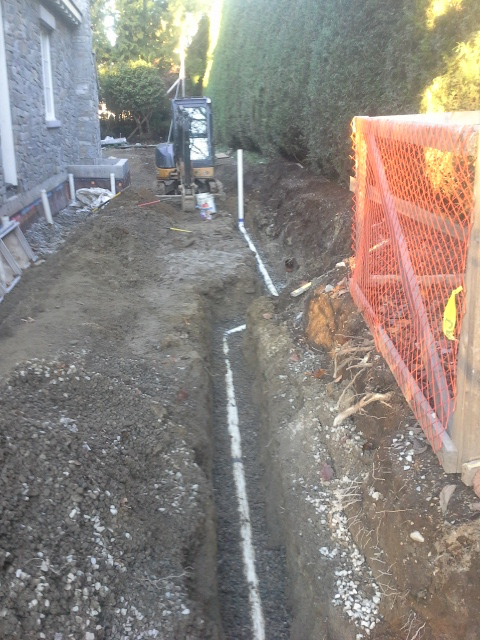 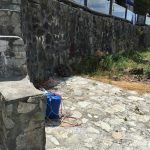 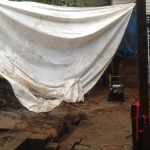 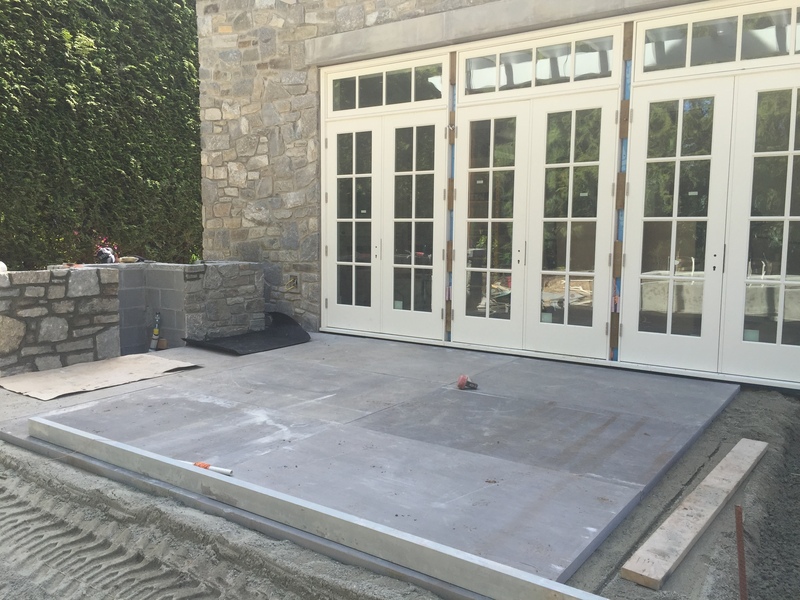 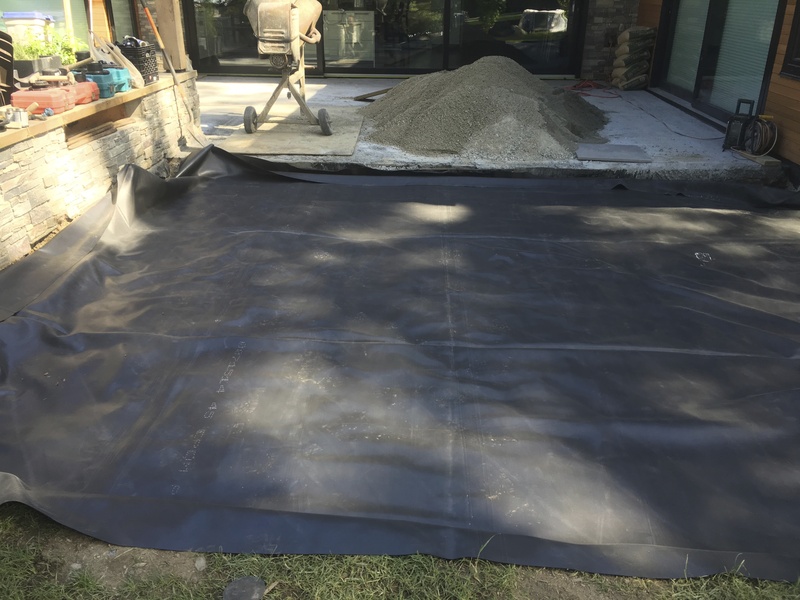 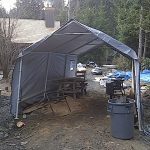 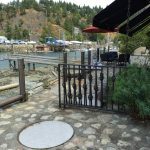 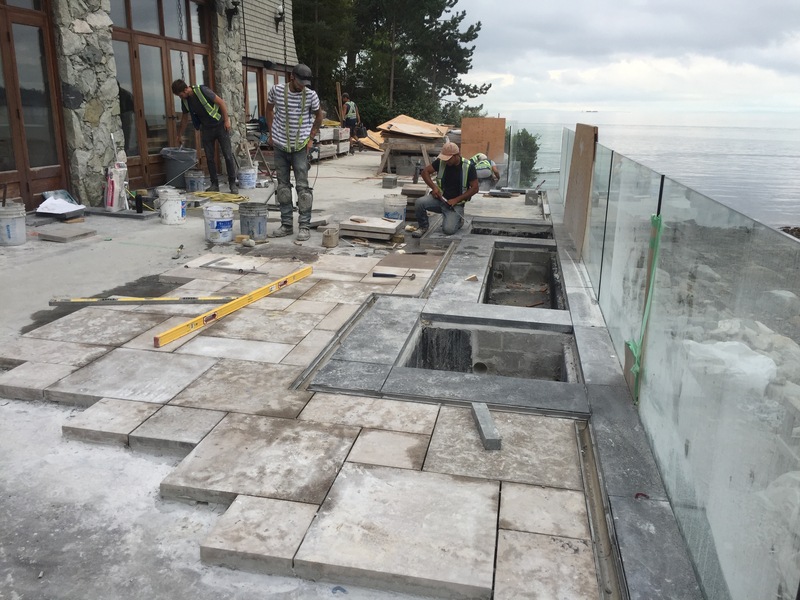 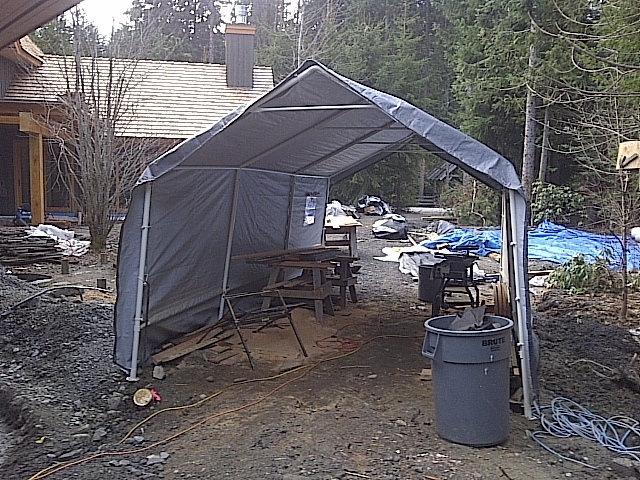 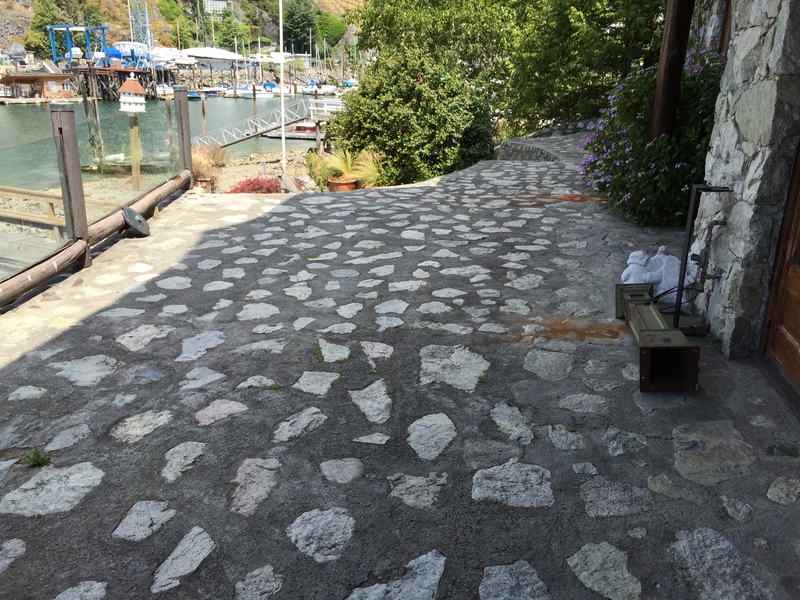 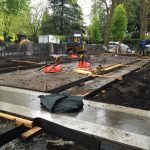 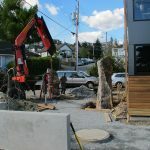 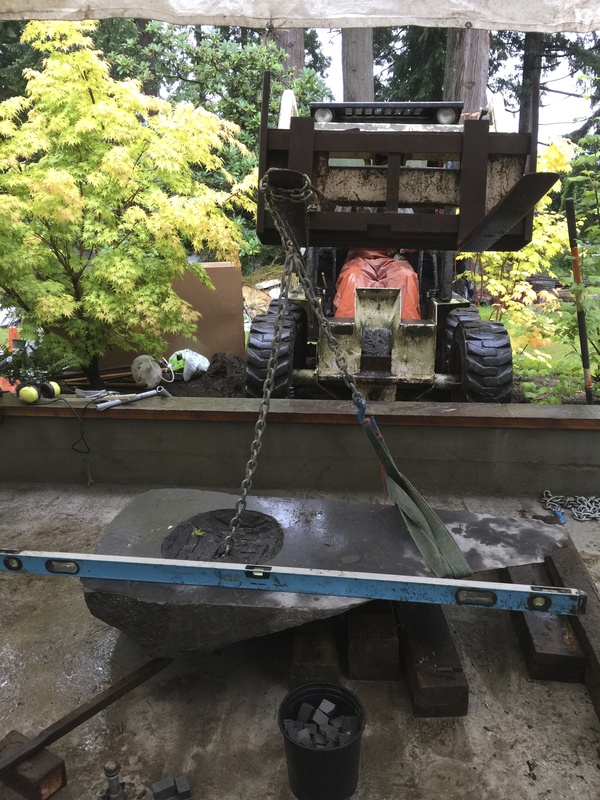 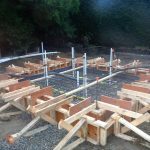 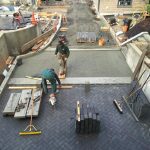 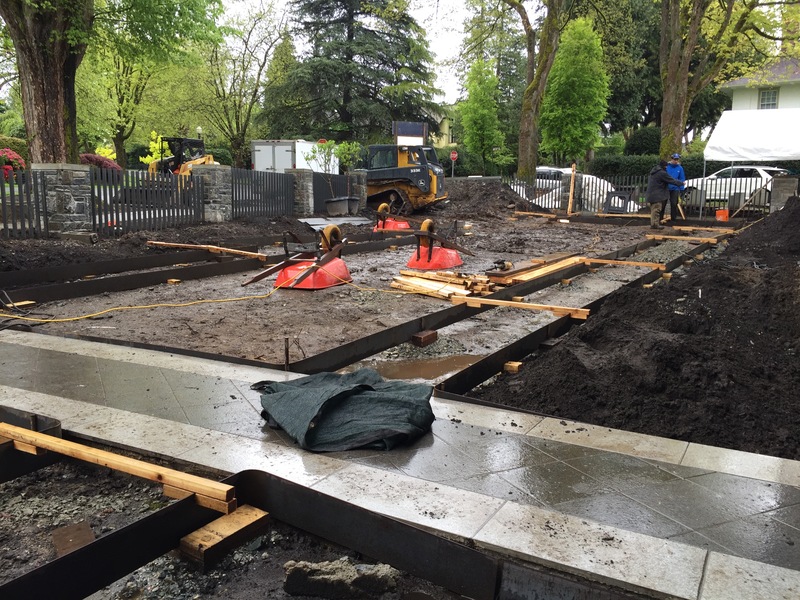 There were some structural challenges such as an uneven concrete patio slab. 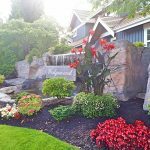 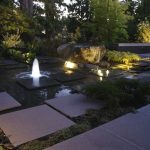 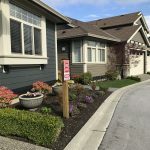 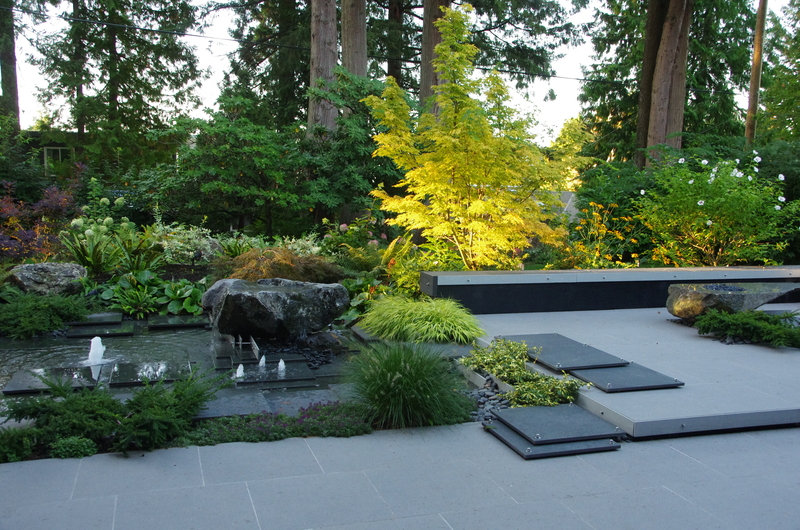 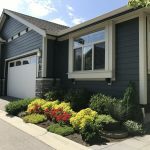 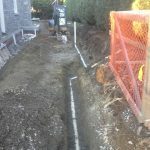 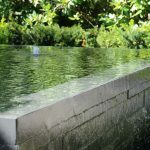 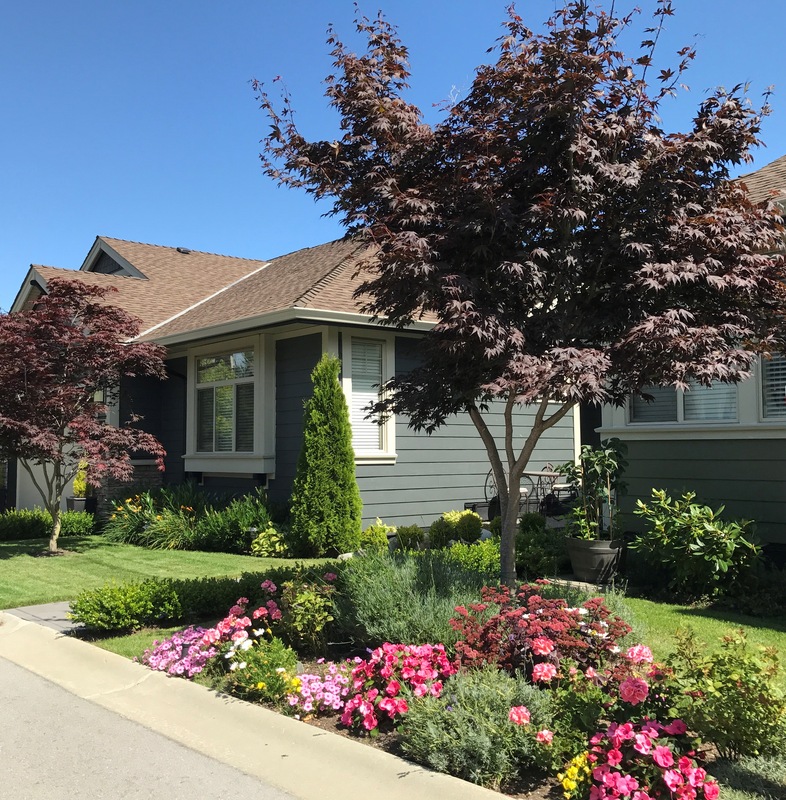 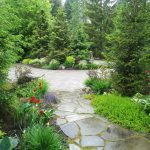 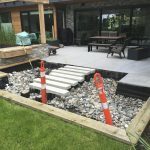 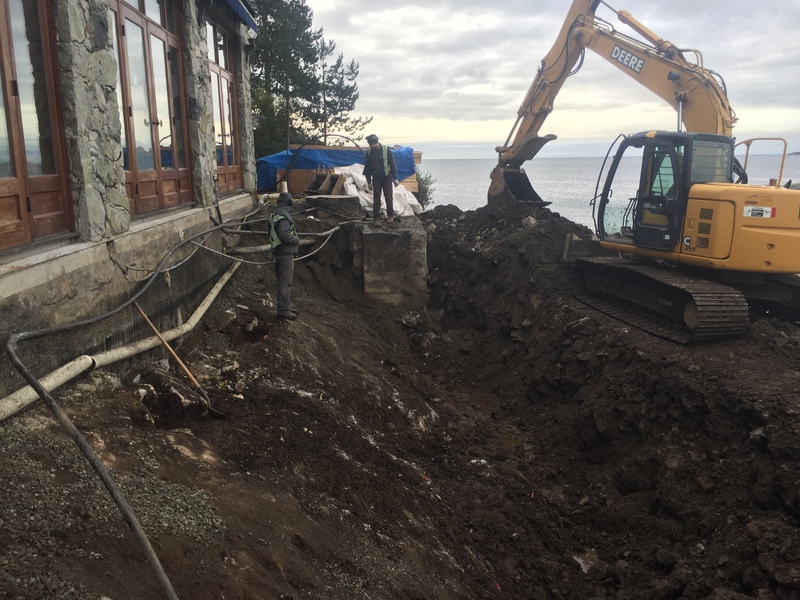 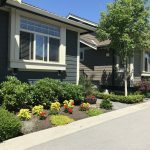 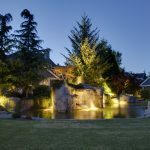 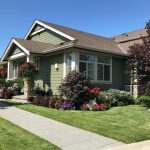 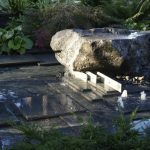 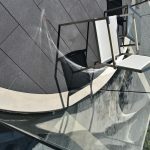 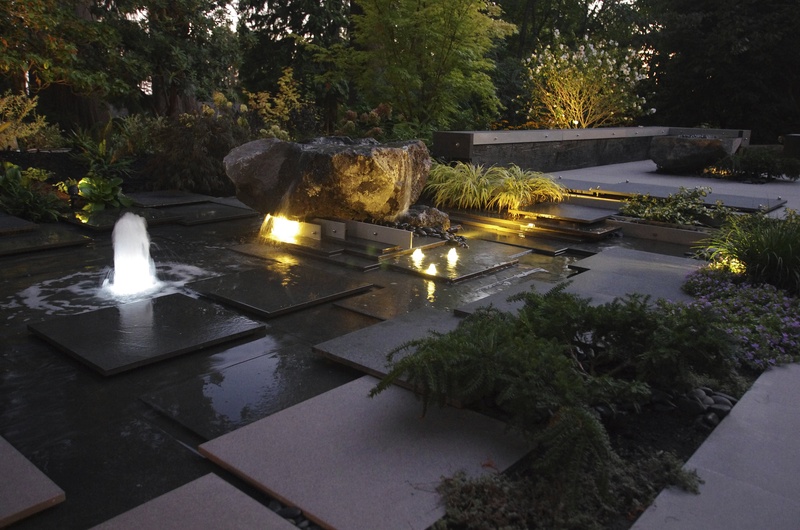 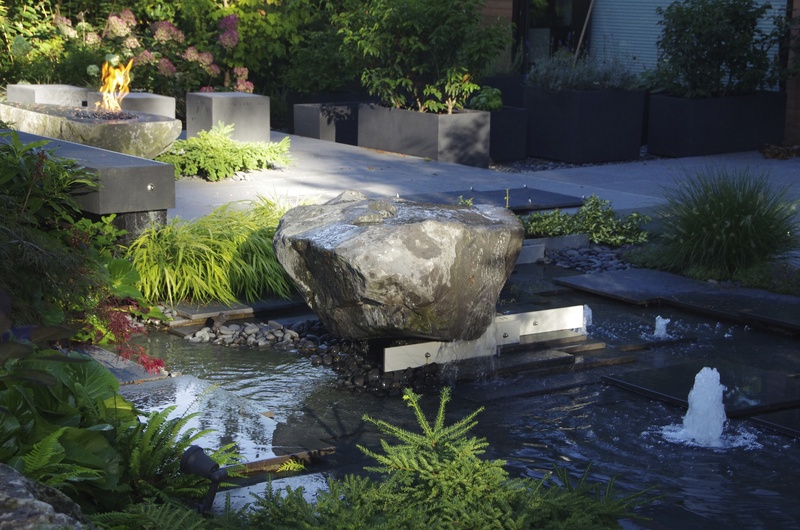 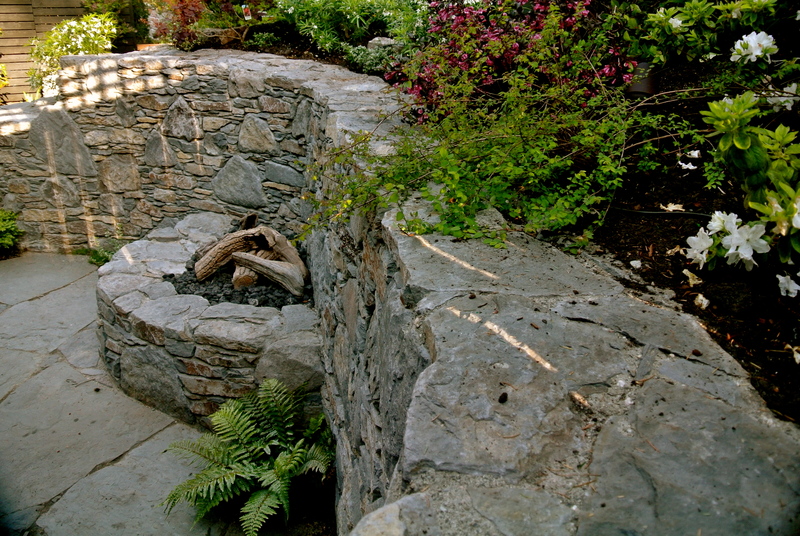 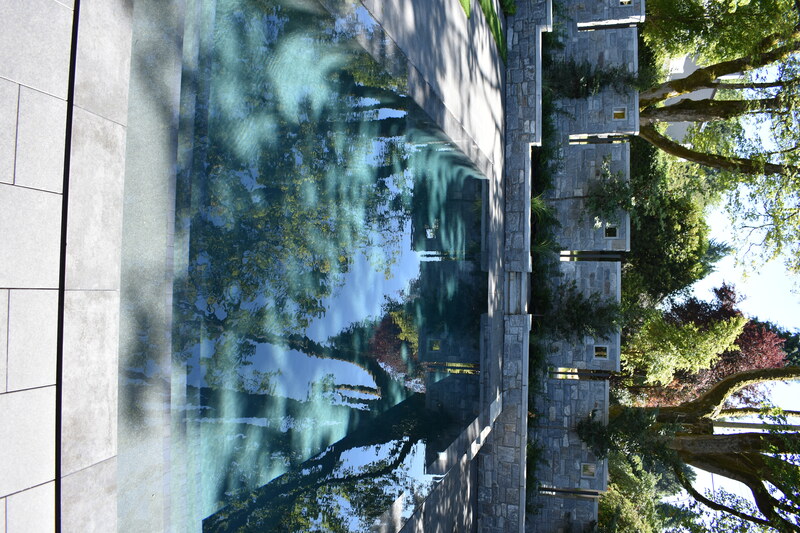 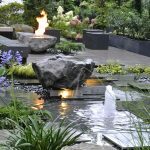 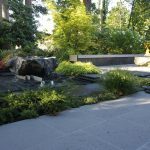 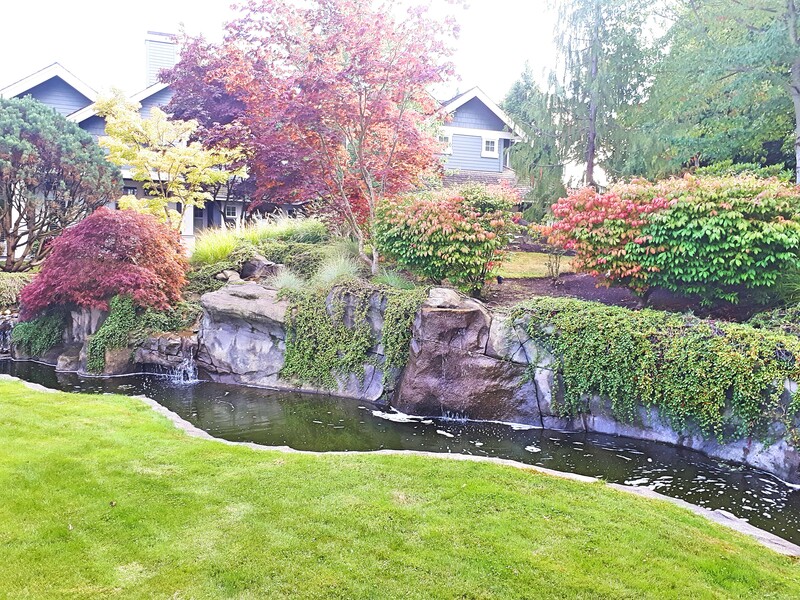 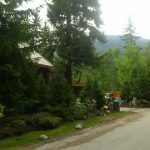 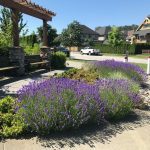 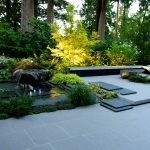 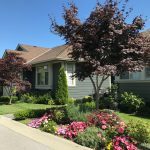 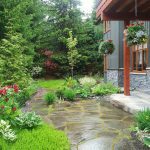 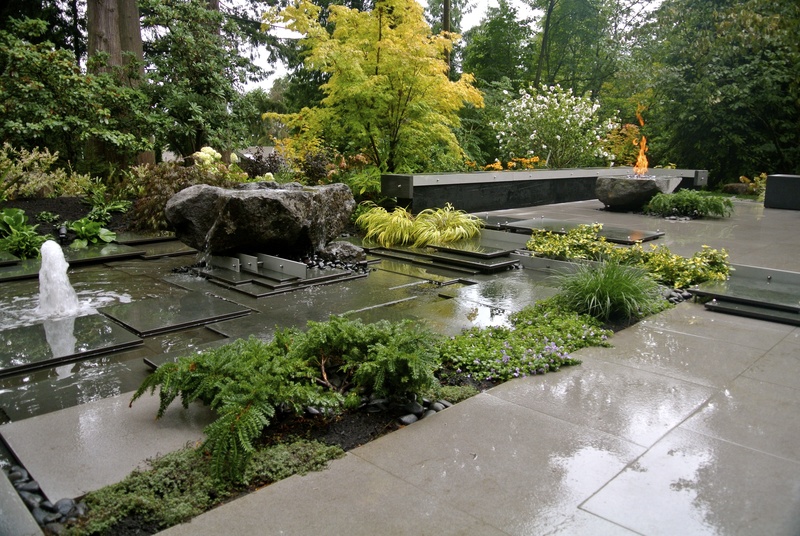 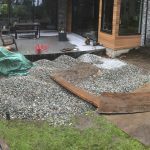 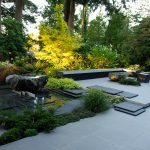 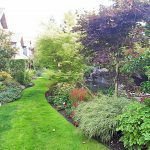 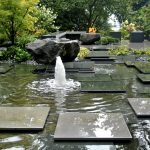 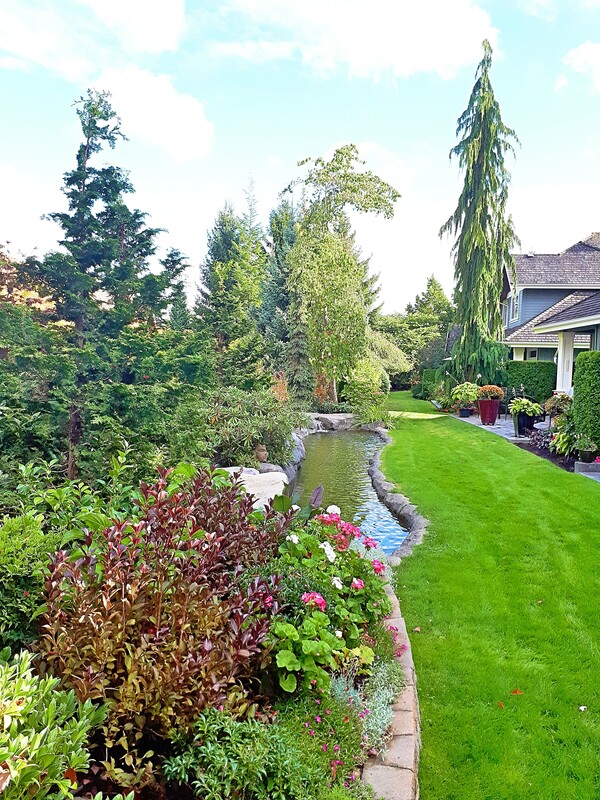 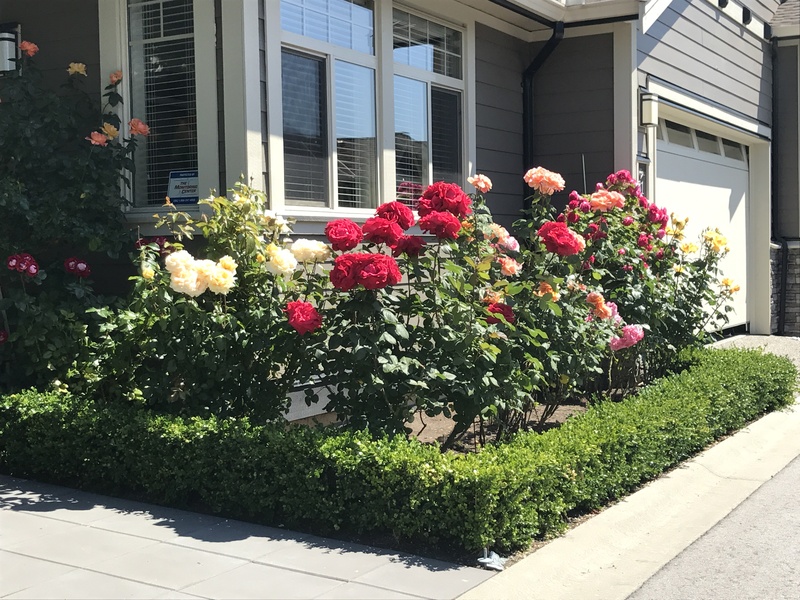 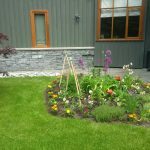 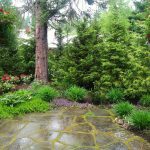 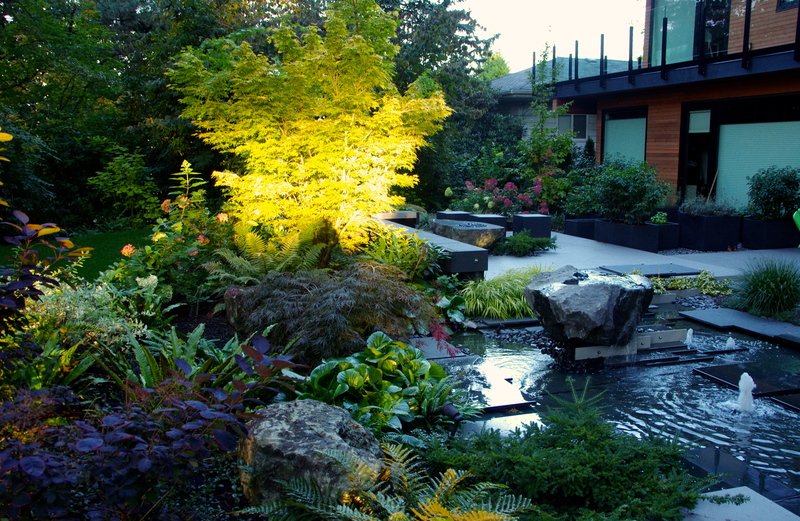 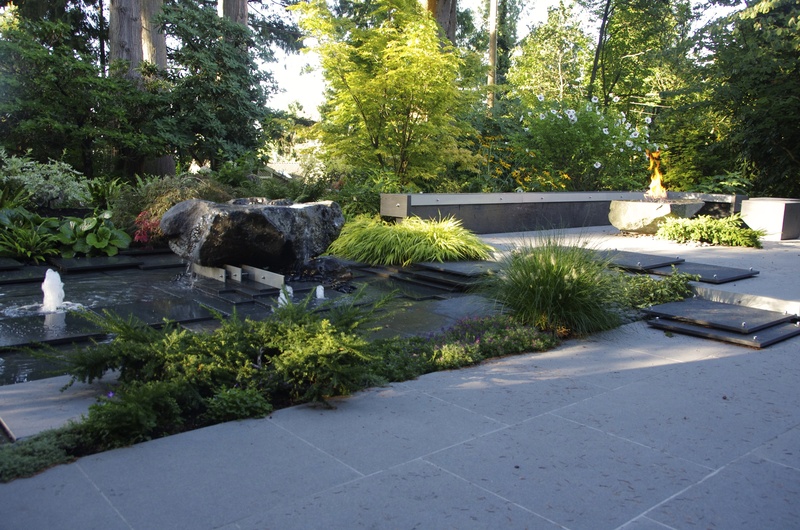 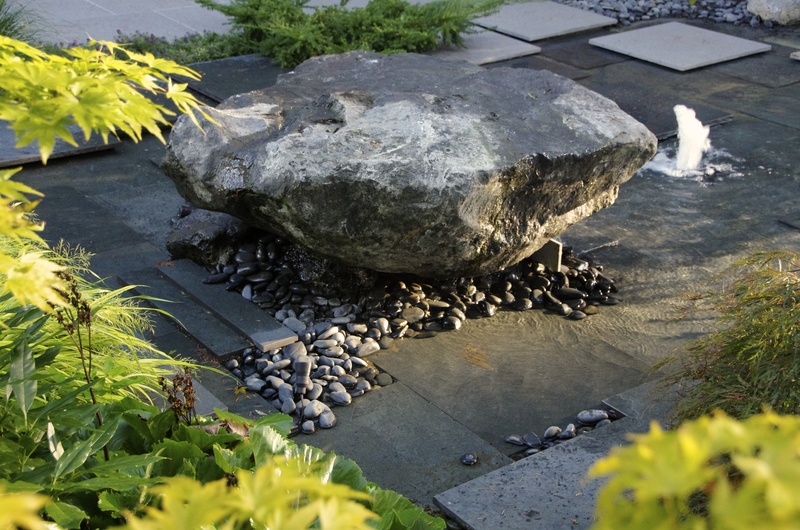 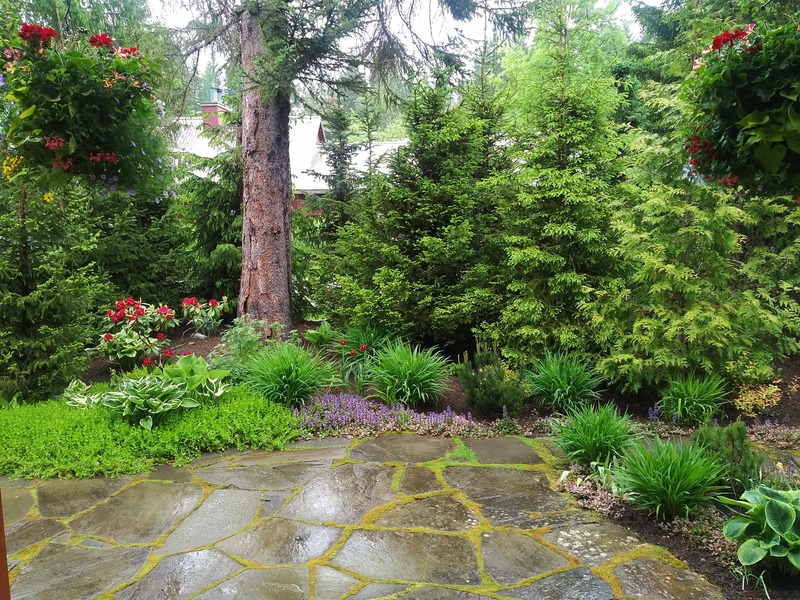 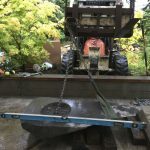 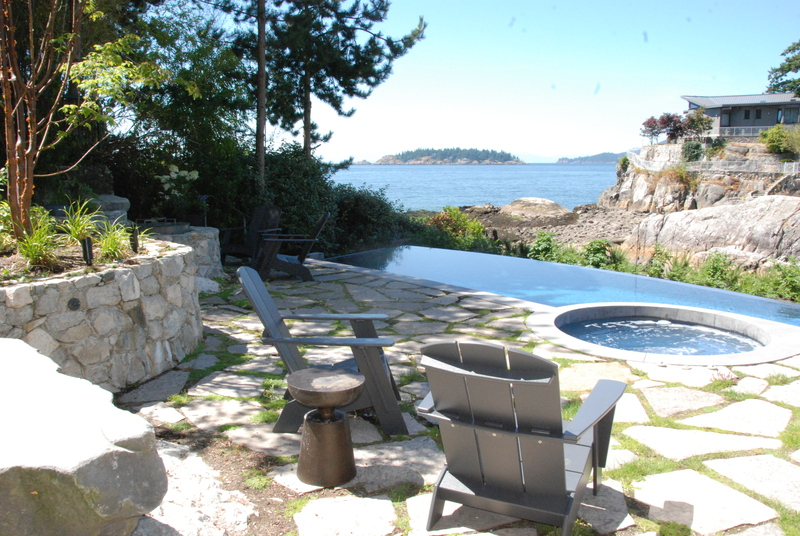 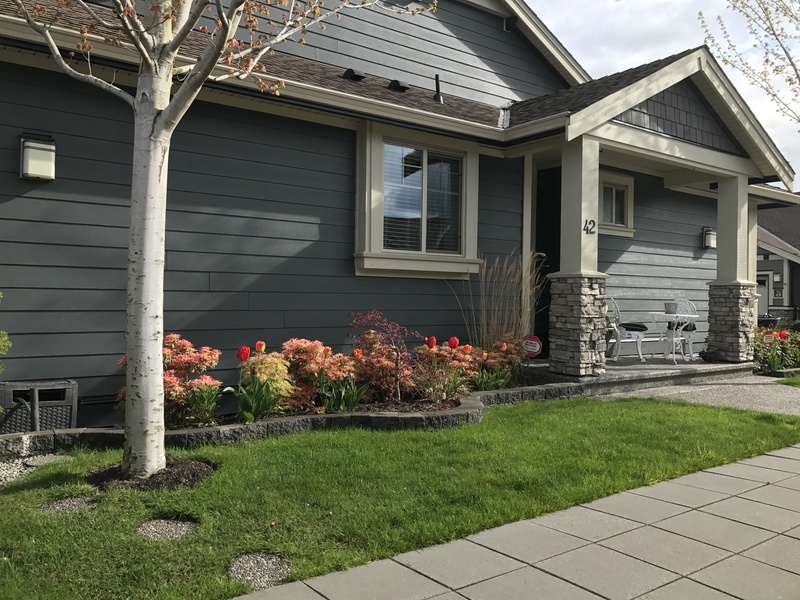 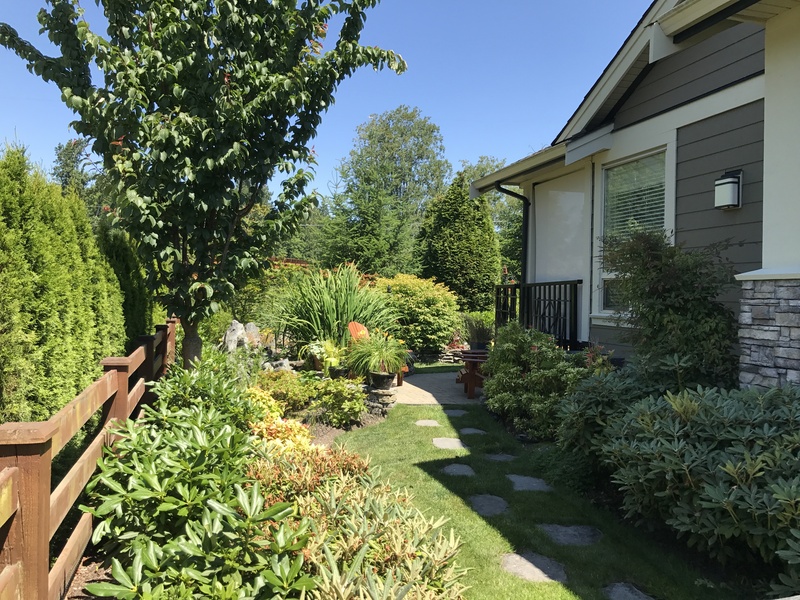 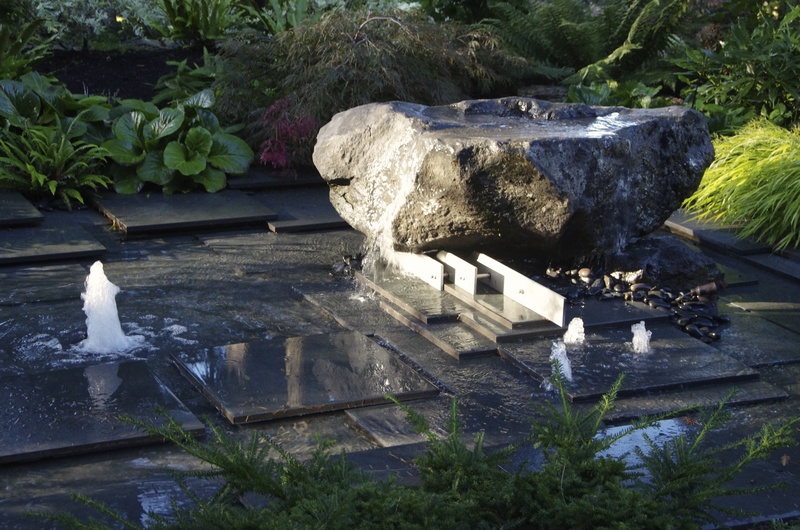 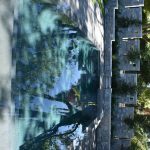 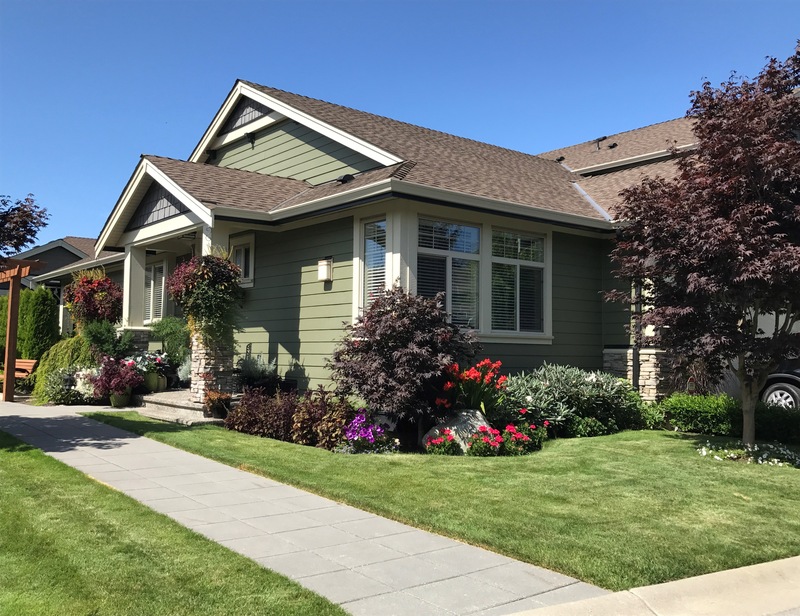 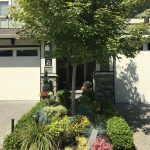 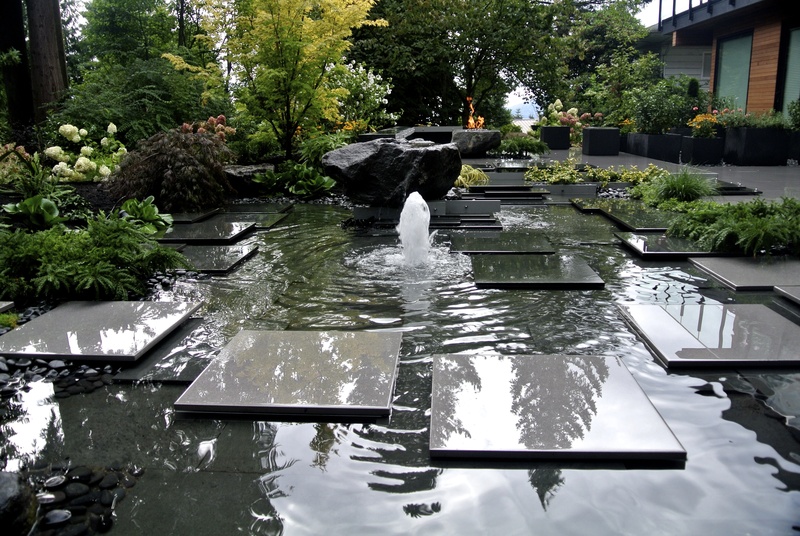 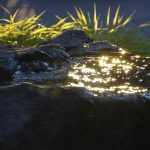 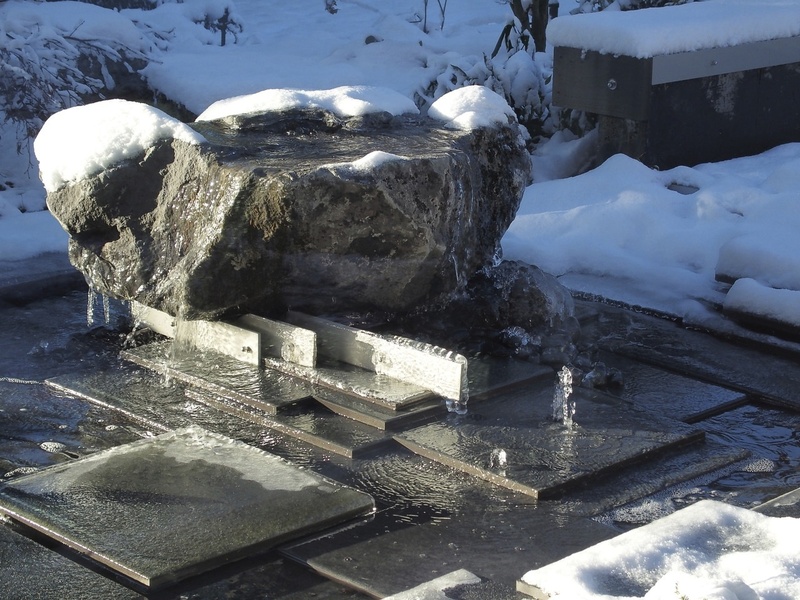 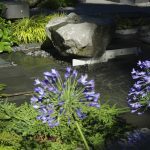 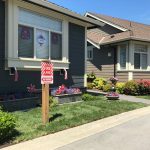 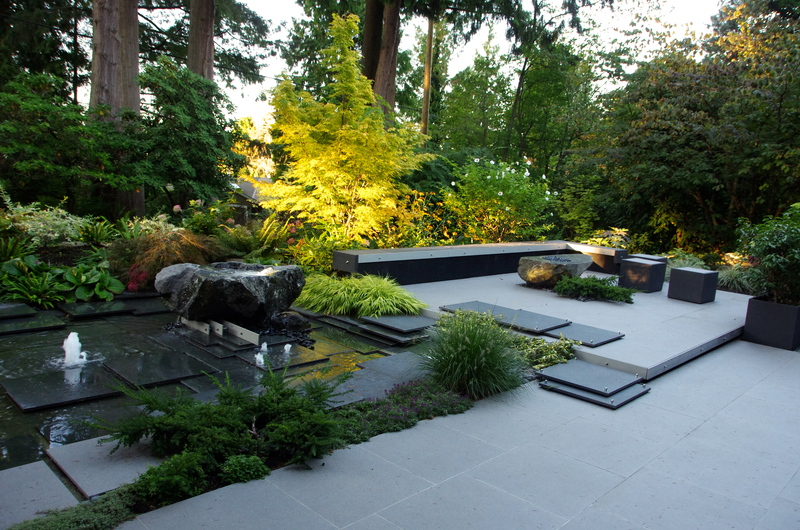 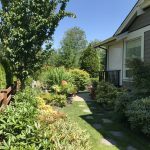 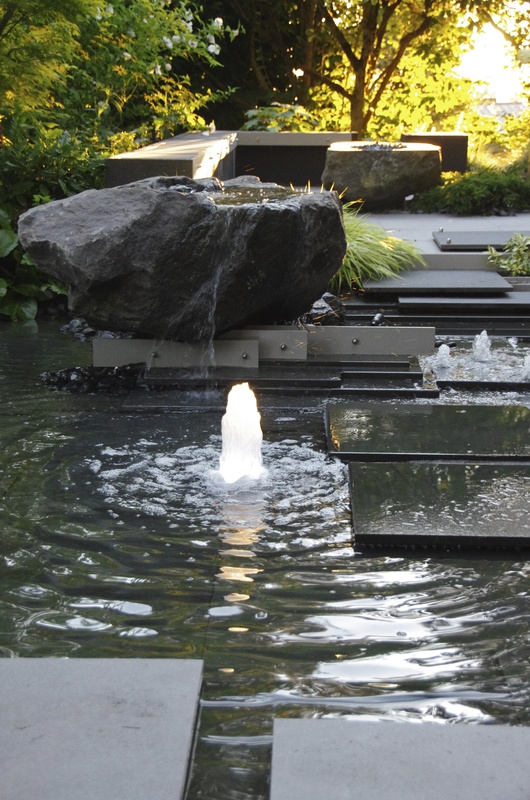 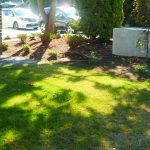 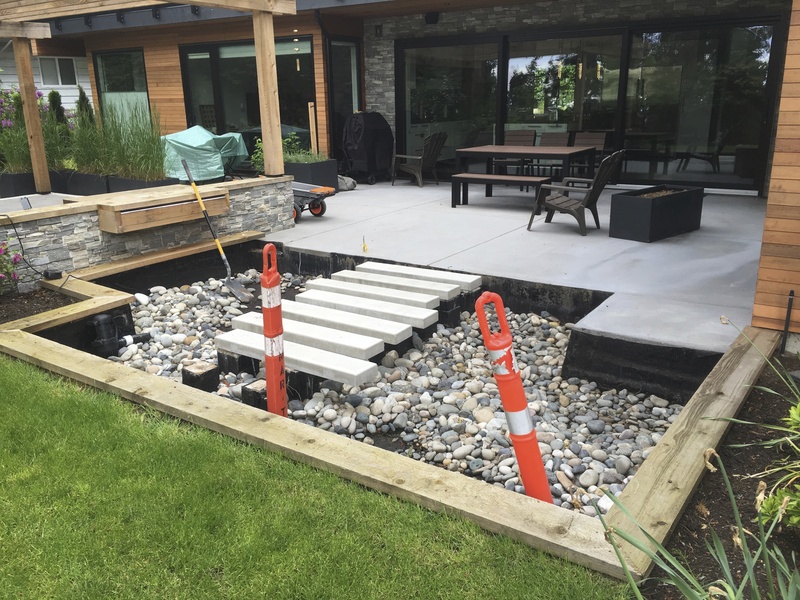 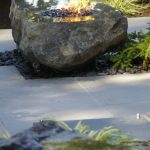 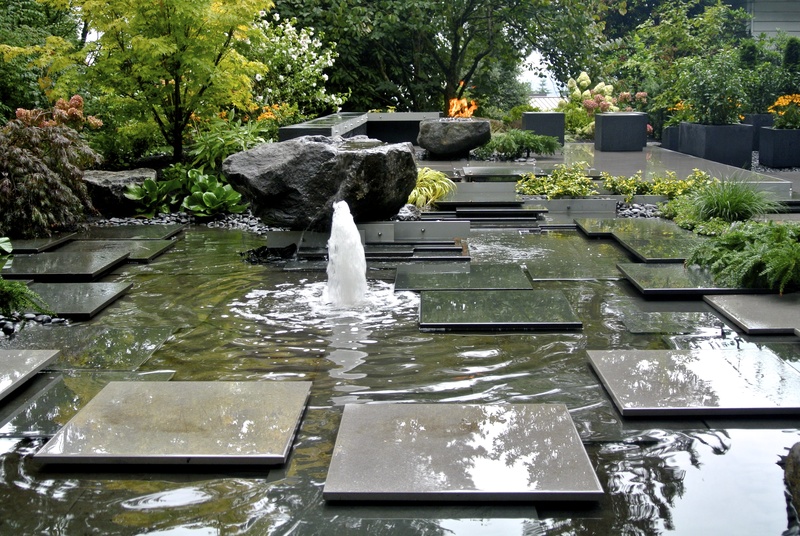 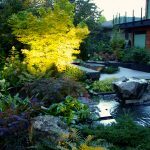 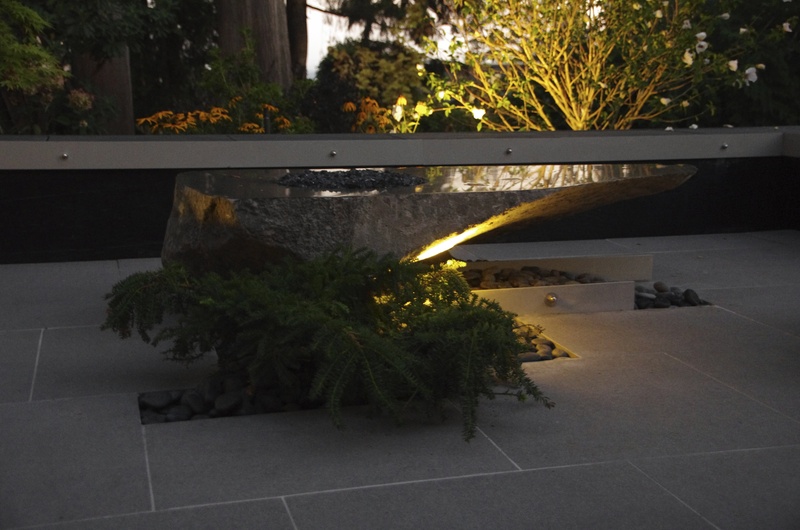 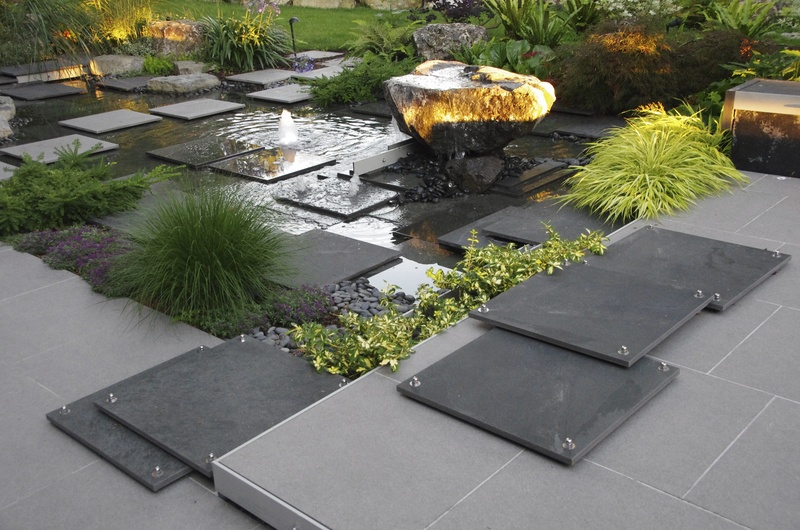 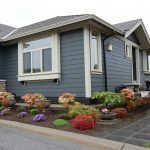 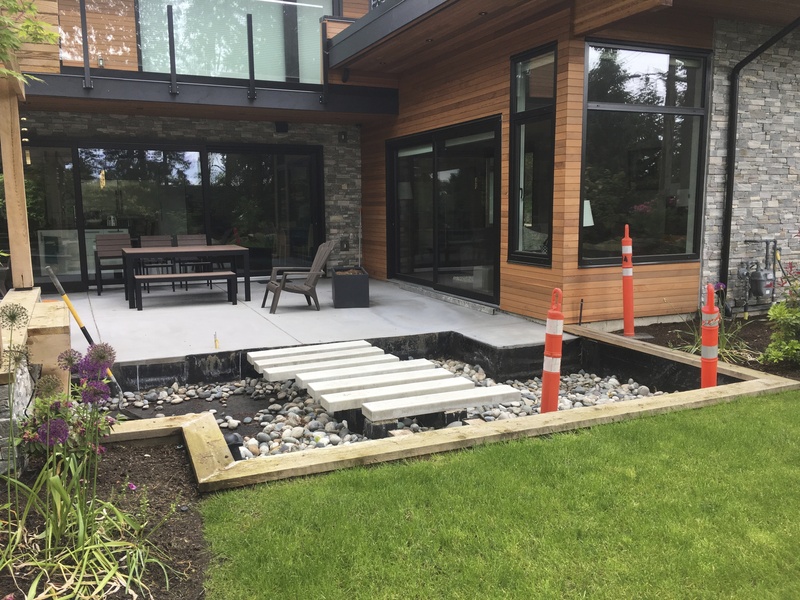 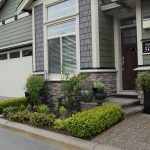 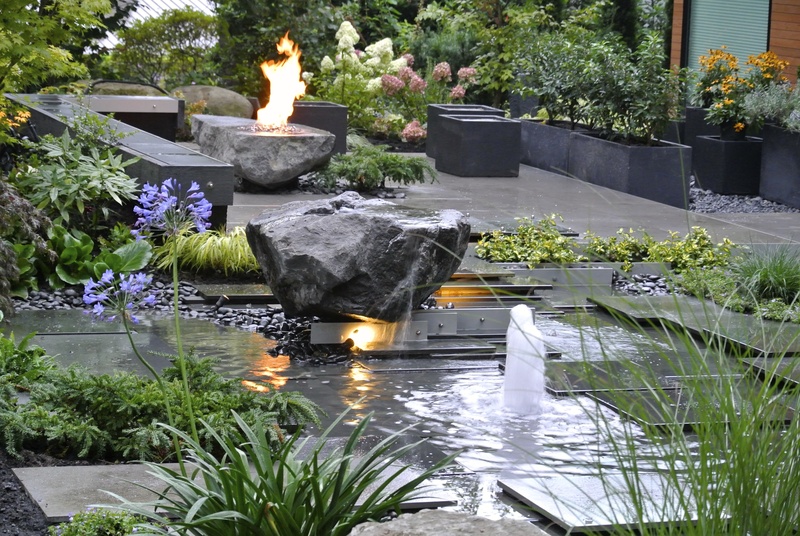 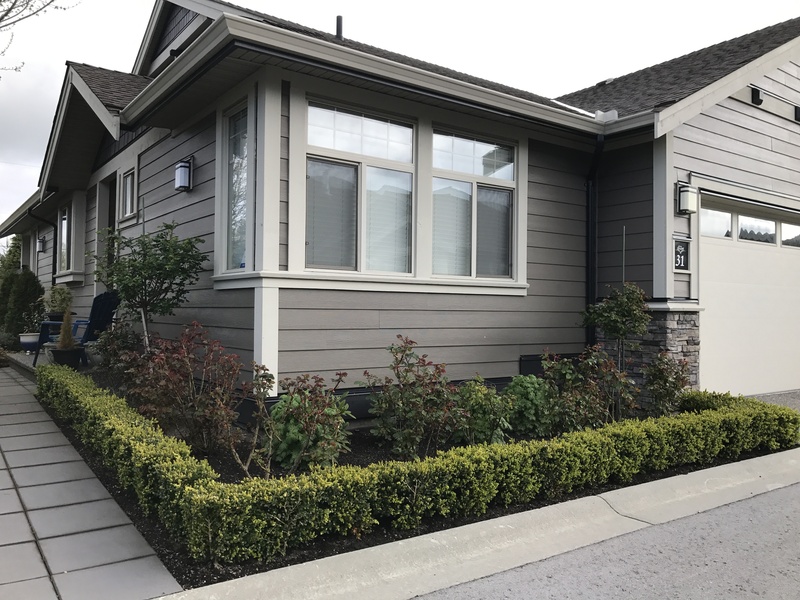 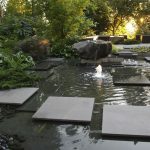 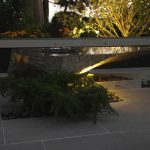 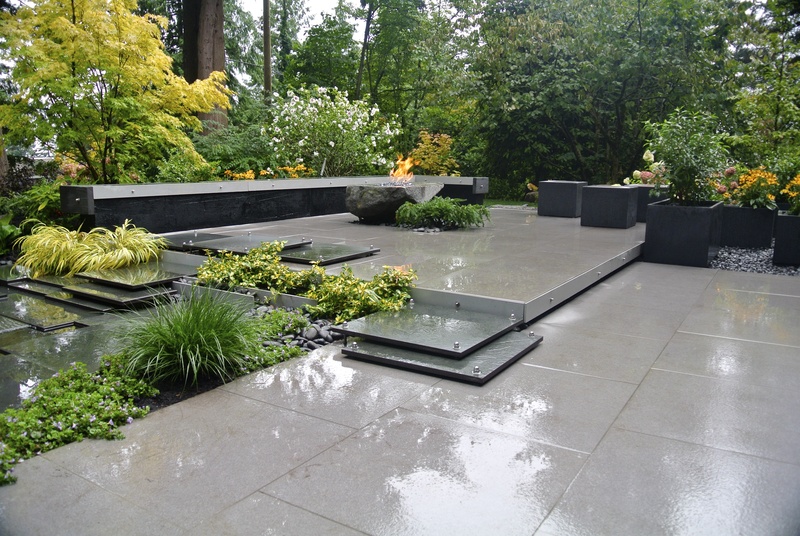 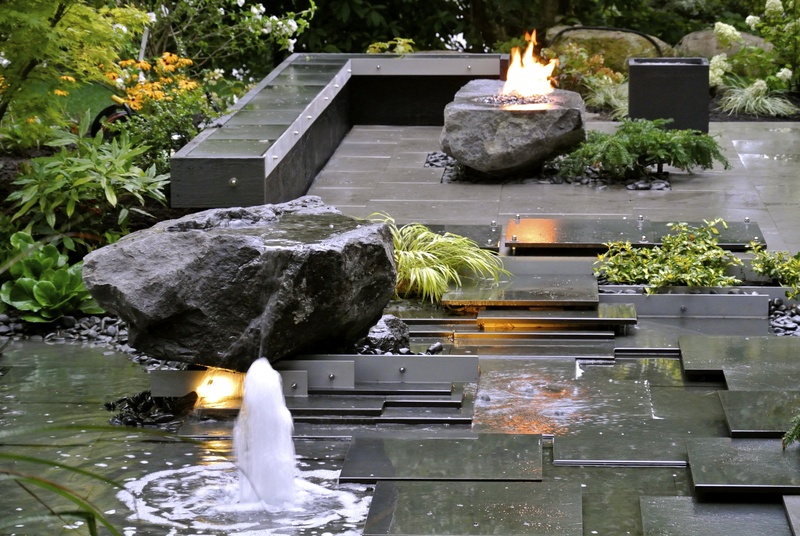 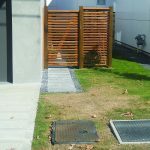 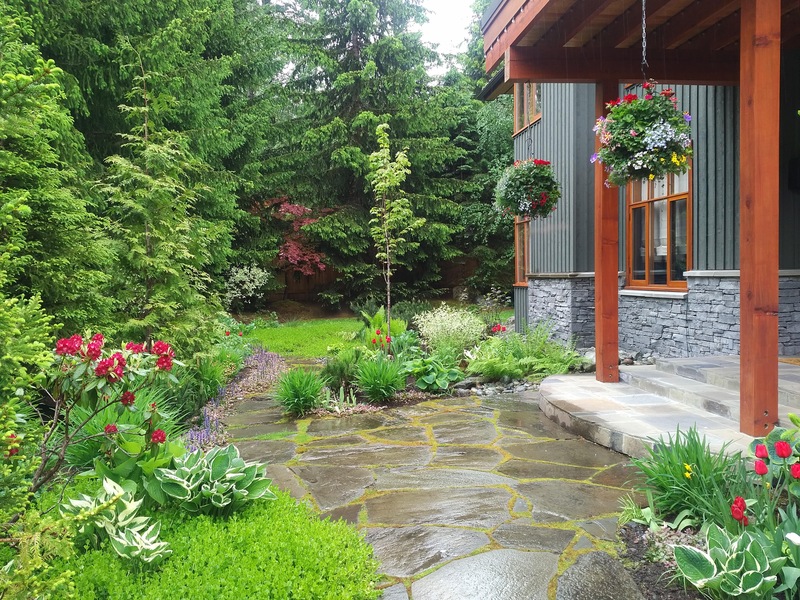 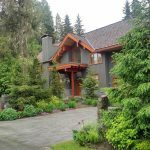 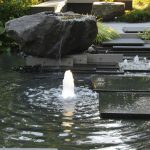 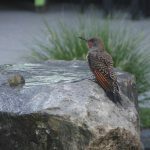 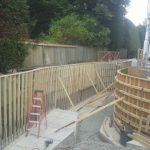 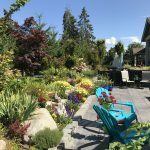 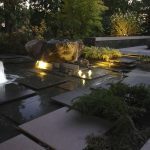 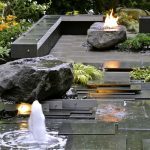 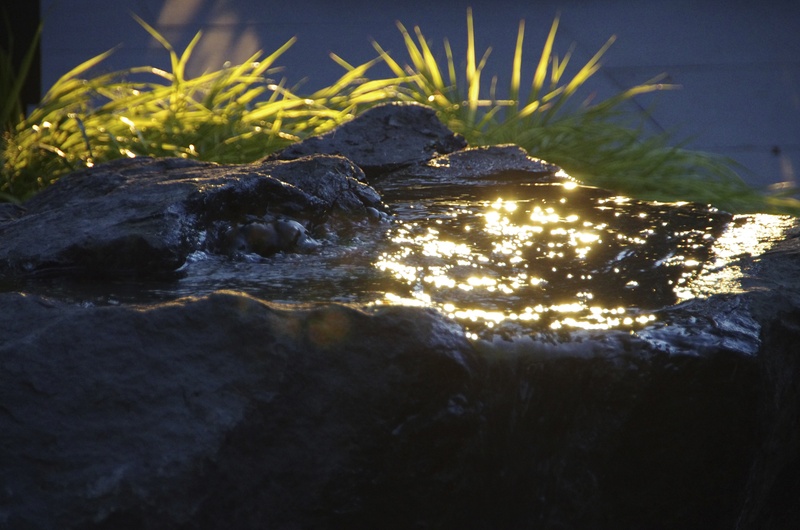 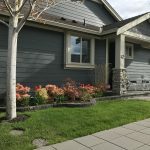 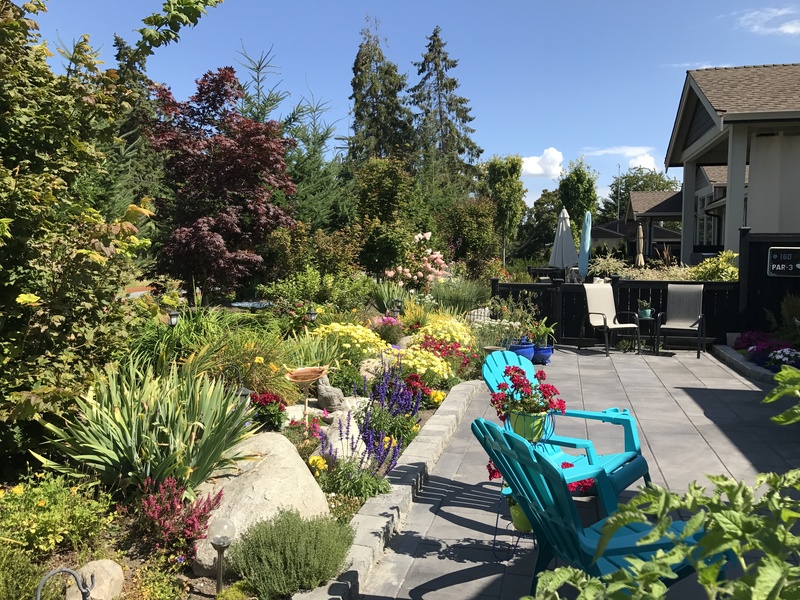 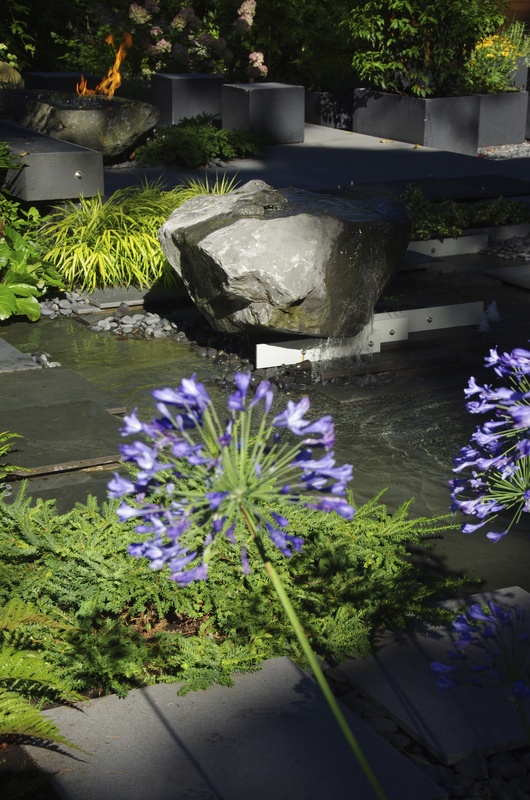 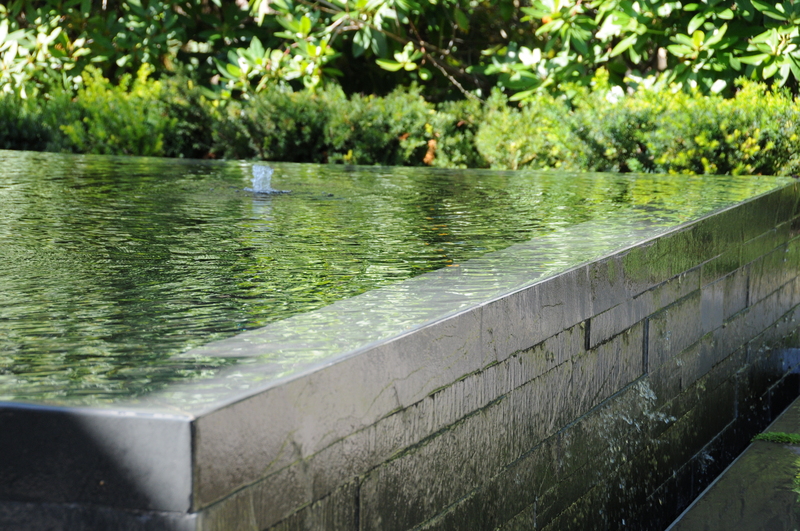 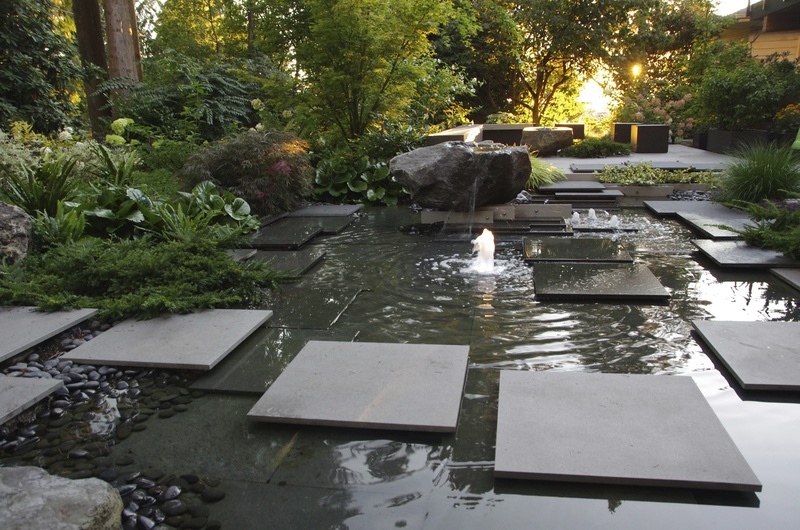 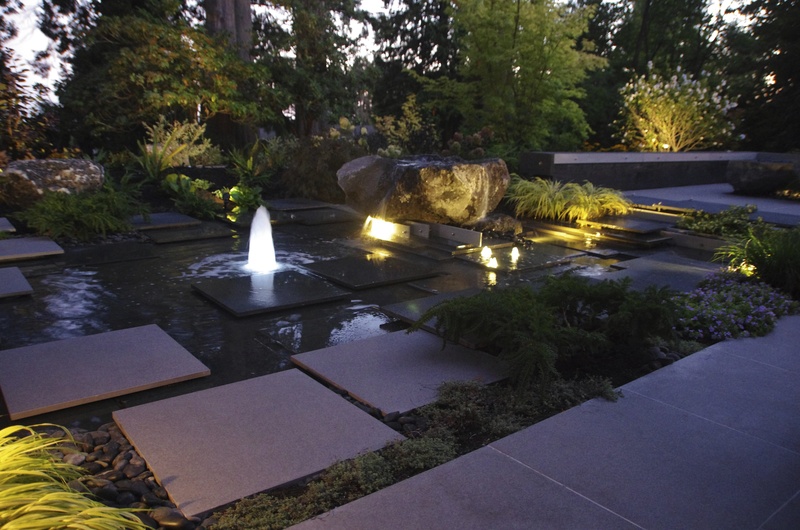 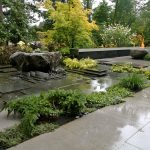 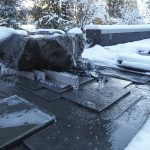 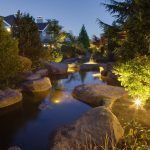 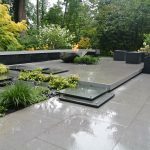 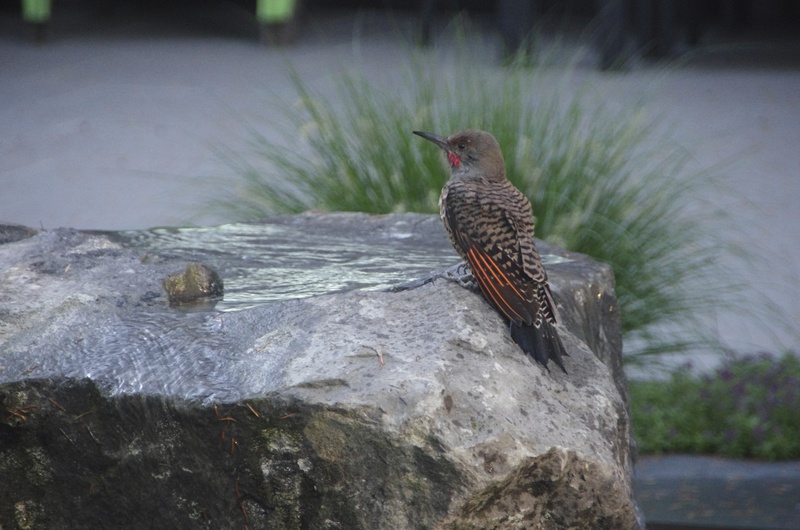 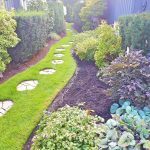 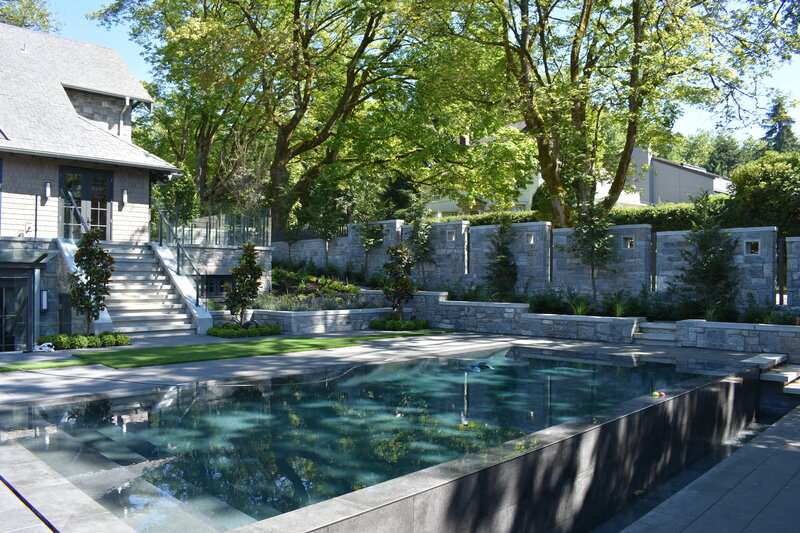 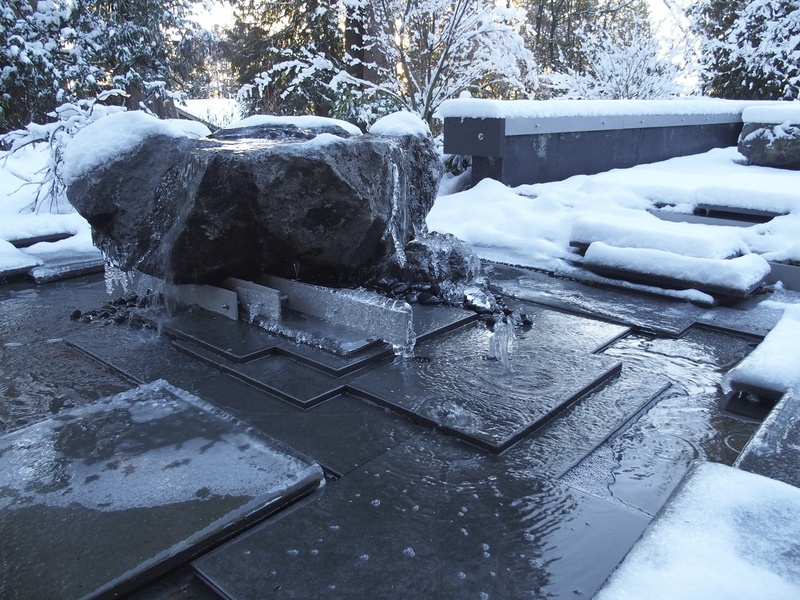 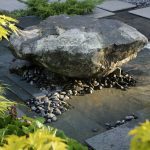 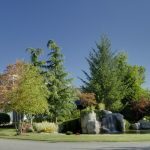 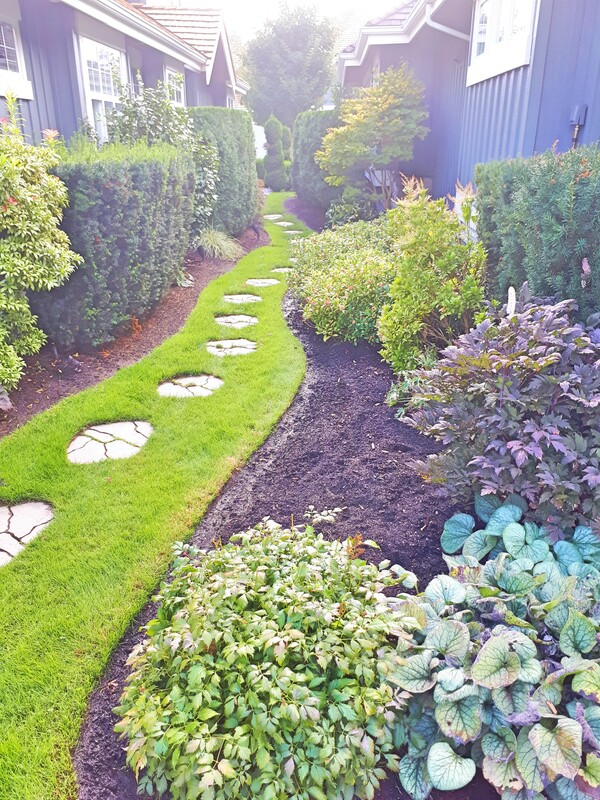 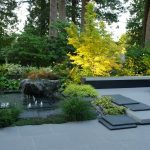 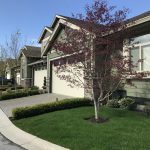 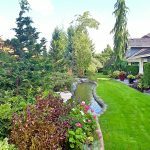 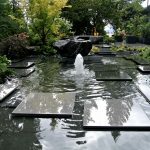 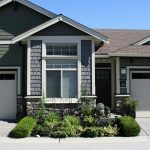 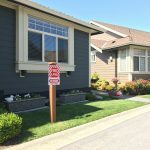 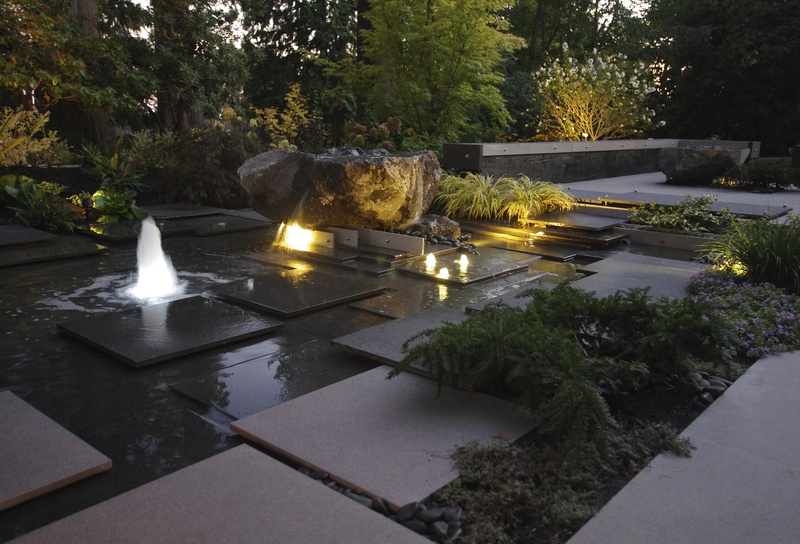 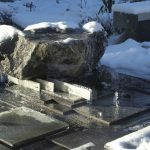 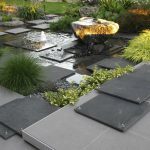 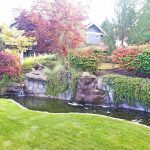 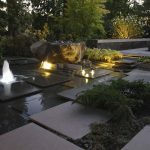 The existing water feature did not operate nor did it retain water and the job was to create a new water feature, patio surface, plants, and new lawn that suited the property and the owner’s lifestyle. 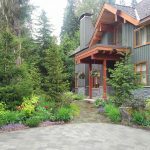 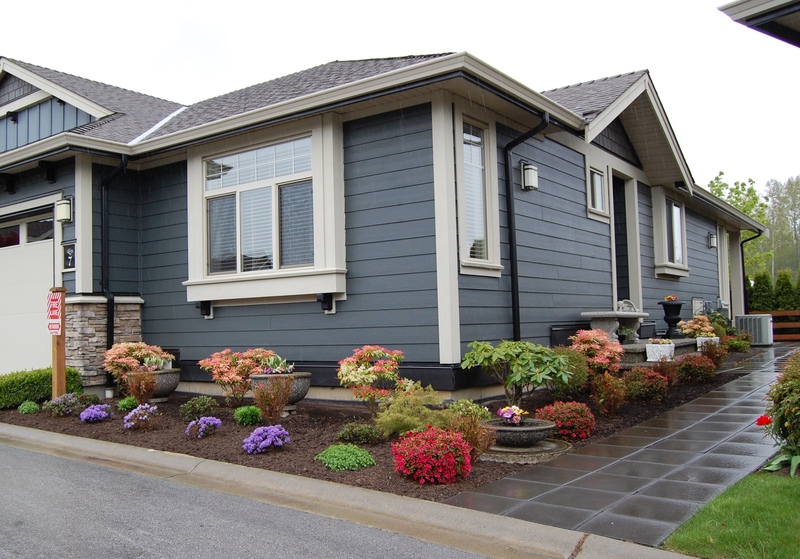 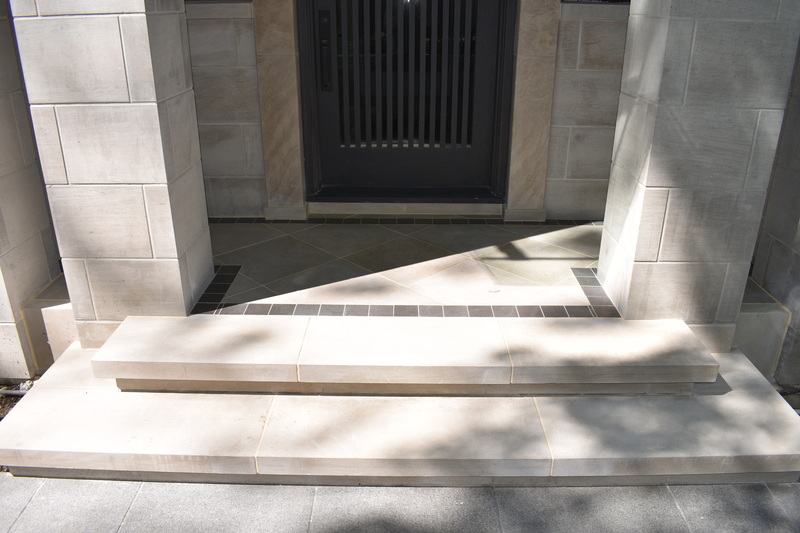 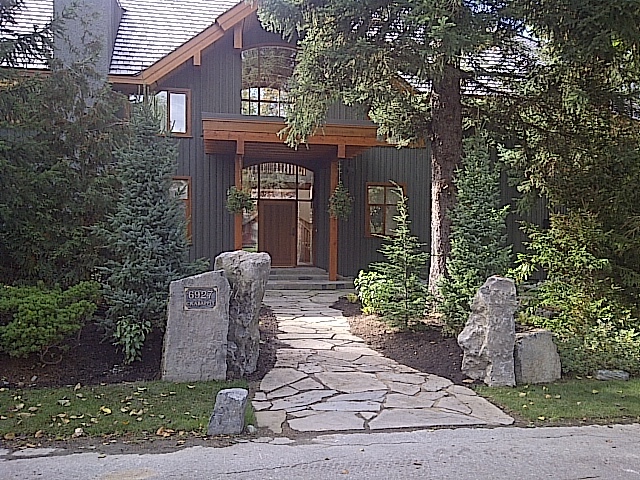 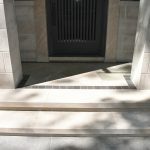 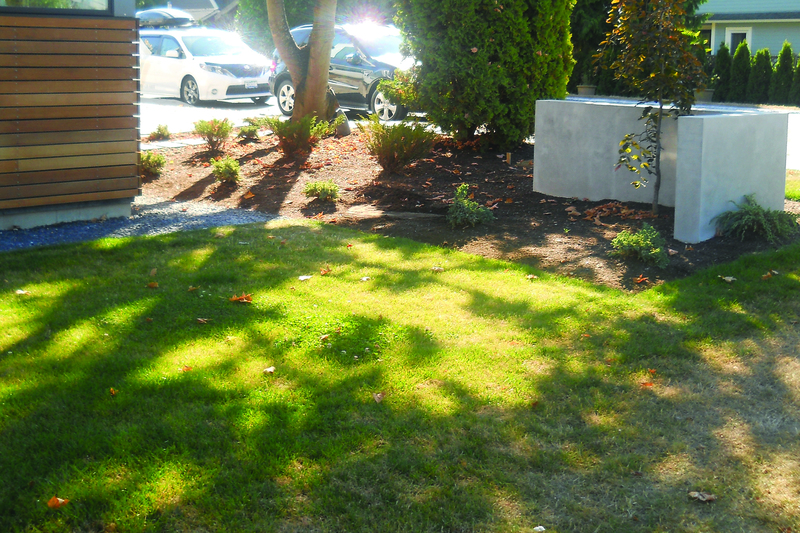 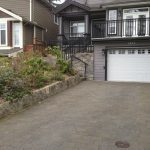 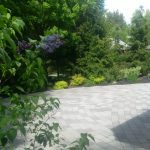 Initially the client approached Landscape 2000 Ltd. to fix up the front yard to give the whole property a better look. 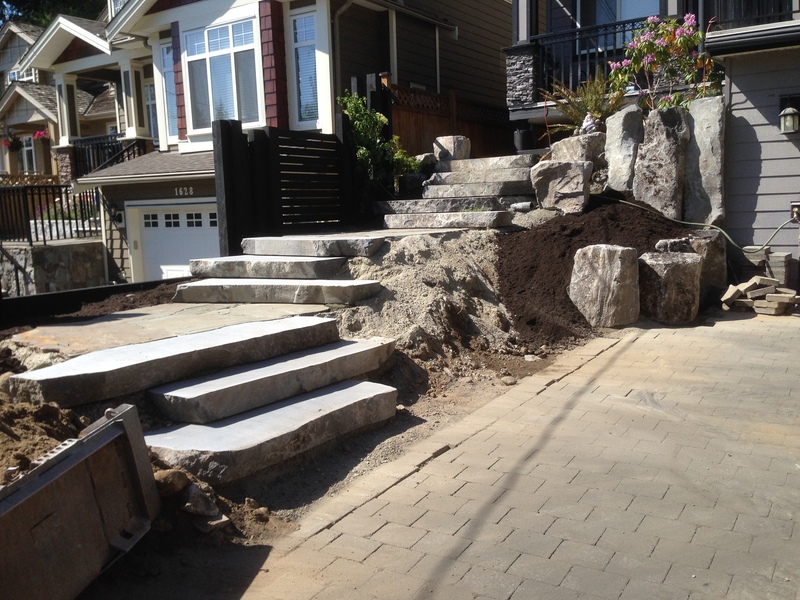 After a few discussions it was decided to do a complete overhaul including new stairs. 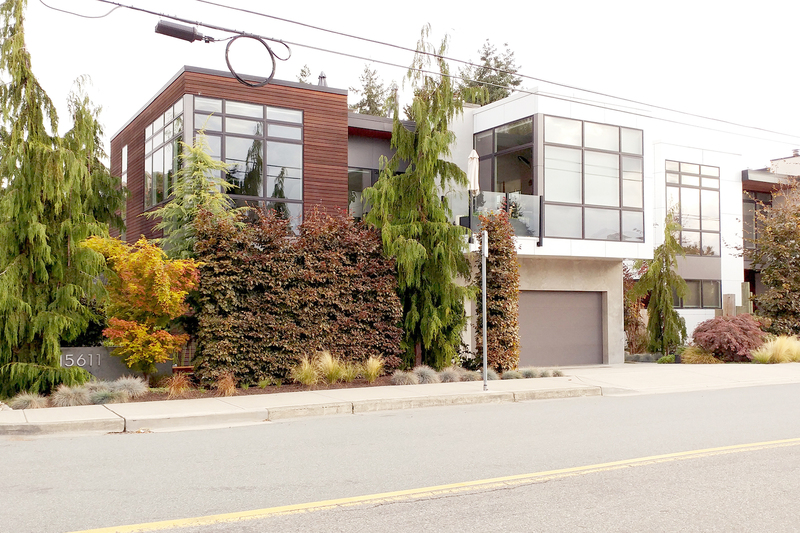 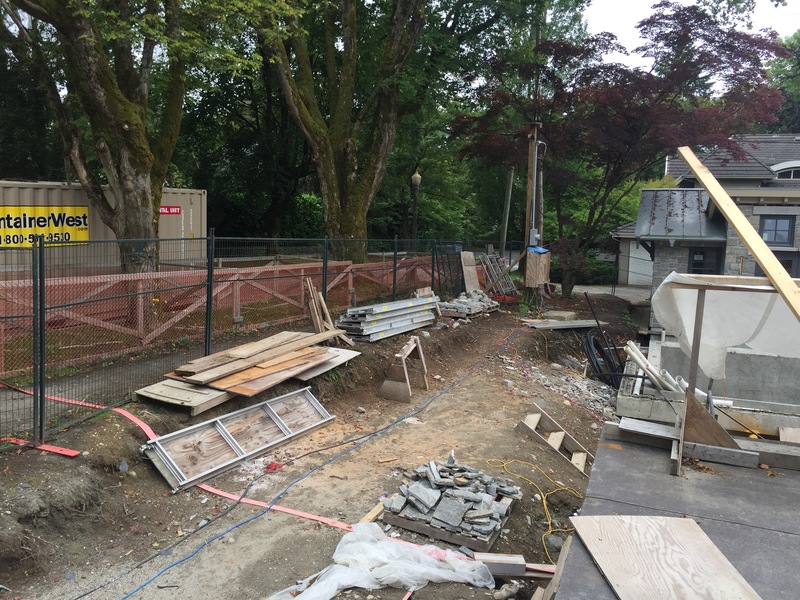 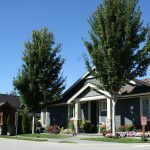 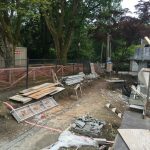 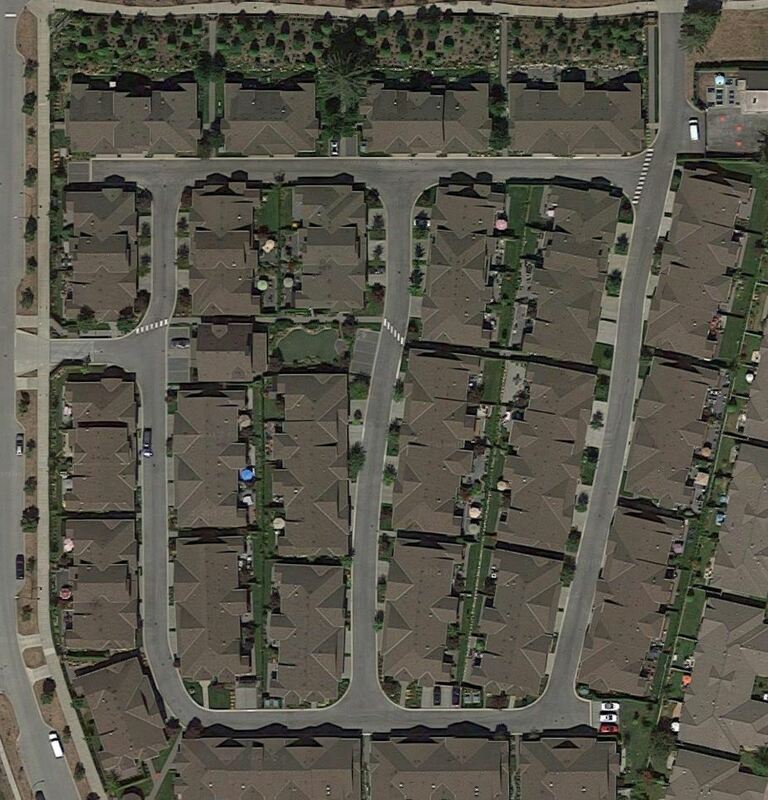 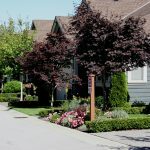 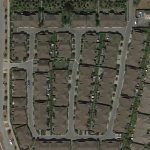 The biggest challenge was the size between driveway and the neighbor’s property. 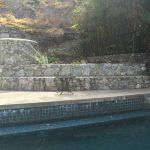 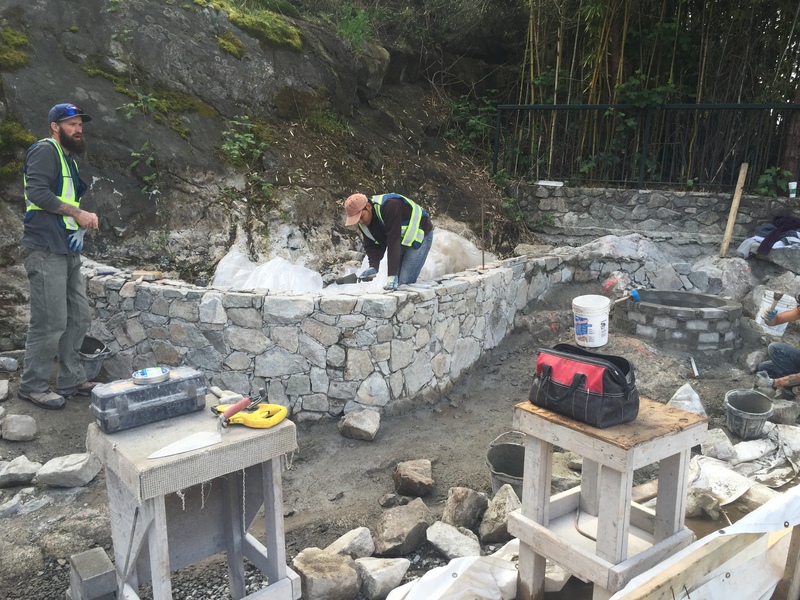 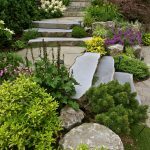 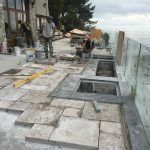 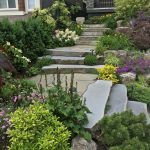 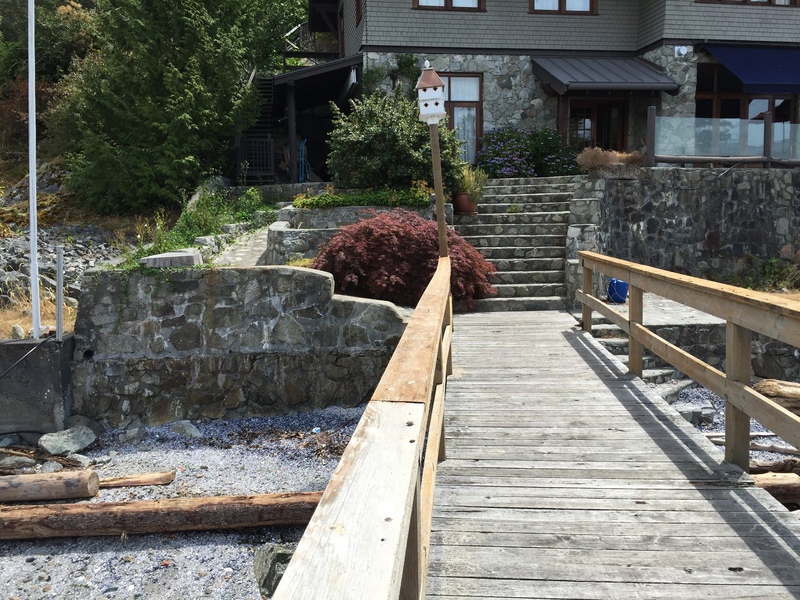 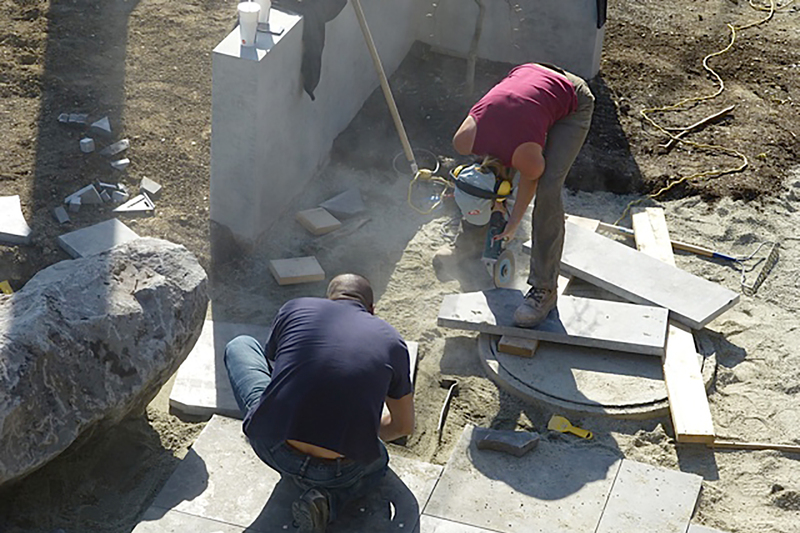 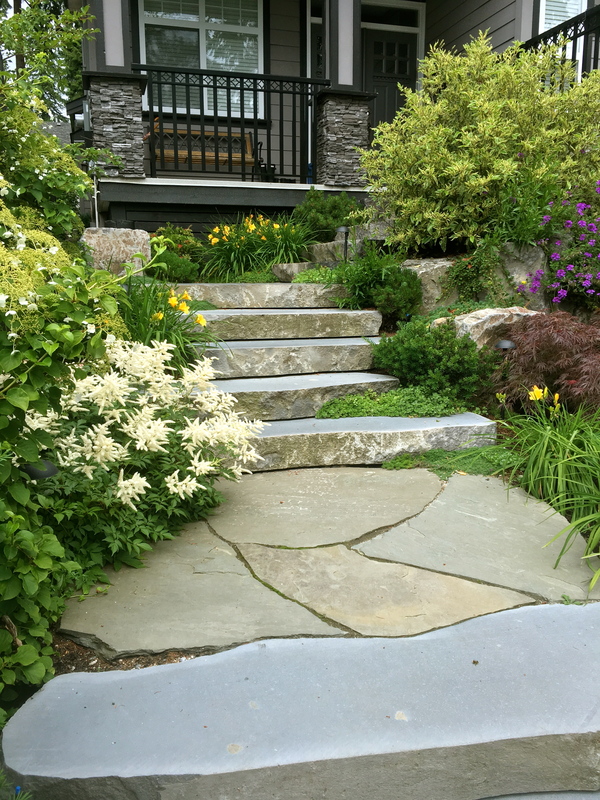 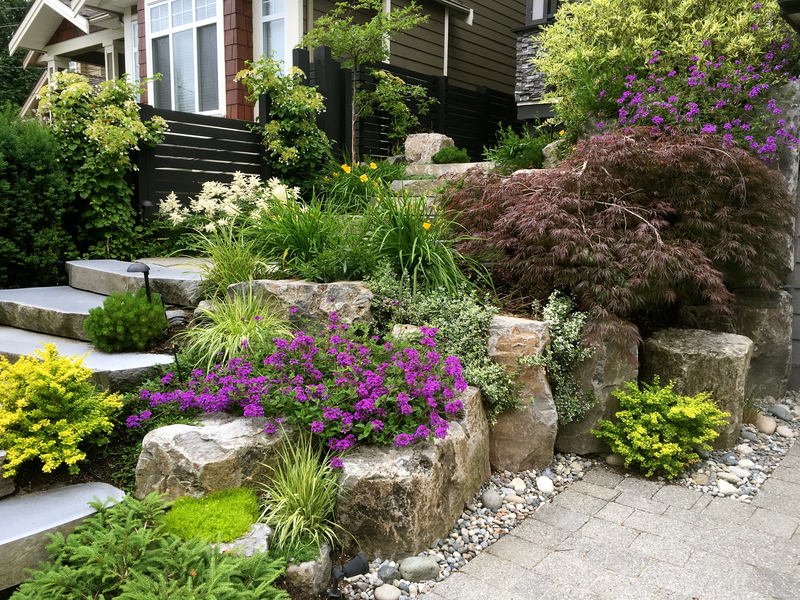 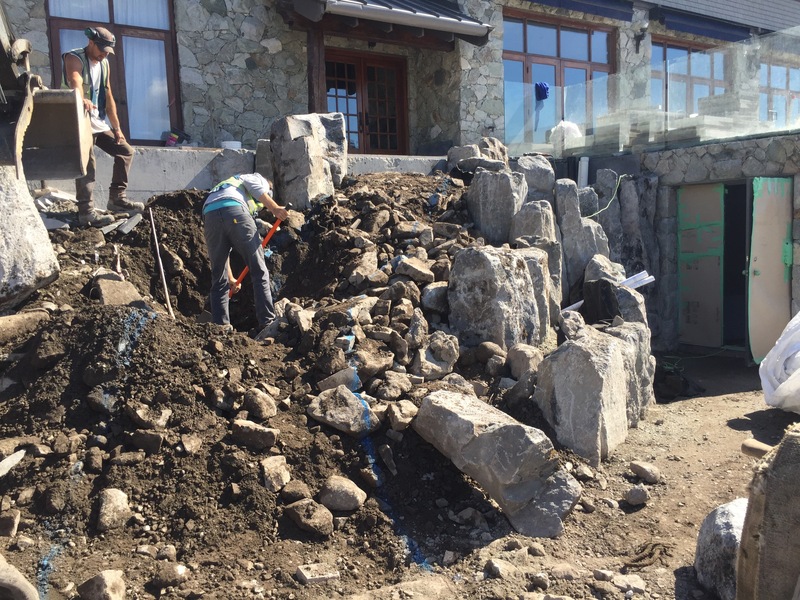 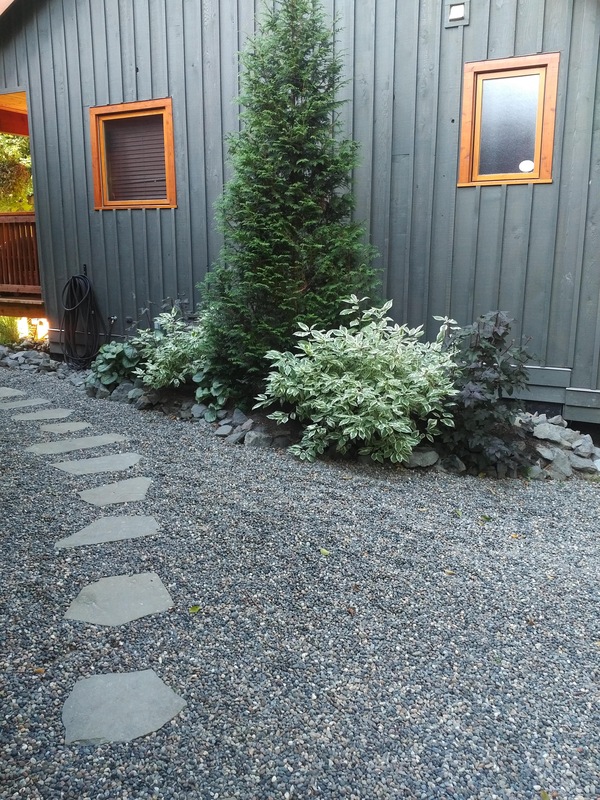 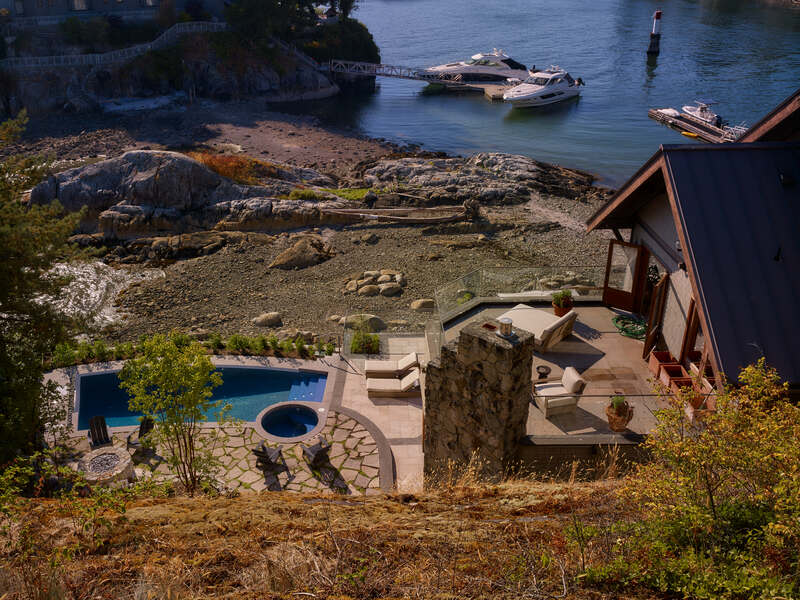 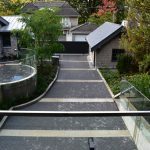 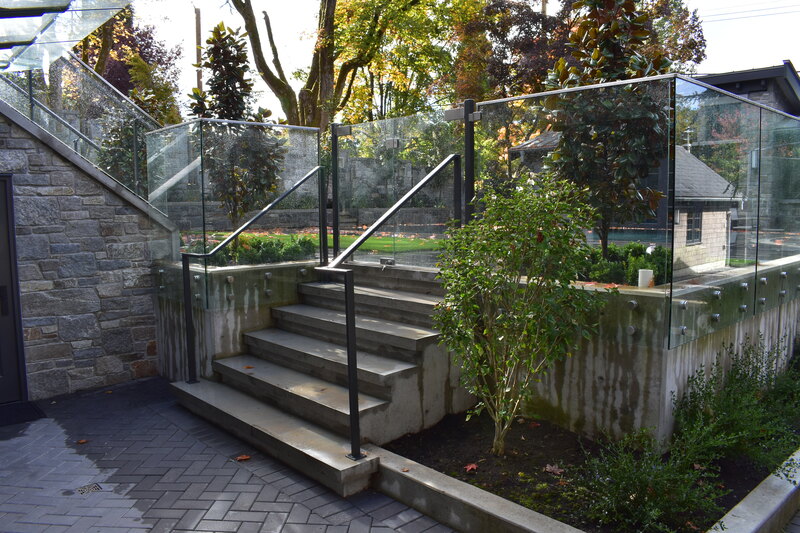 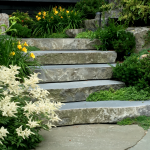 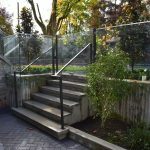 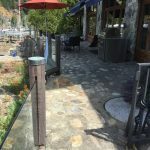 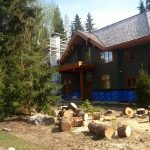 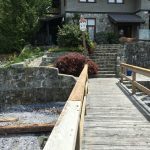 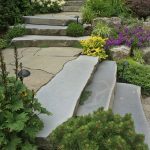 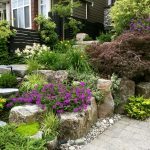 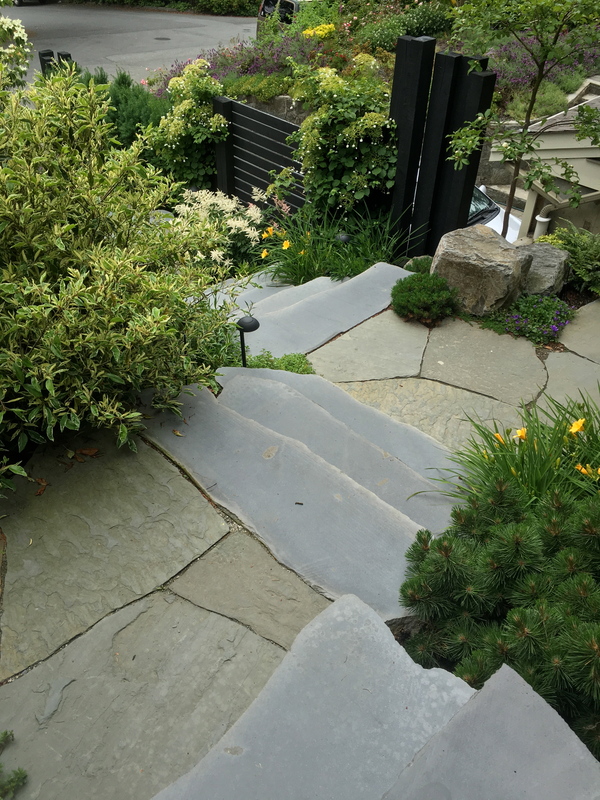 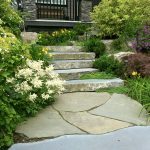 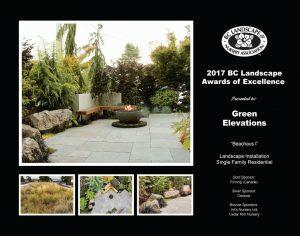 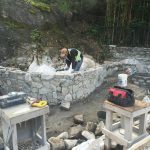 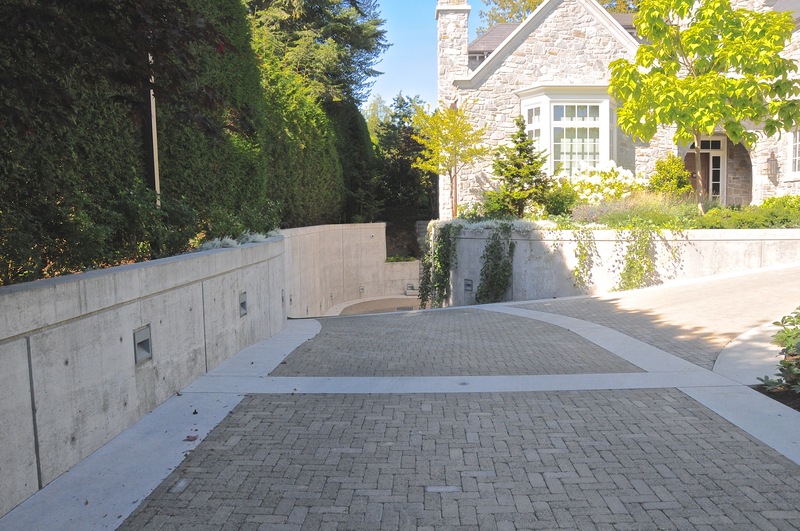 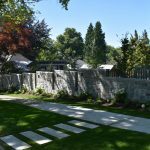 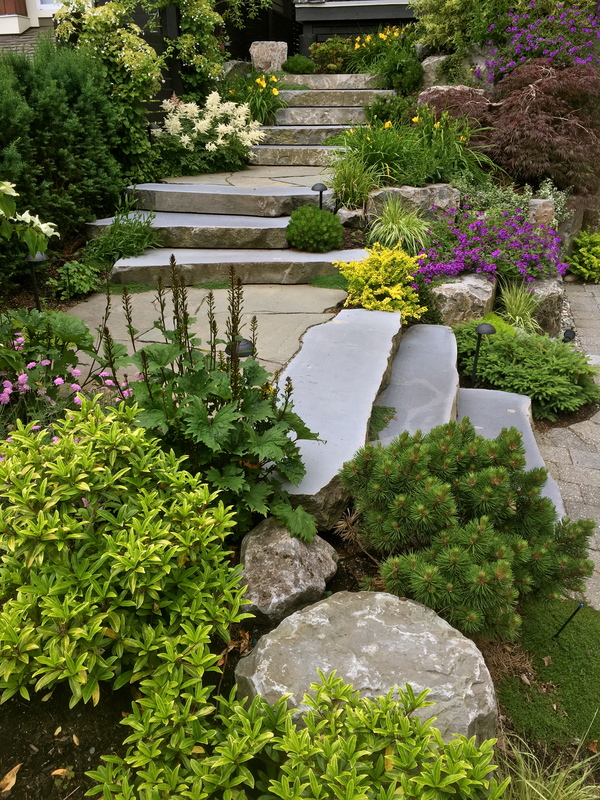 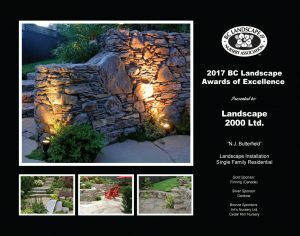 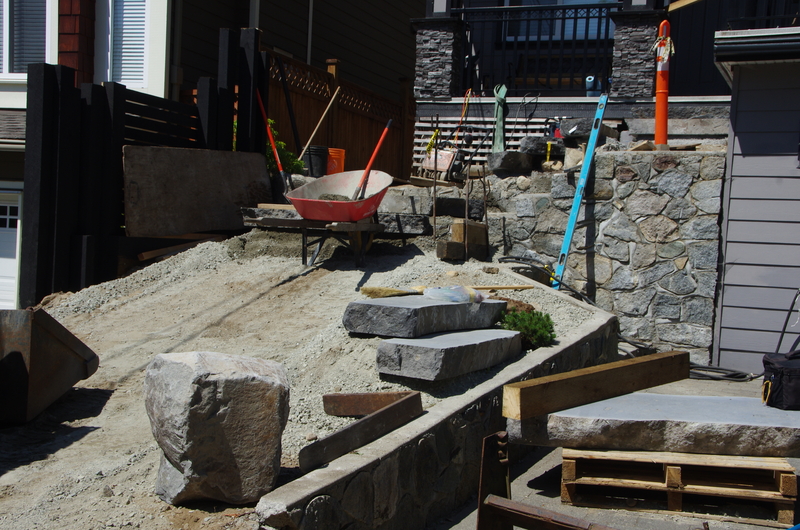 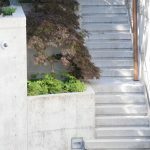 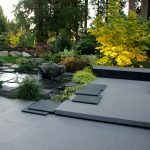 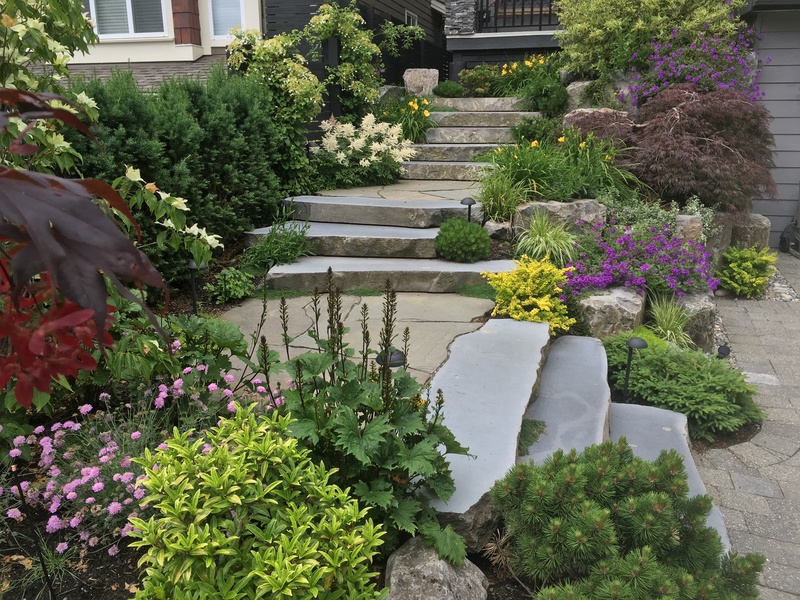 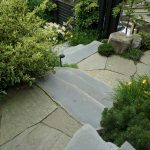 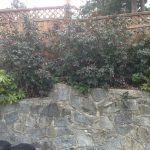 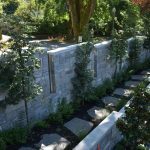 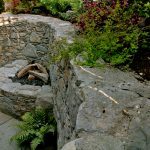 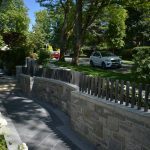 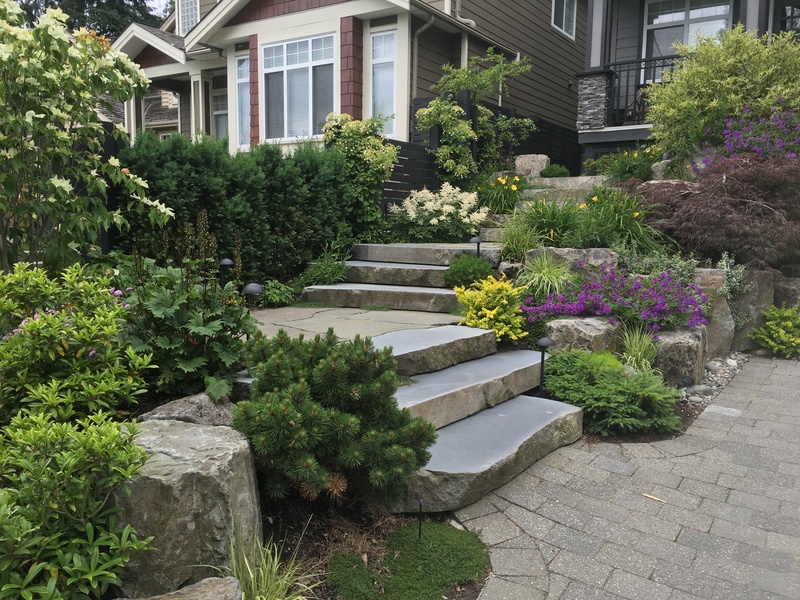 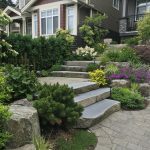 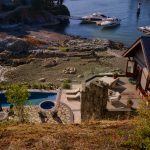 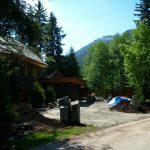 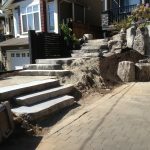 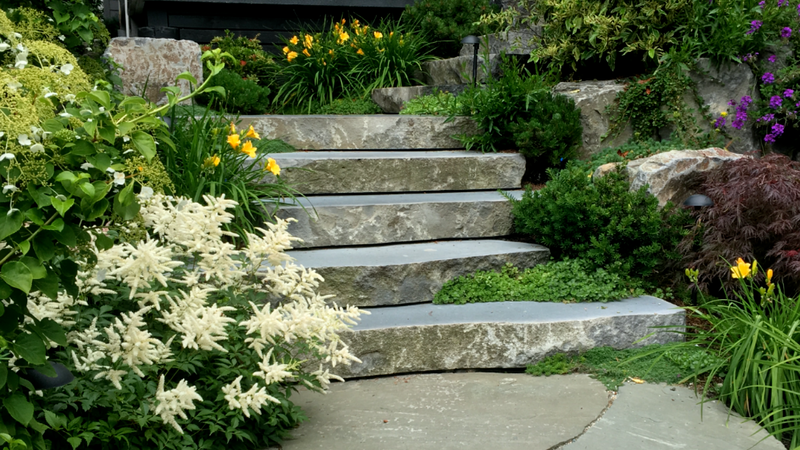 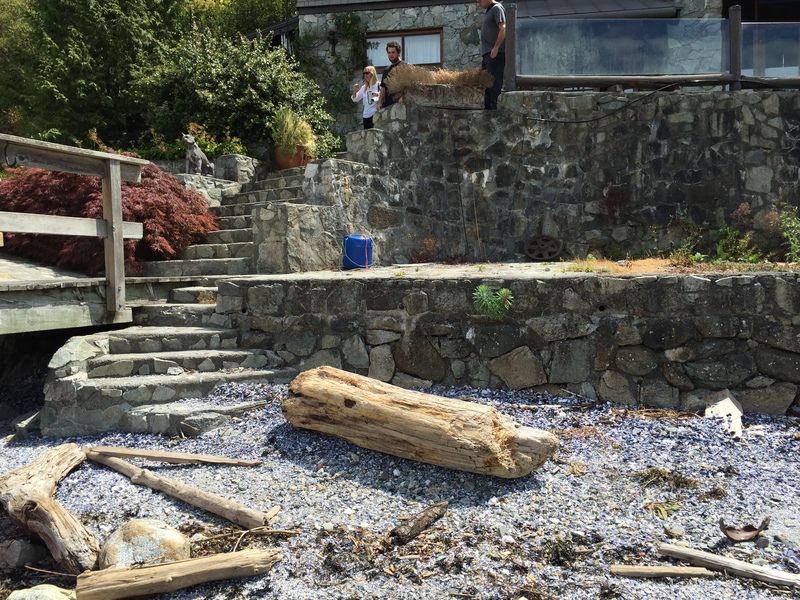 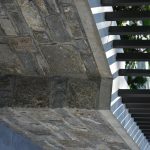 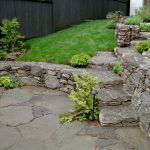 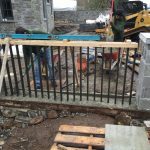 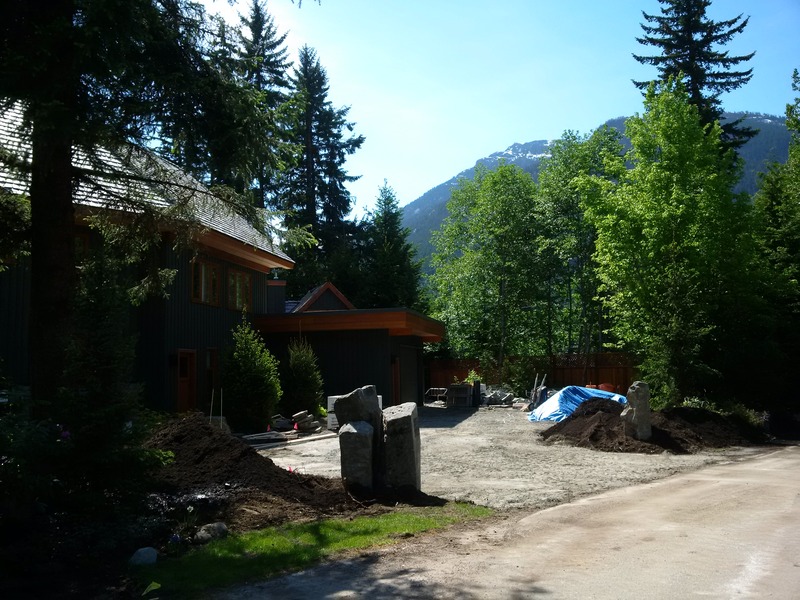 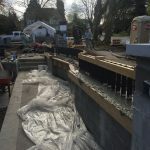 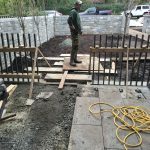 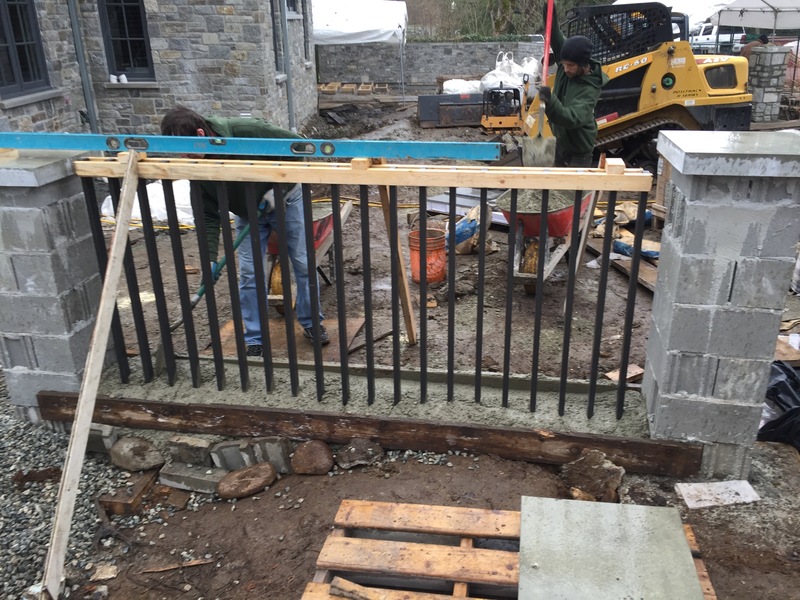 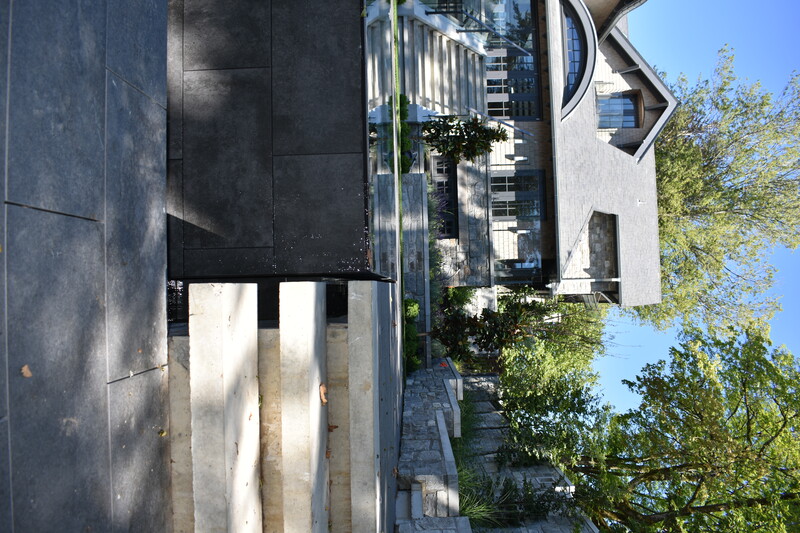 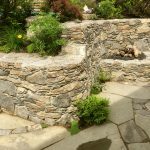 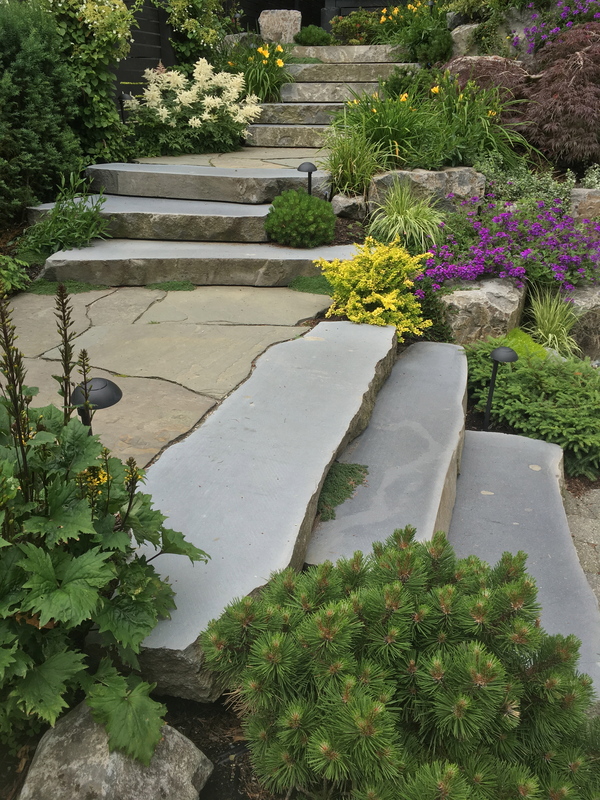 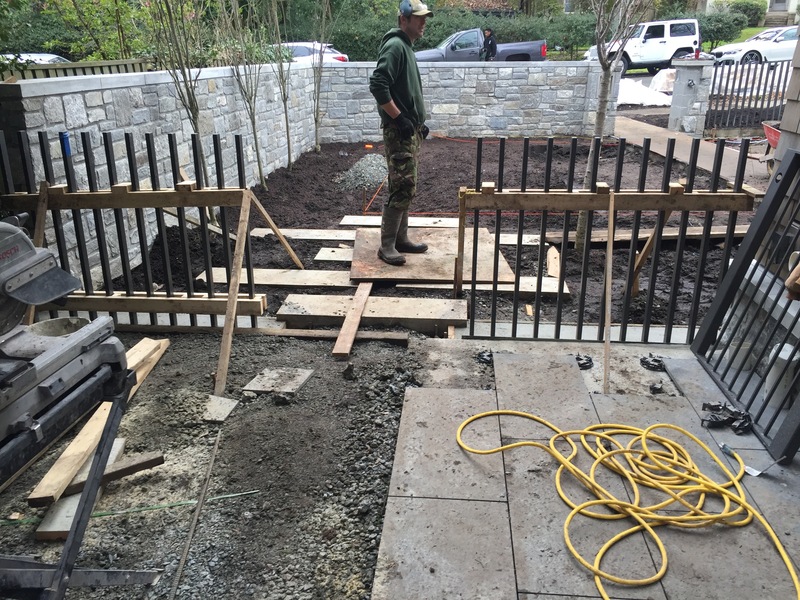 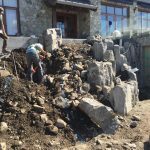 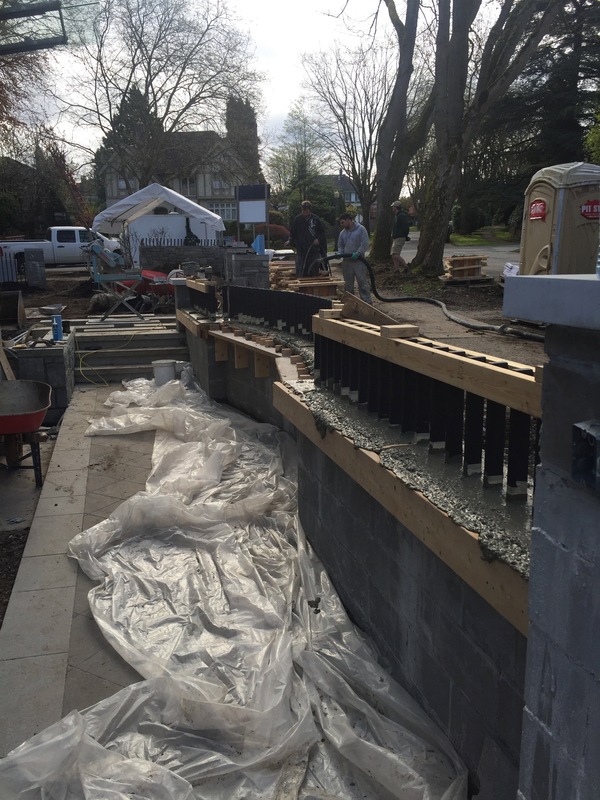 After reinforcing retaining walls and putting up privacy screens, we started by building new basalt stairs with bluestone landings and all the soft landscape. 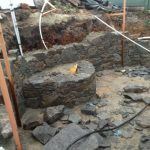 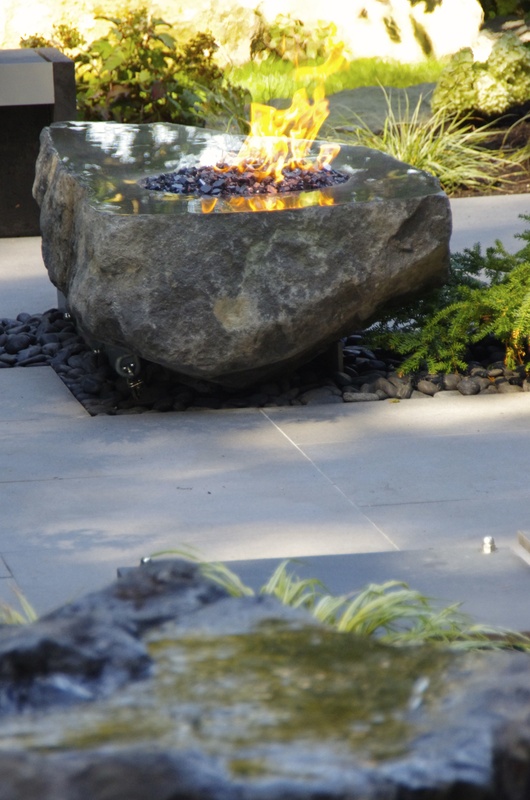 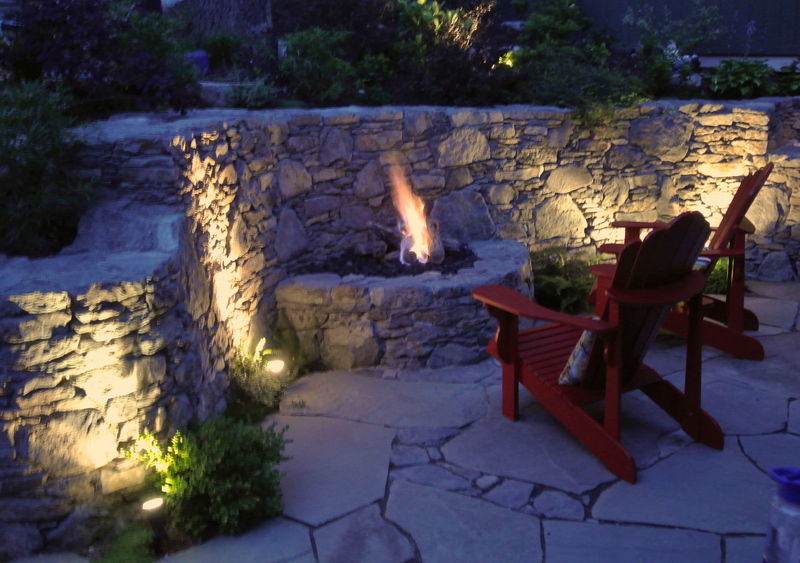 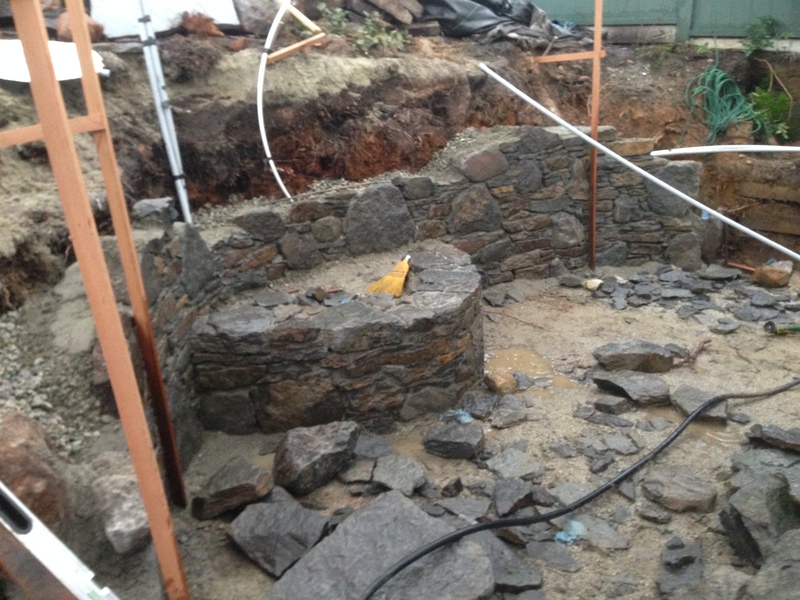 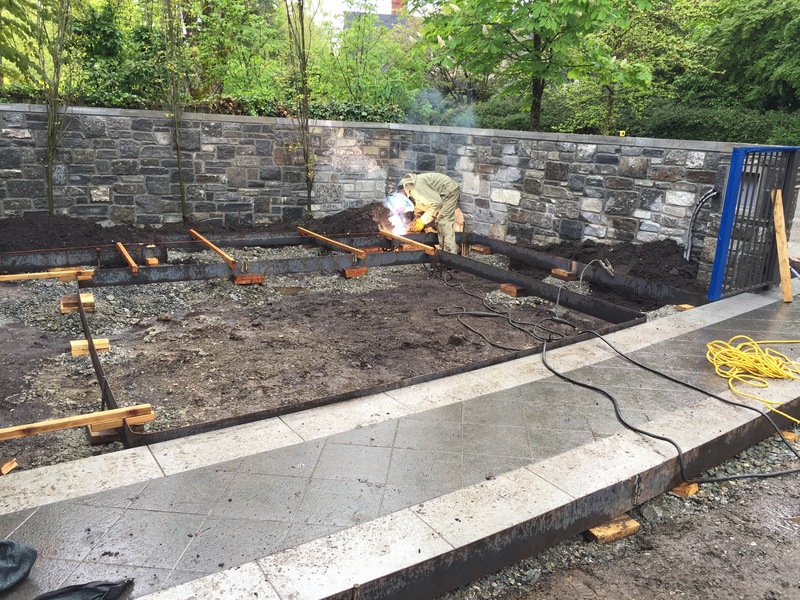 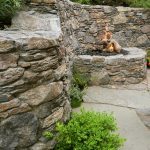 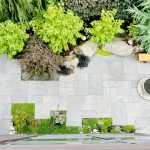 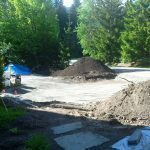 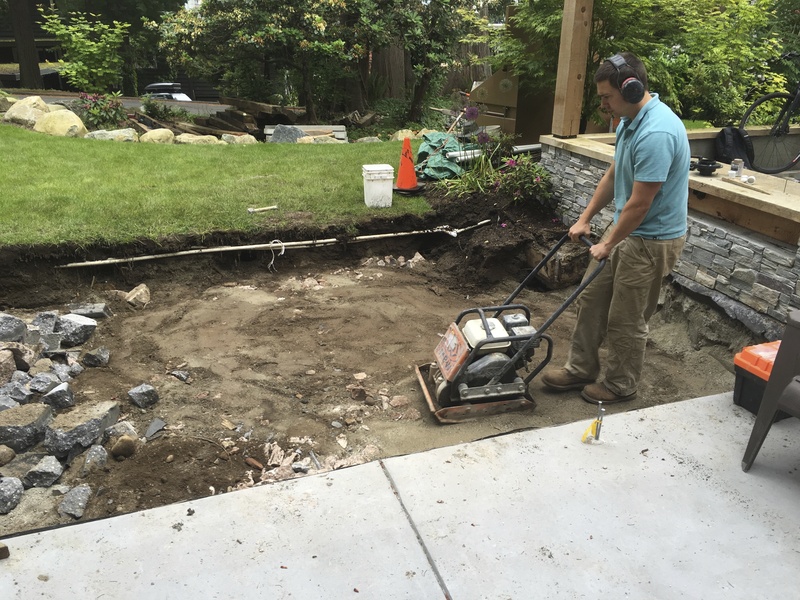 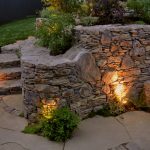 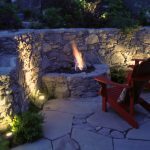 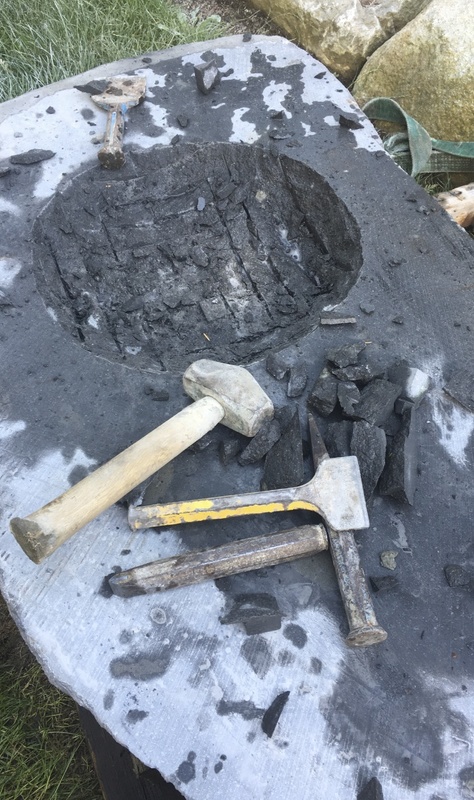 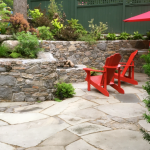 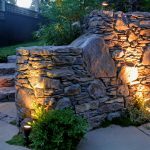 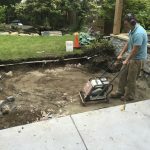 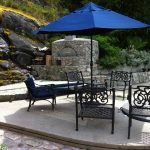 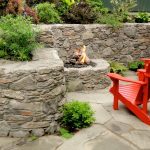 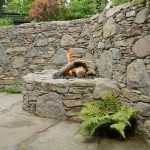 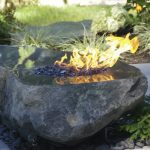 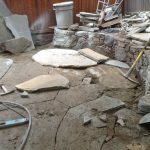 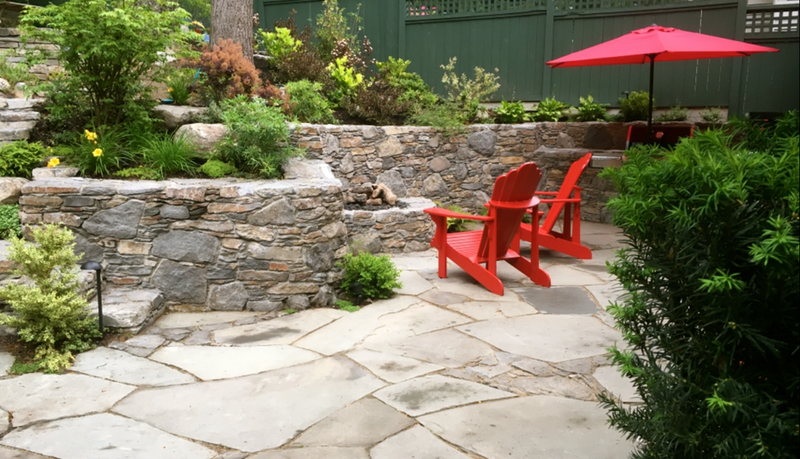 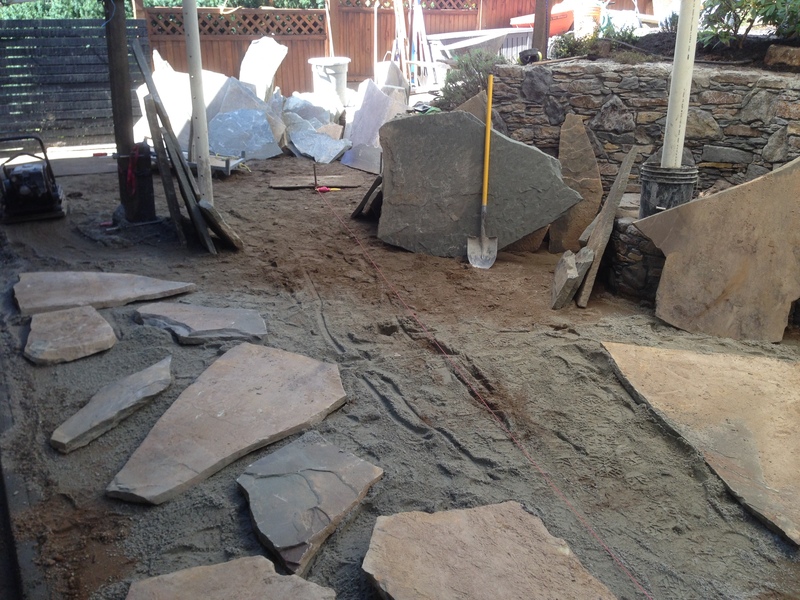 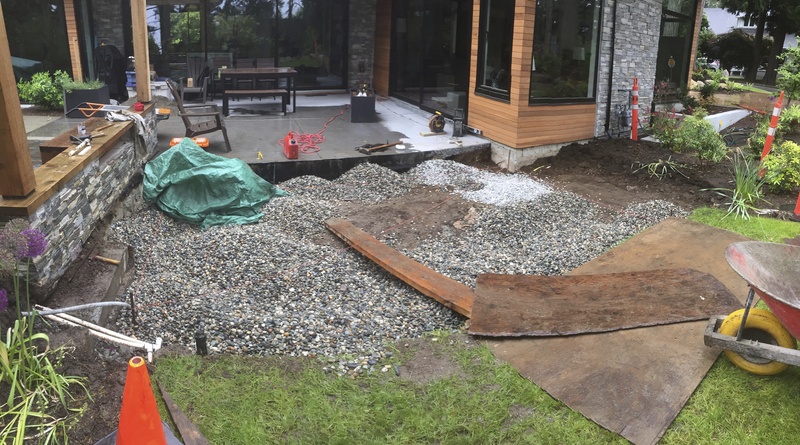 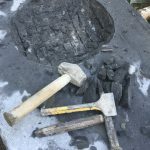 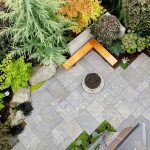 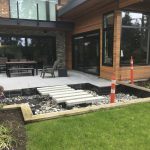 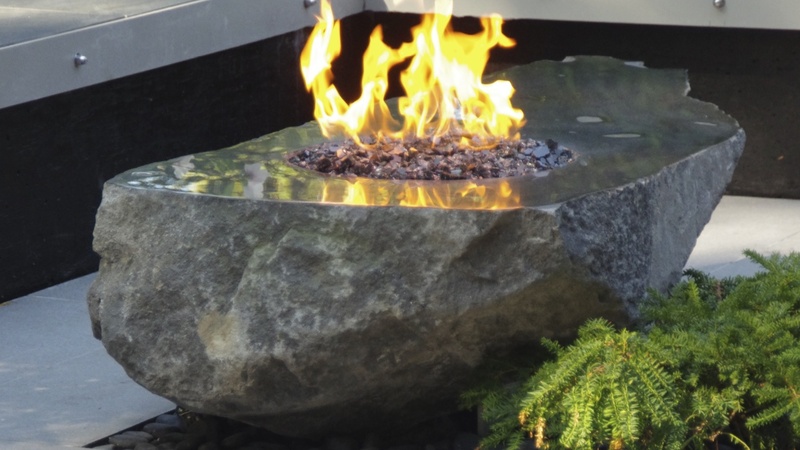 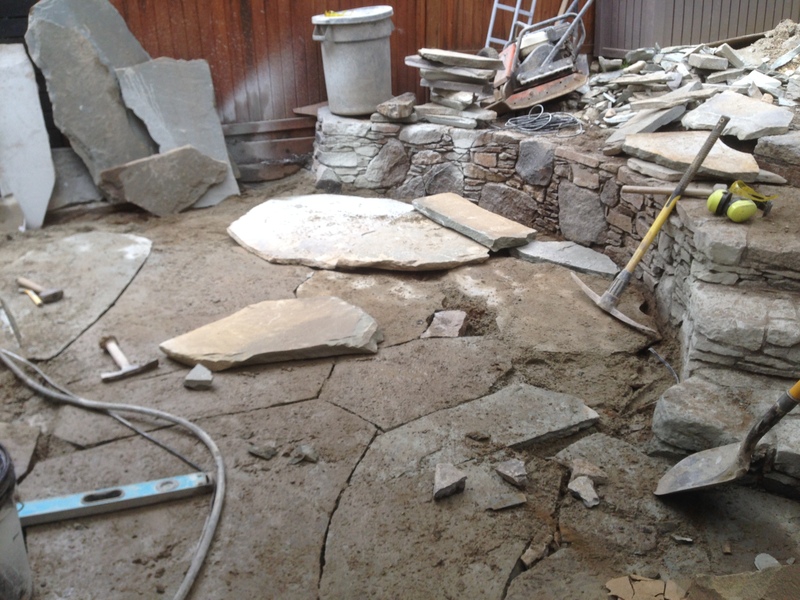 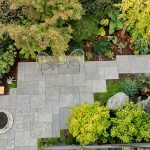 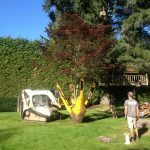 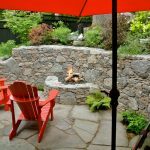 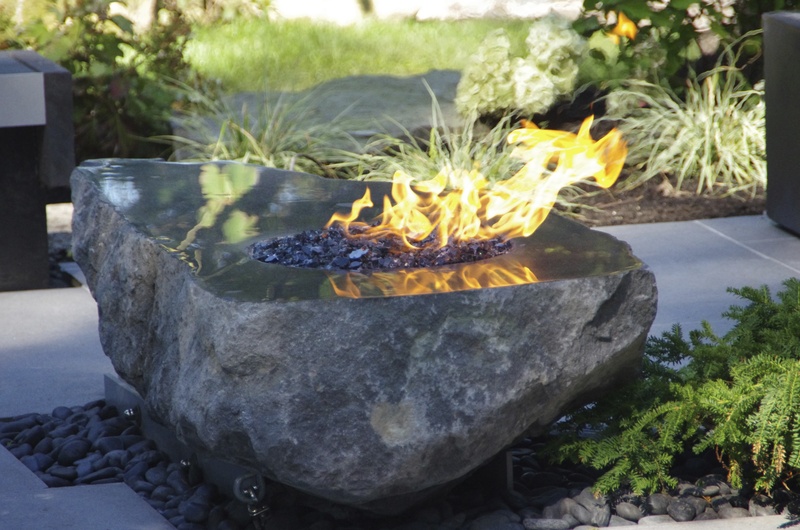 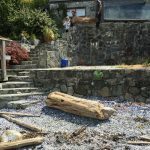 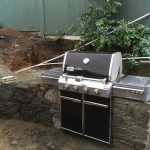 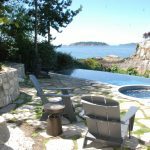 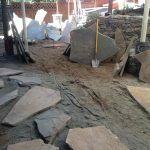 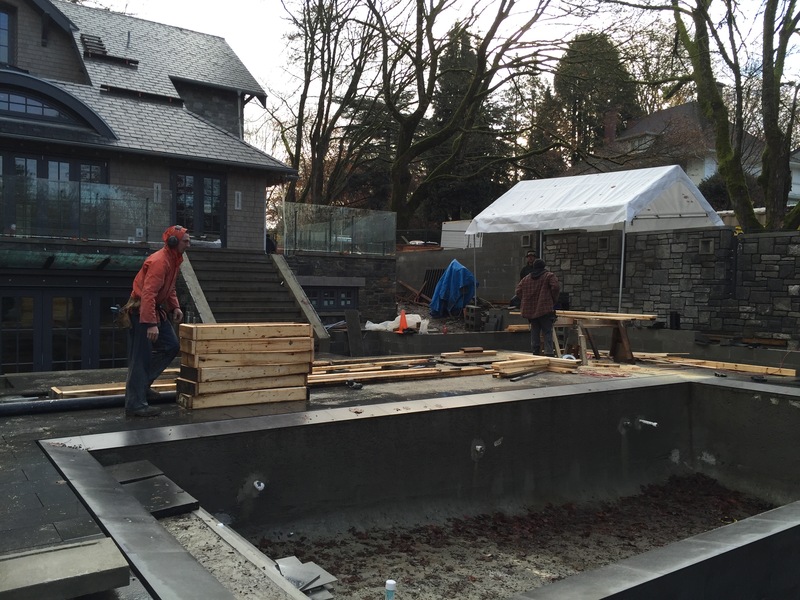 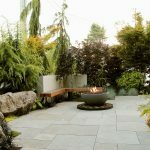 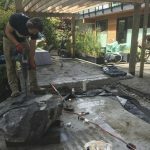 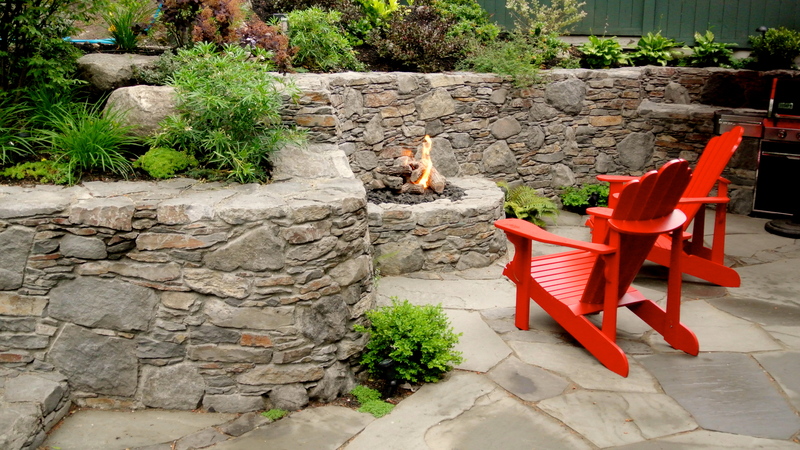 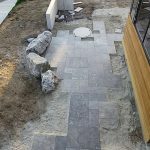 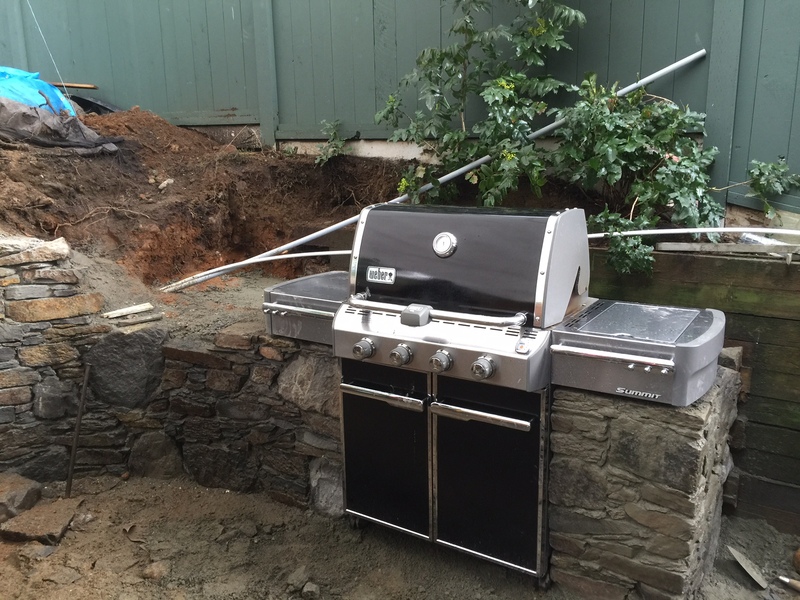 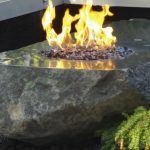 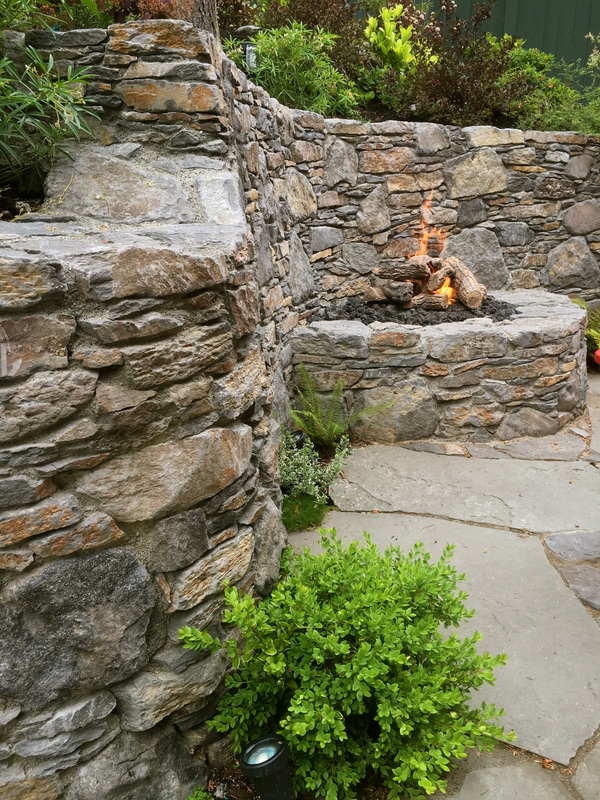 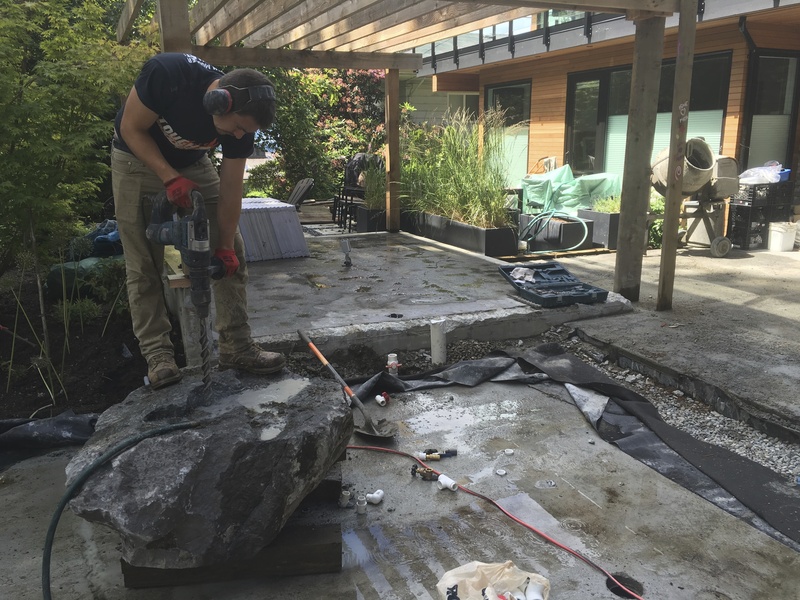 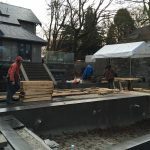 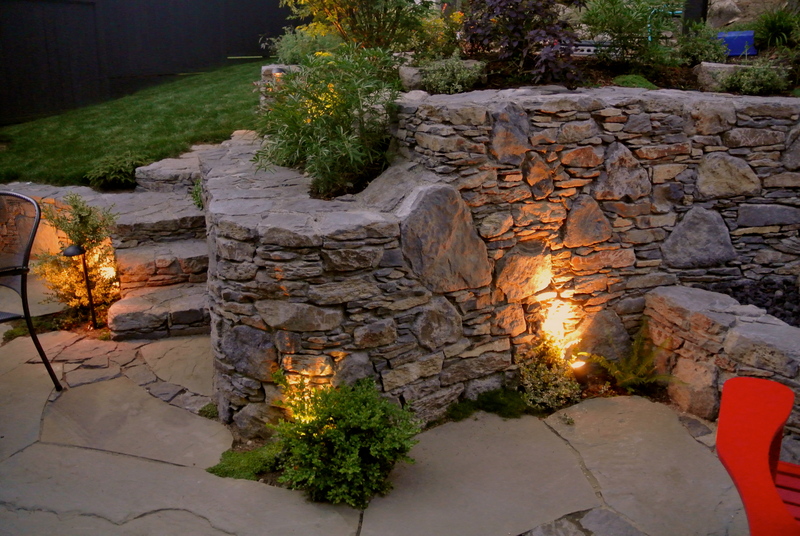 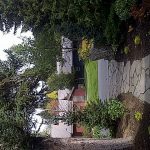 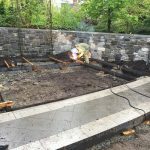 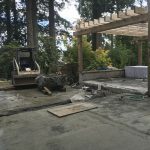 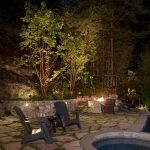 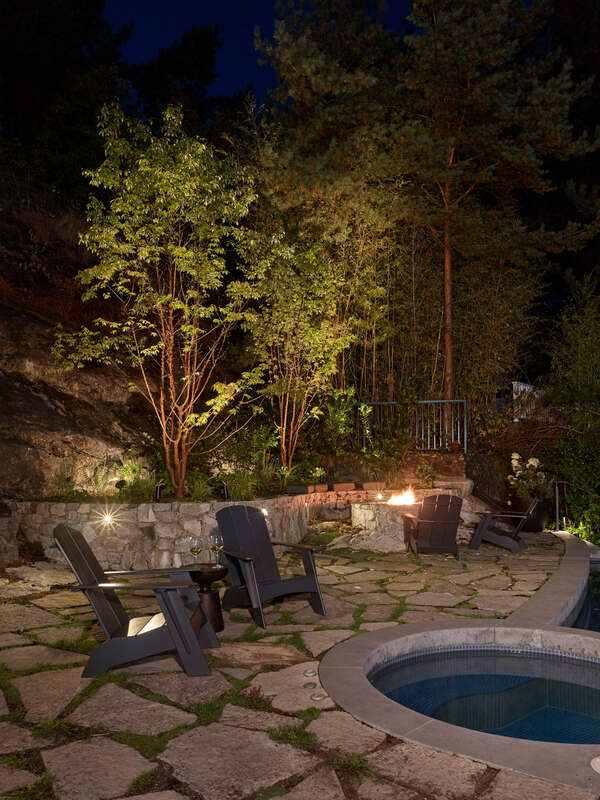 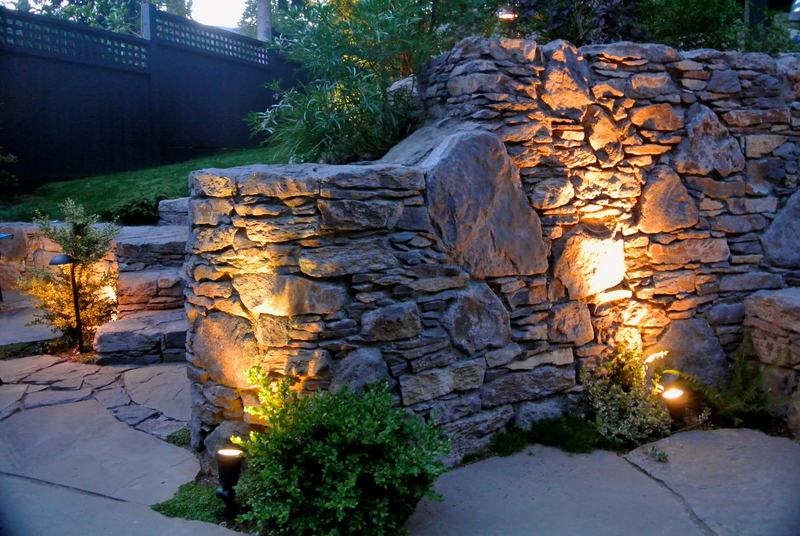 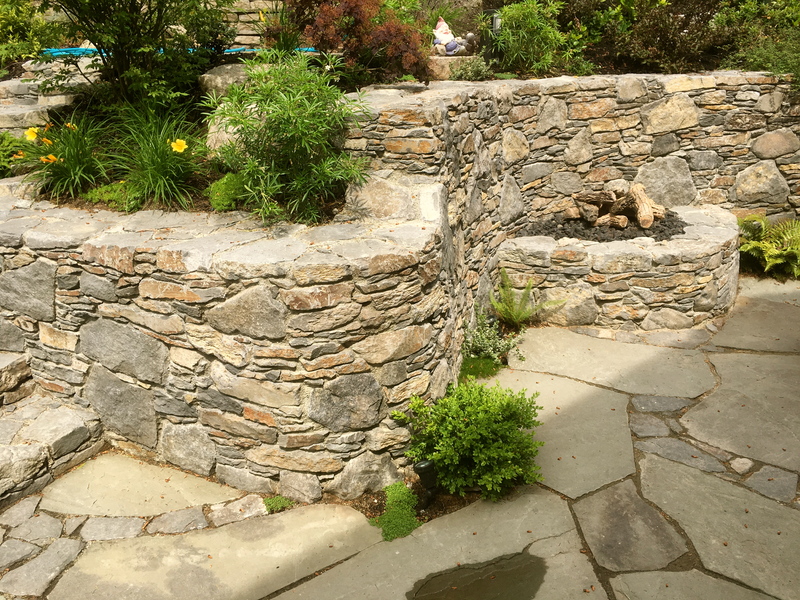 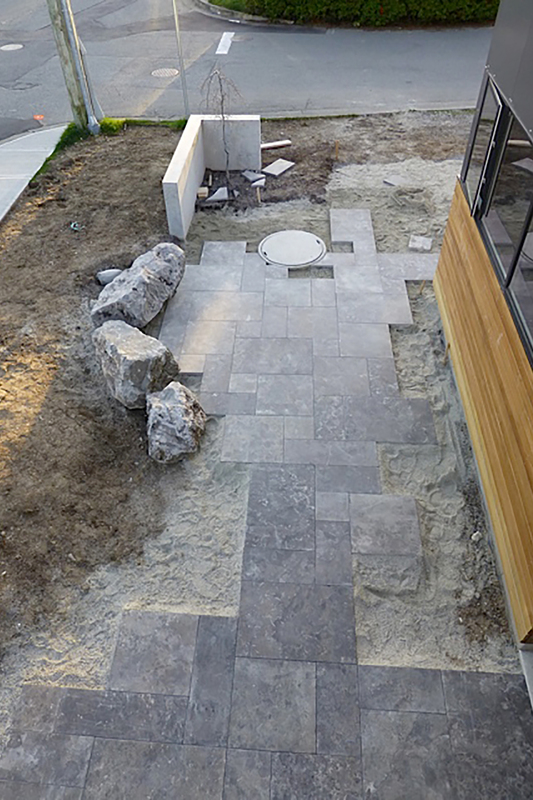 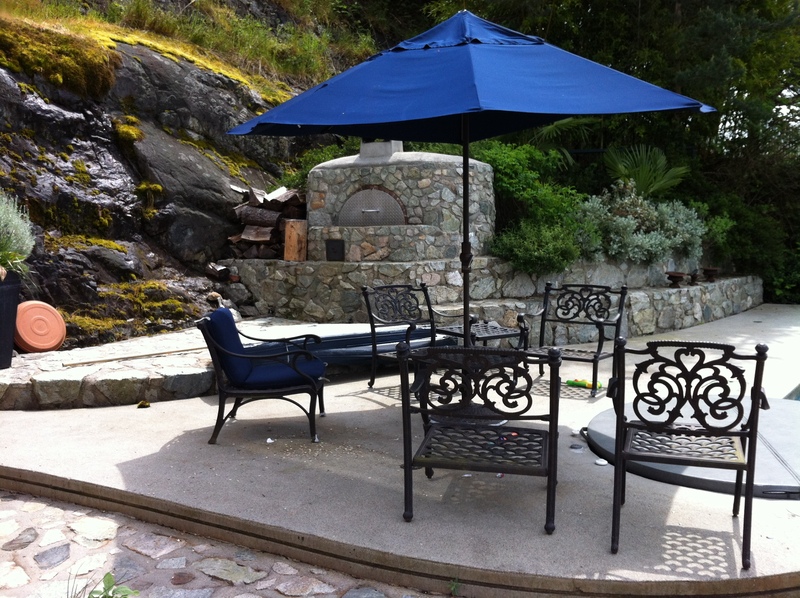 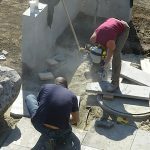 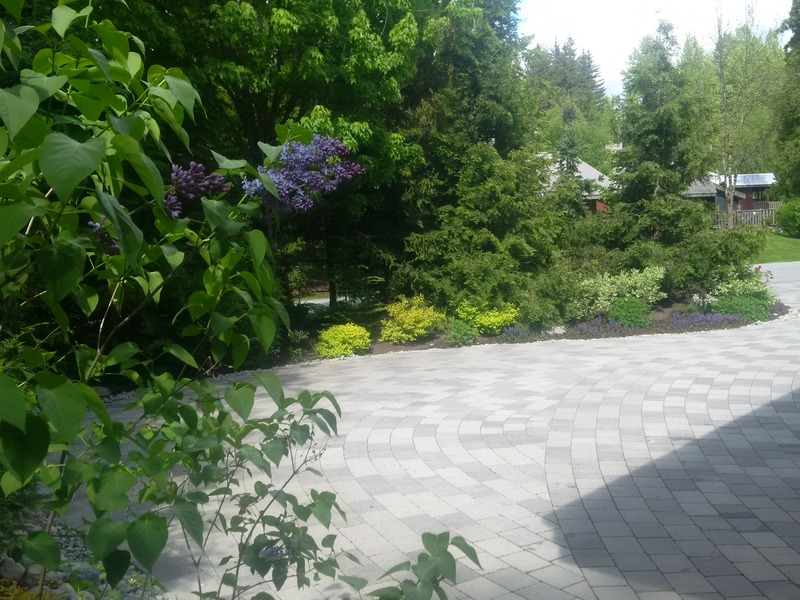 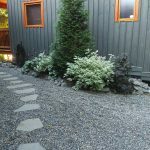 Since they were happy with the result, I was asked to do their backyard which included a built in BBQ, fire pit, and a lot of basalt rock work as well as installing bluestone and plantings. 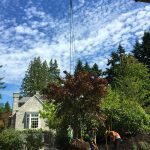 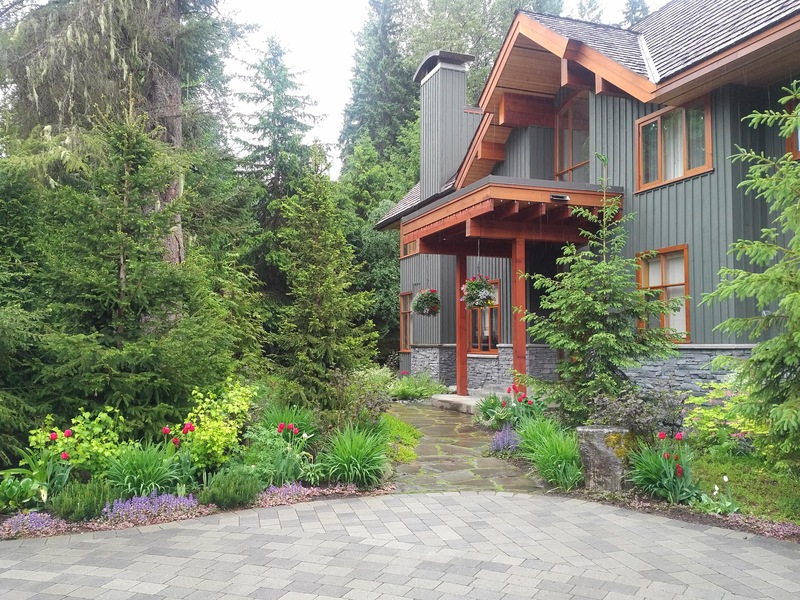 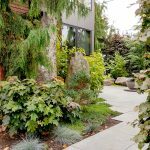 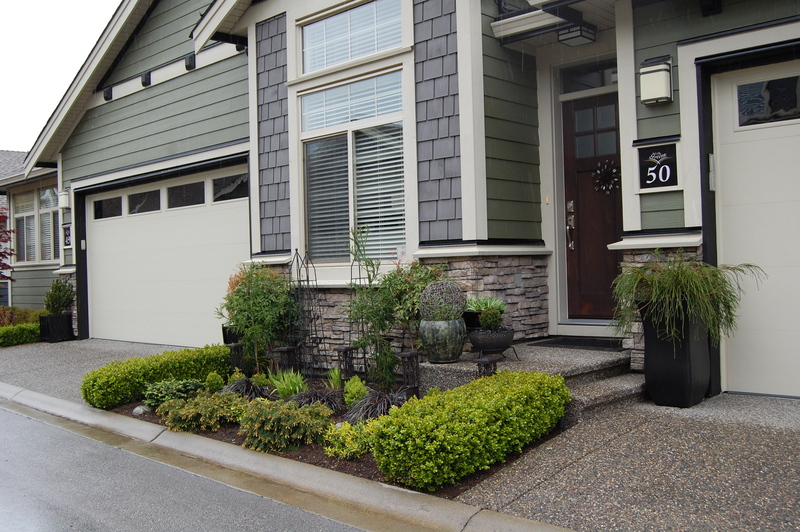 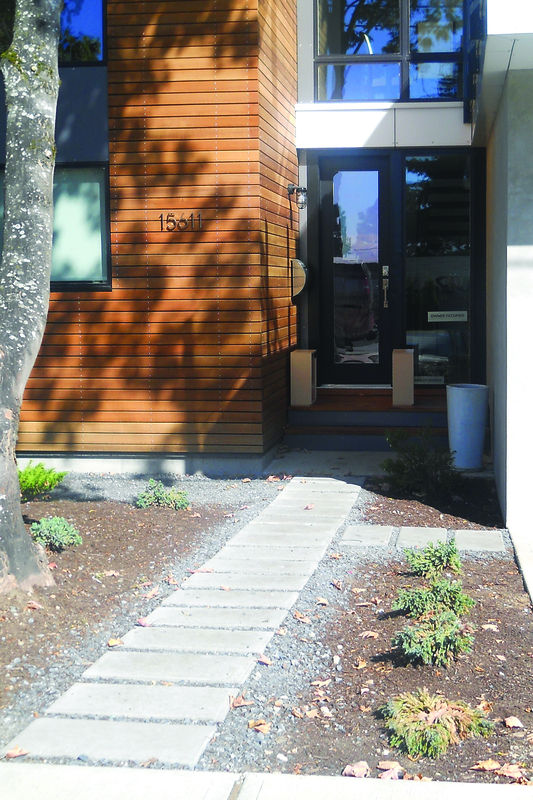 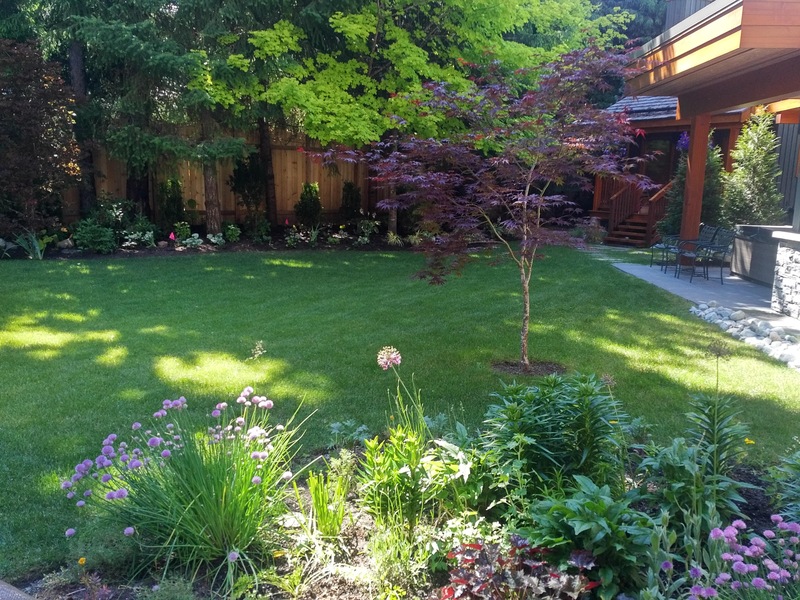 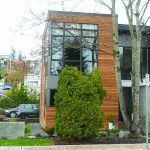 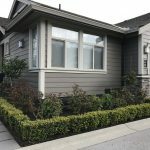 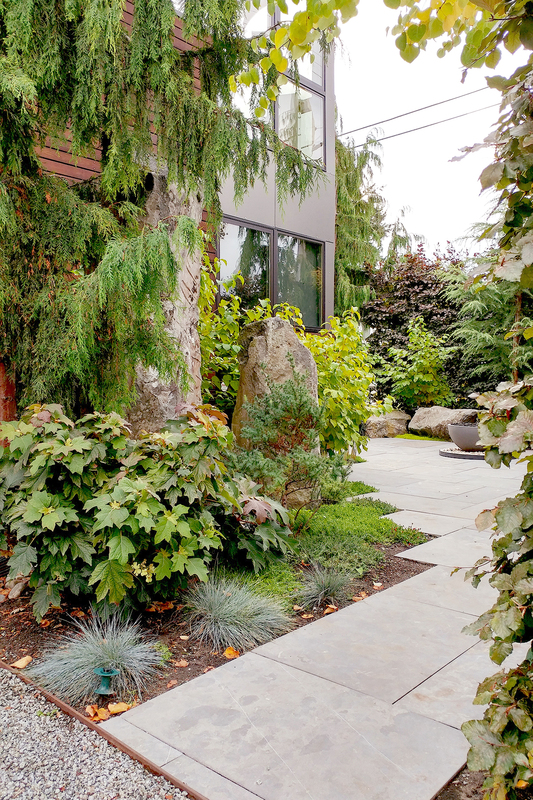 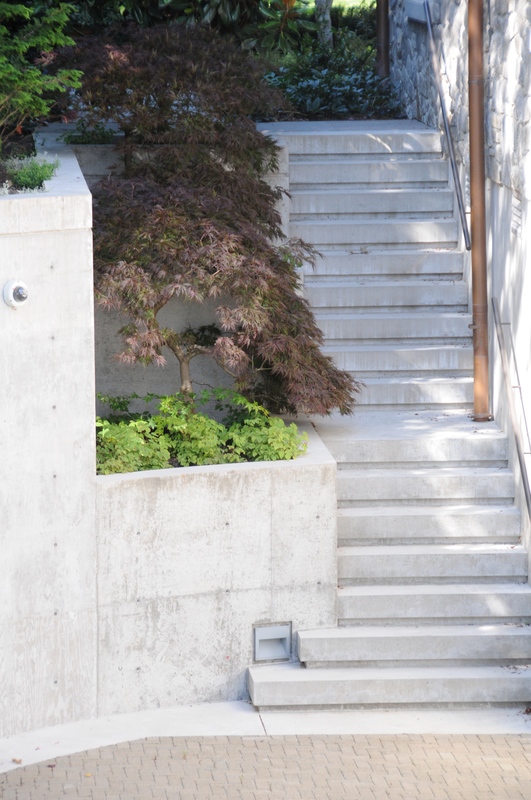 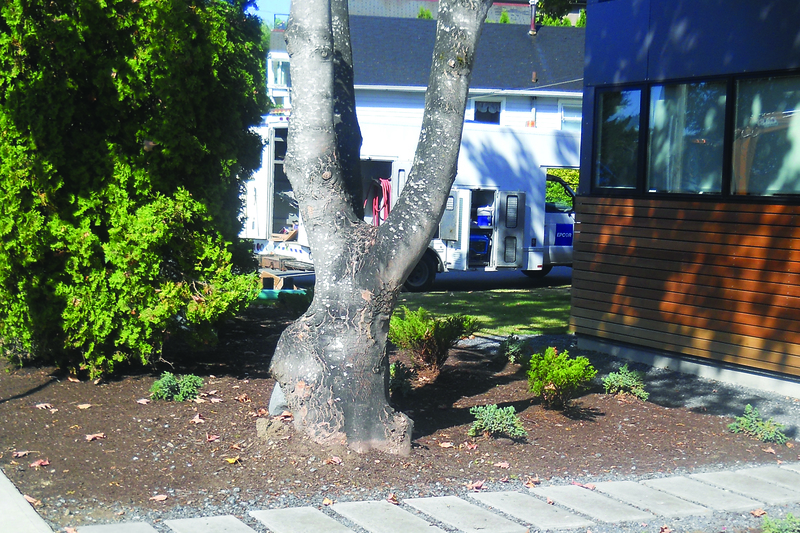 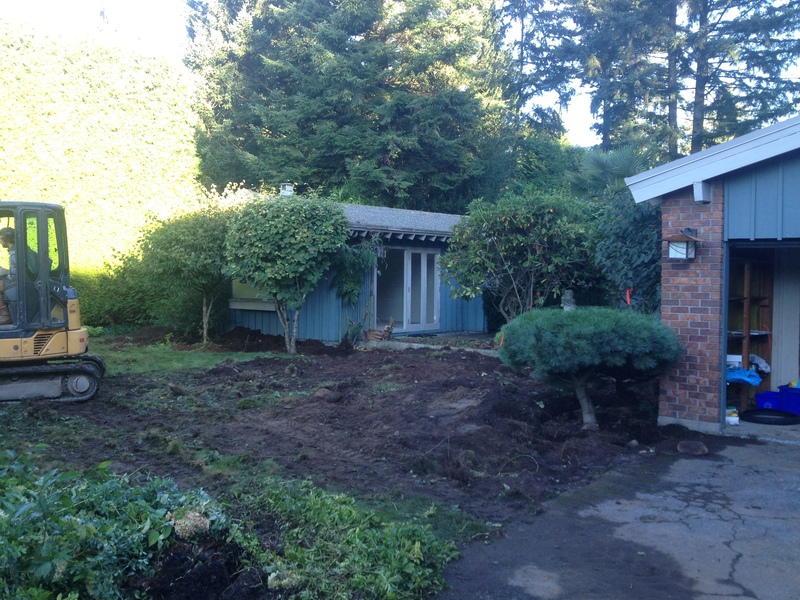 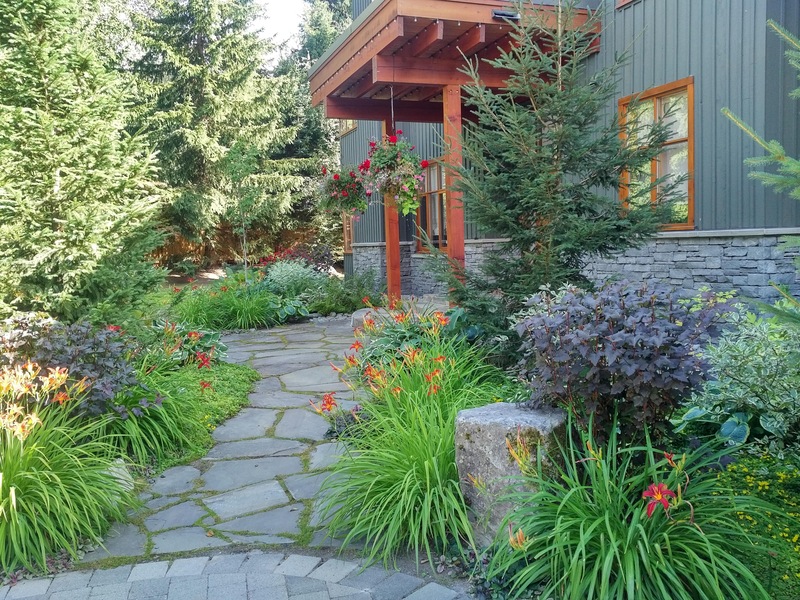 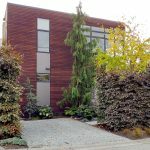 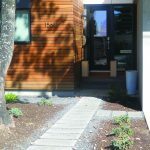 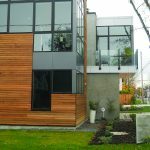 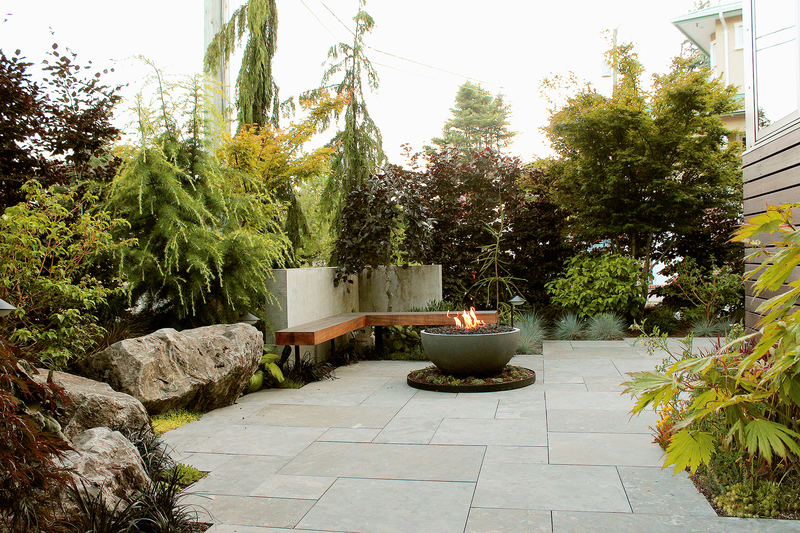 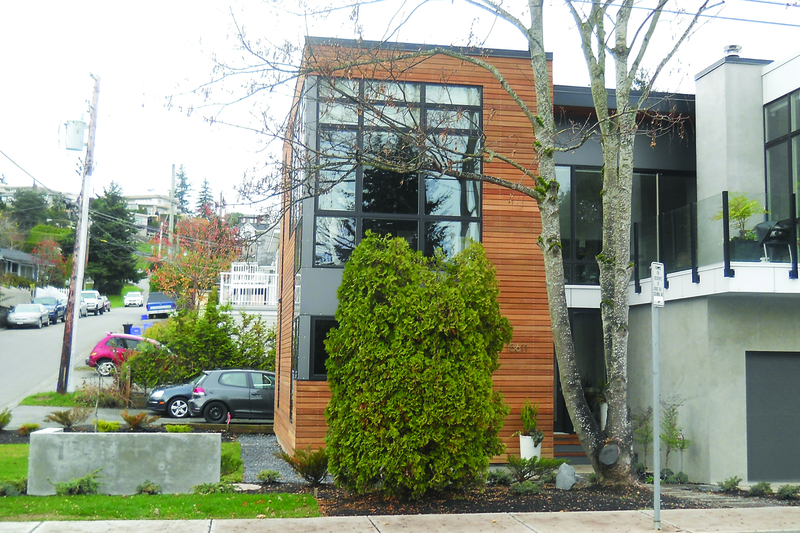 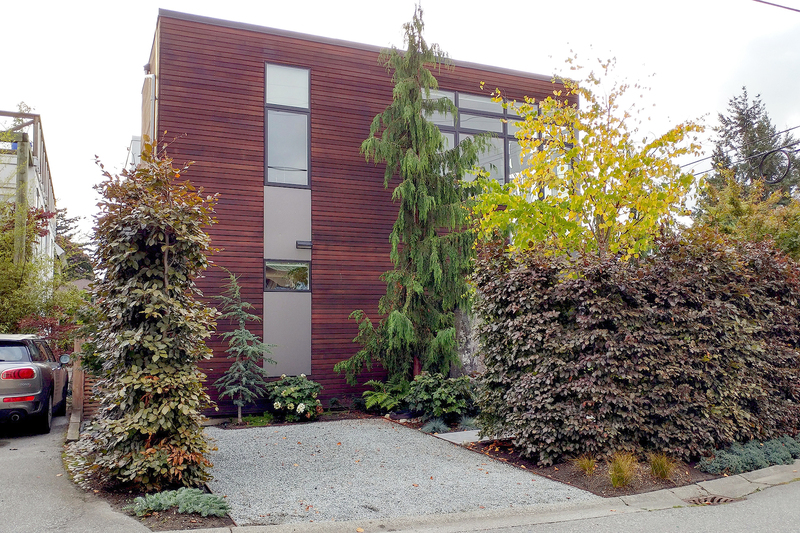 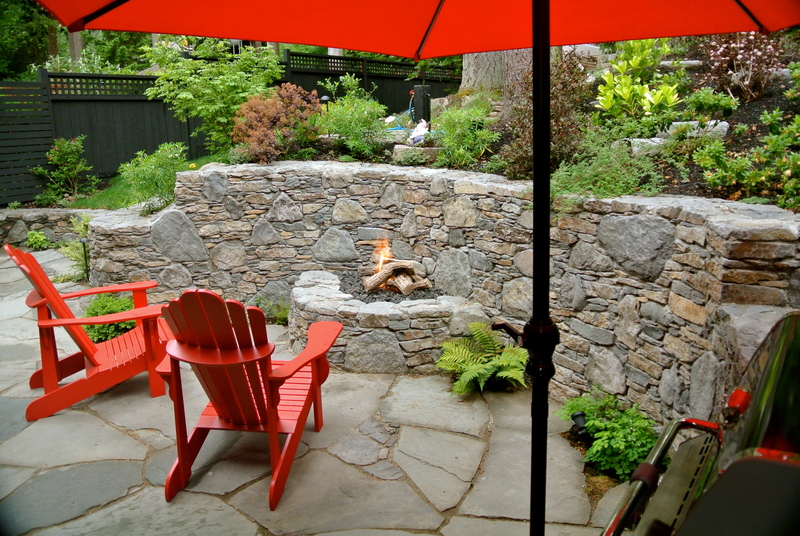 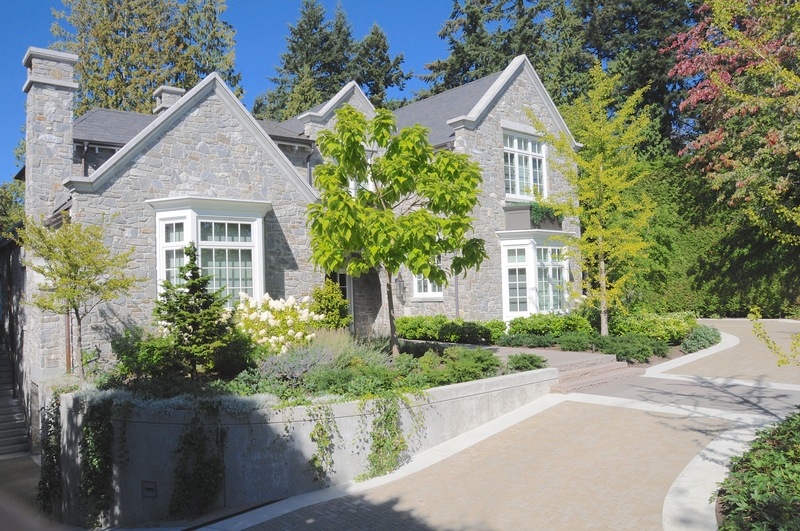 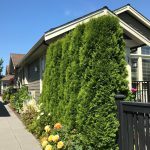 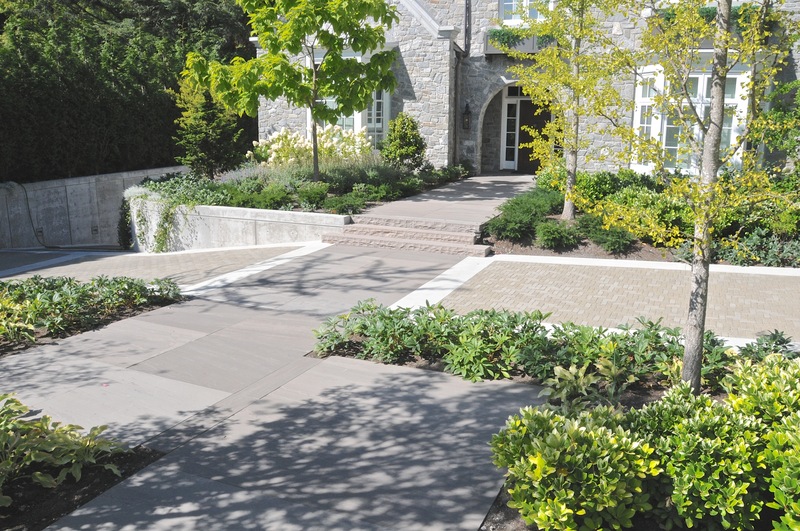 This wholesale landscape renovation doubled the usable exterior space adjacent to the house. 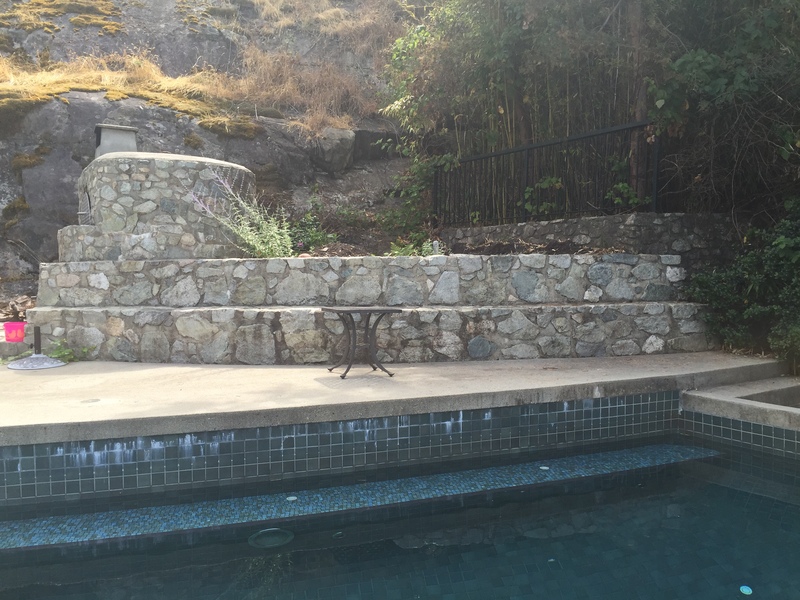 The pool and spa were updated and a new fire pit and outdoor kitchen were added. 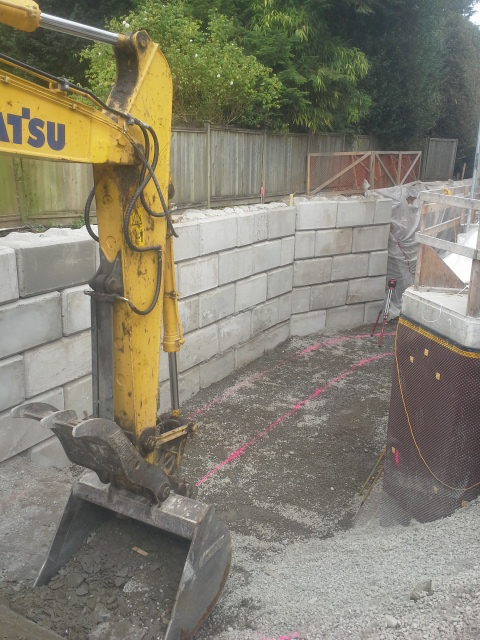 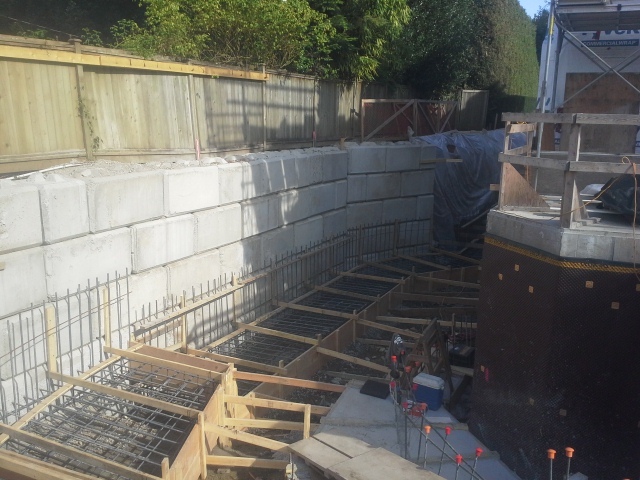 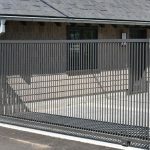 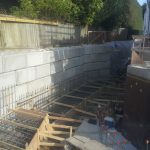 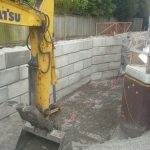 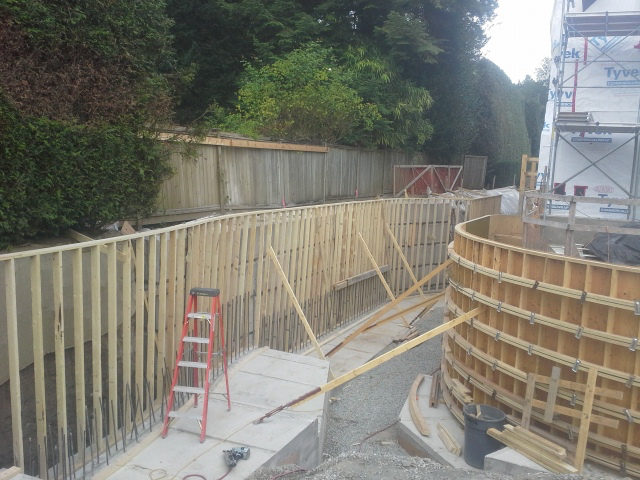 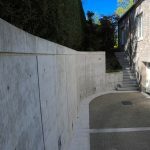 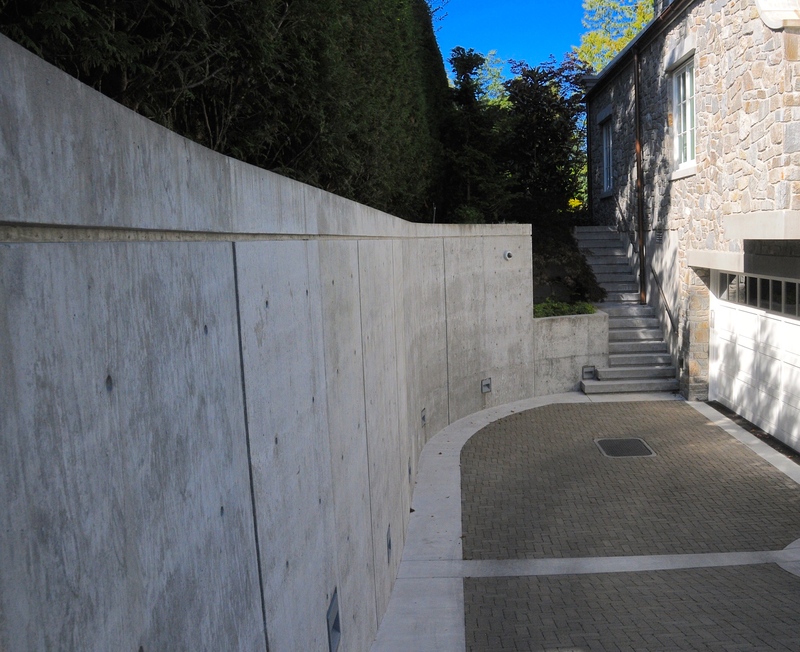 Extensive use of the tinted concrete for new walls formed the new structure of the site and created a substantial bunker space for storage and mechanical equipment. 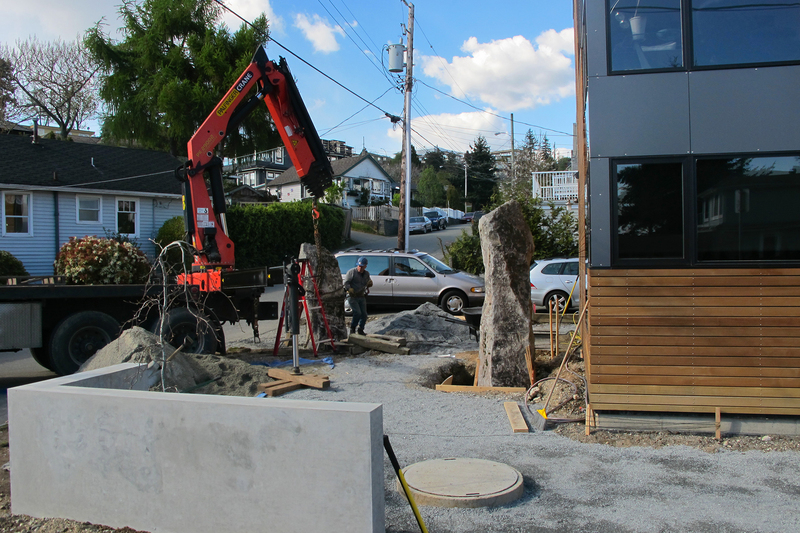 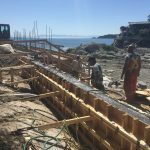 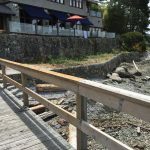 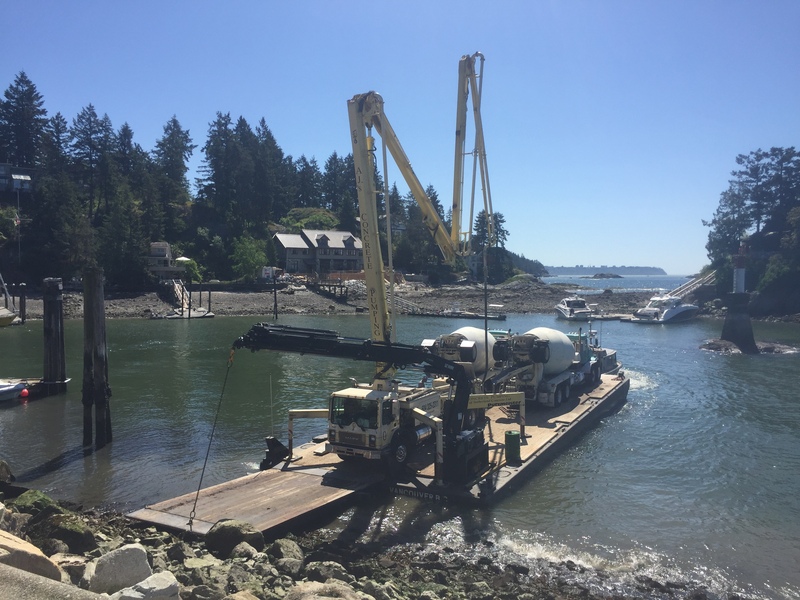 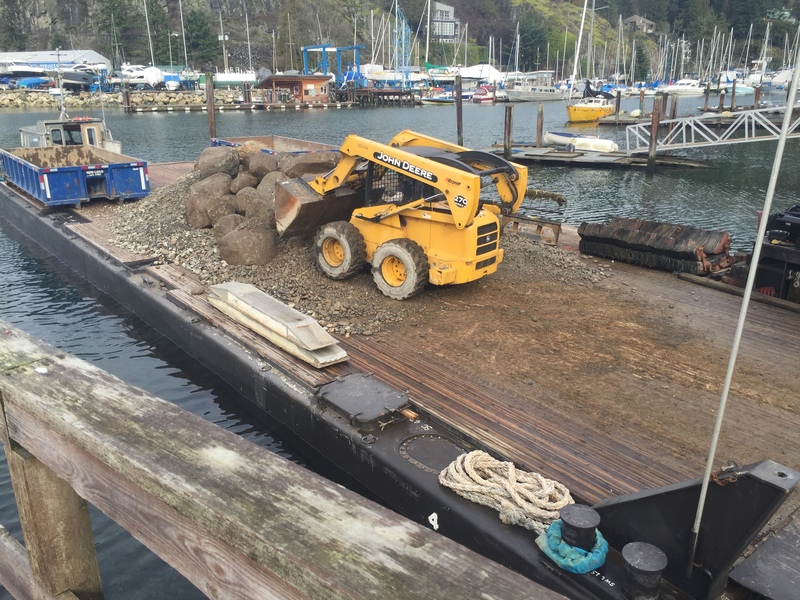 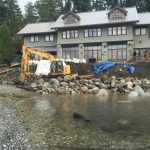 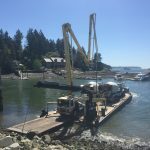 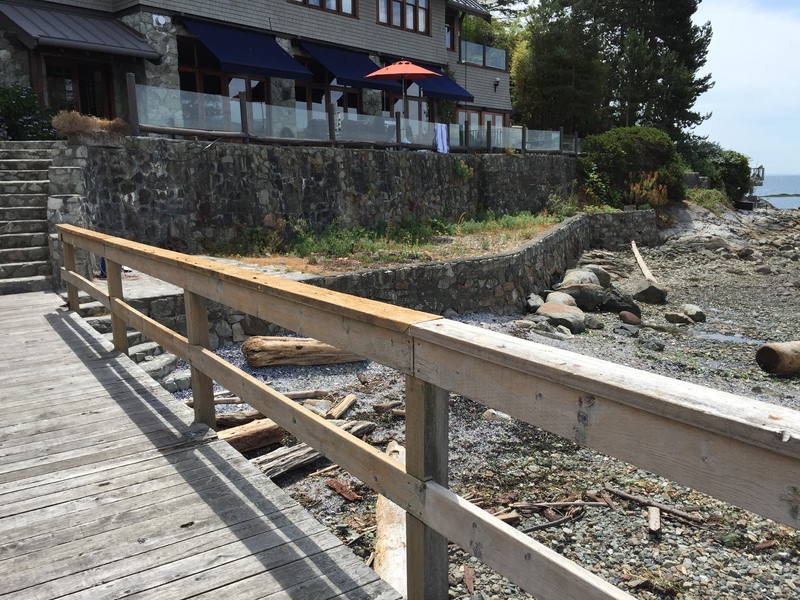 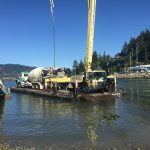 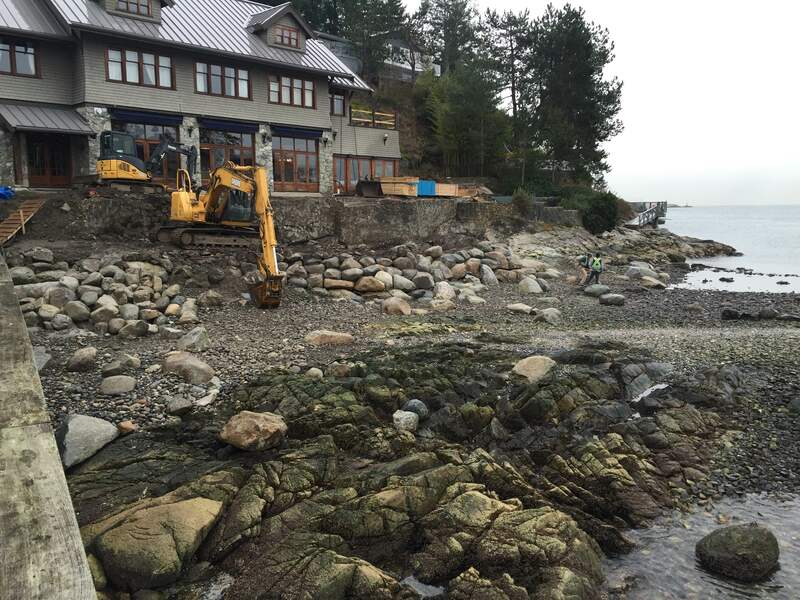 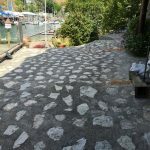 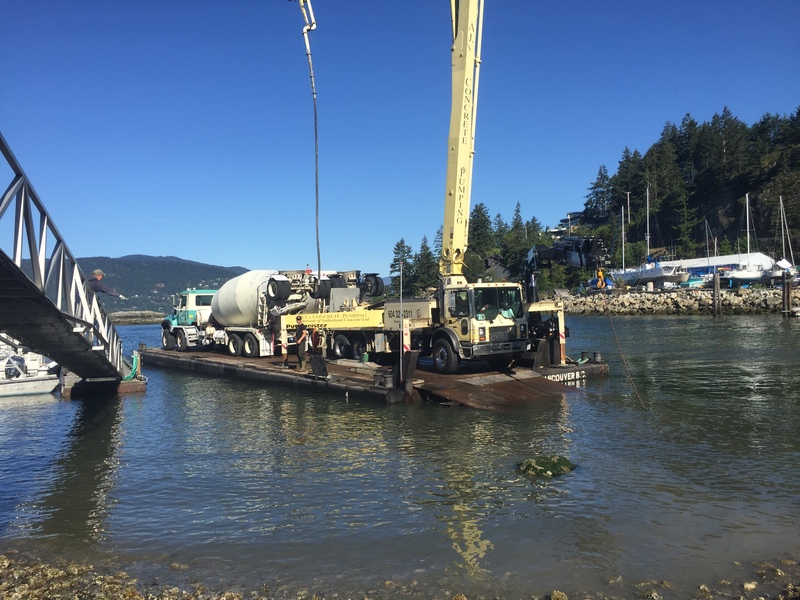 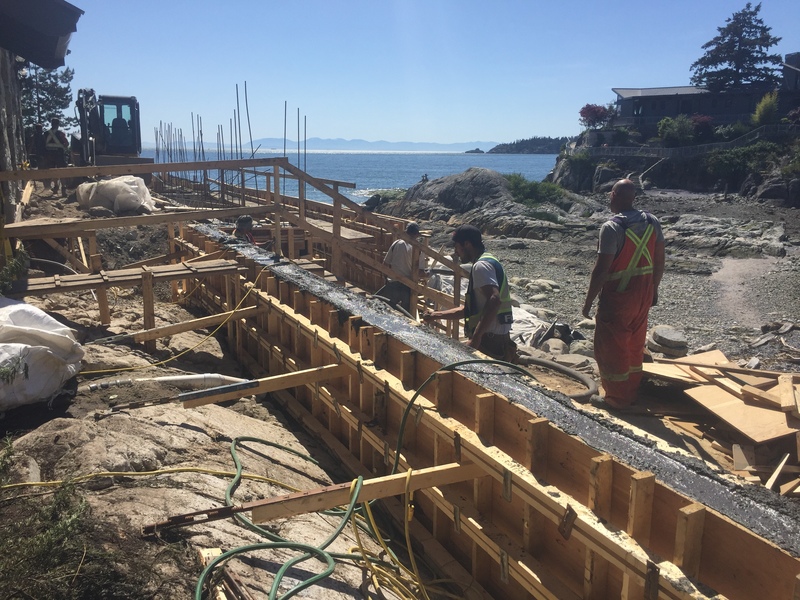 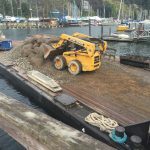 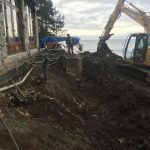 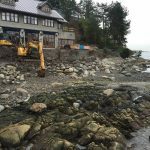 The opportunity was taken to replace the old seawall with natural boulders for habitat enhancement and erosion protection. 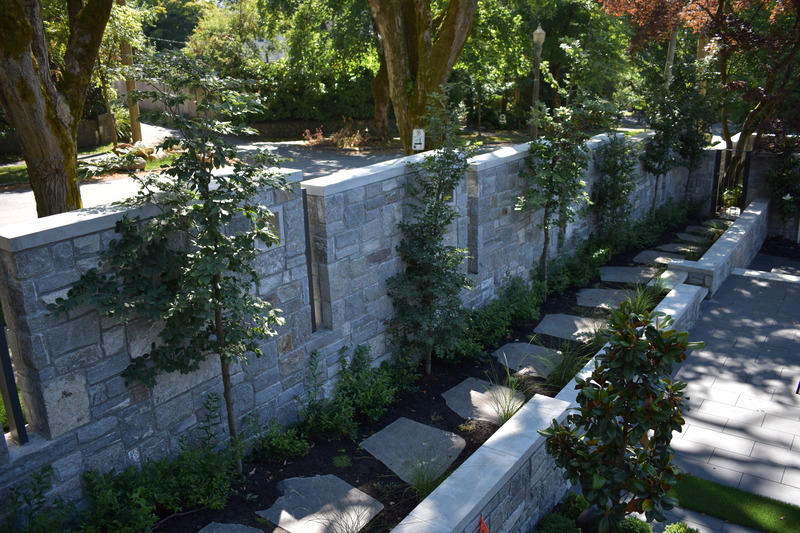 All new planting, irrigation and lighting complete the space. 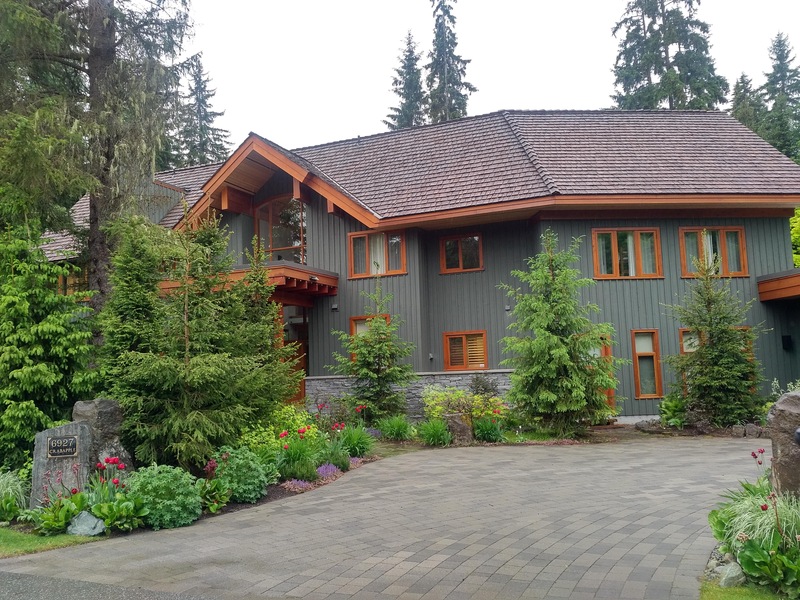 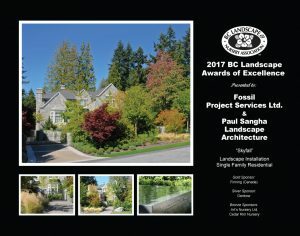 Skyfall was an extensive renovation of an existing home. 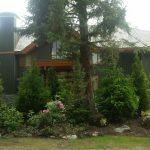 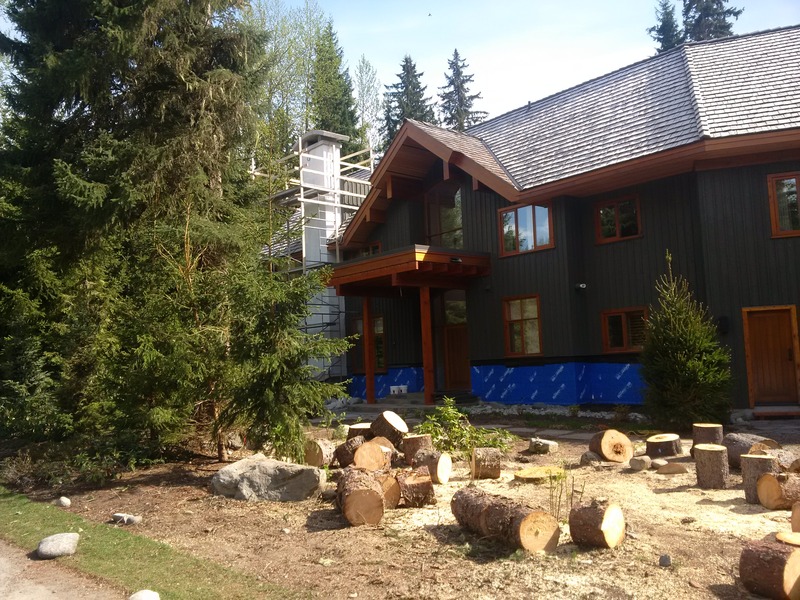 The homeowners wanted a comfortable home for their growing family and a tranquil and natural environment to come home to. 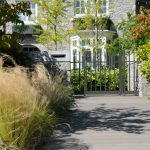 It was important to retain the existing character of the property and to have the home and garden appear as though it had always been there. 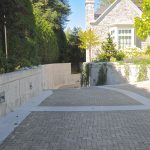 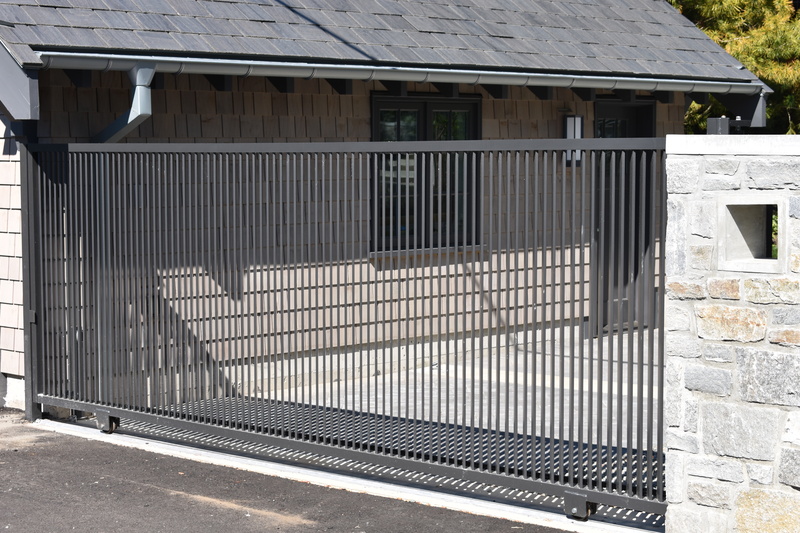 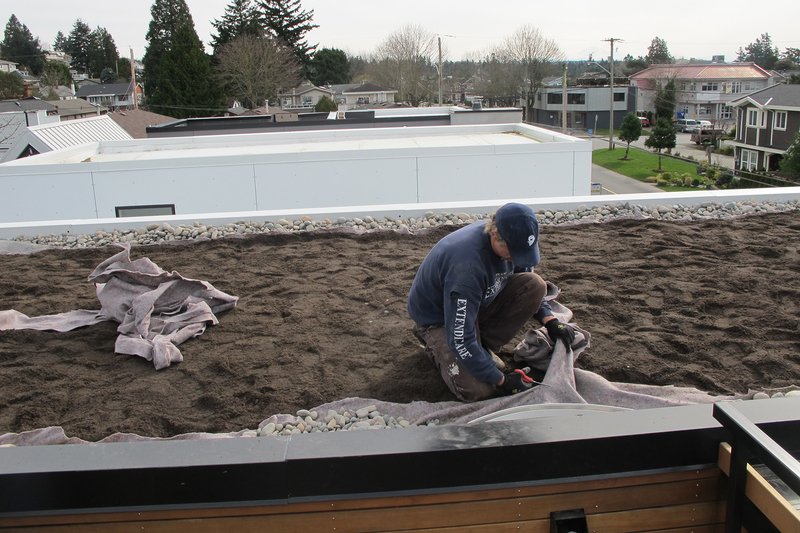 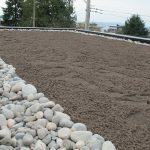 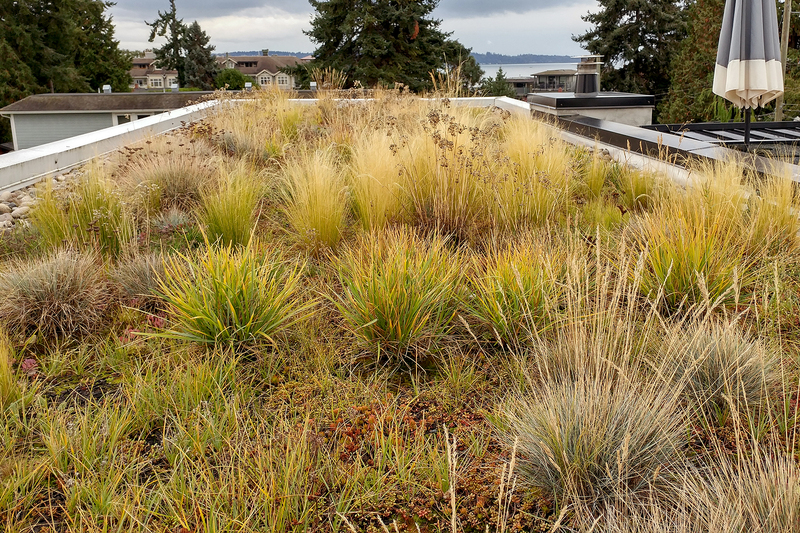 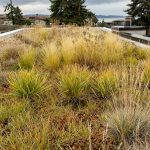 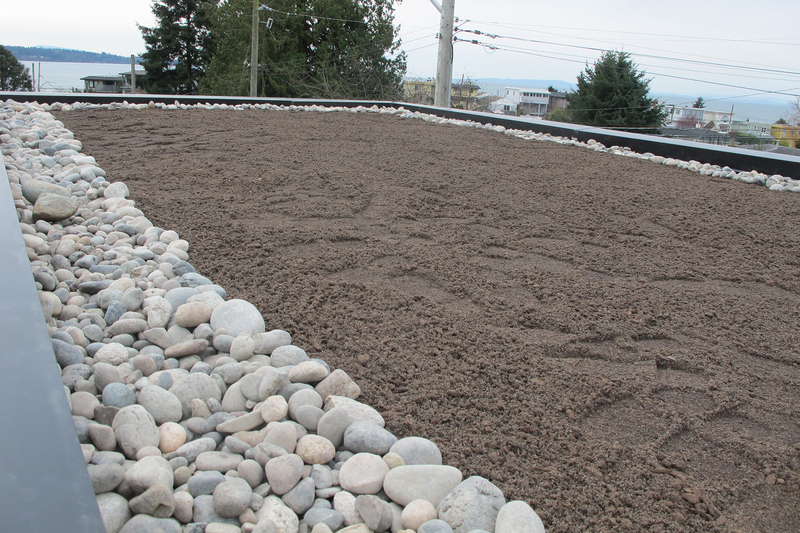 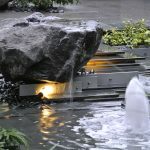 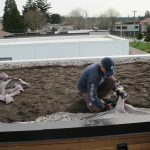 This was achieved through the retention and planting of large scale plant materials and the hardscape material and elements utilized for the project. 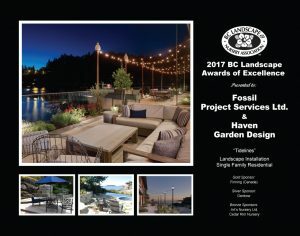 Fossil Project Services was brought on-board to complete the renovation of the entire landscape, including rough grading, drainage, construction and installation of all hardscape and softscape elements, multidisciplinary landscape construction capabilities, including tile setting, form-working, stone masonry, concrete finishing, irrigation and planting. 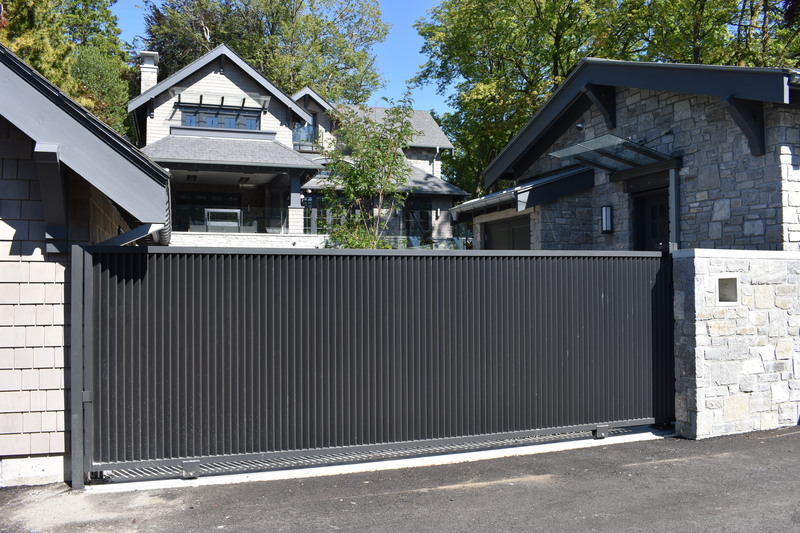 A grand estate, complementing the heritage of the neighborhood while emanating contemporary values, proudly assumes its role as a sentry on a prominent corner property. 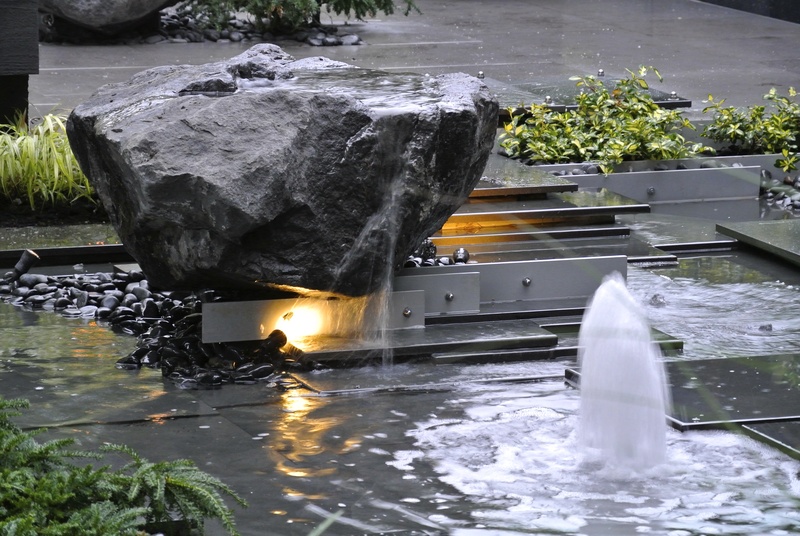 This landscape design and construction played with key elements of the home while defining itself with unique forms of screening and softening which stimulate the senses. 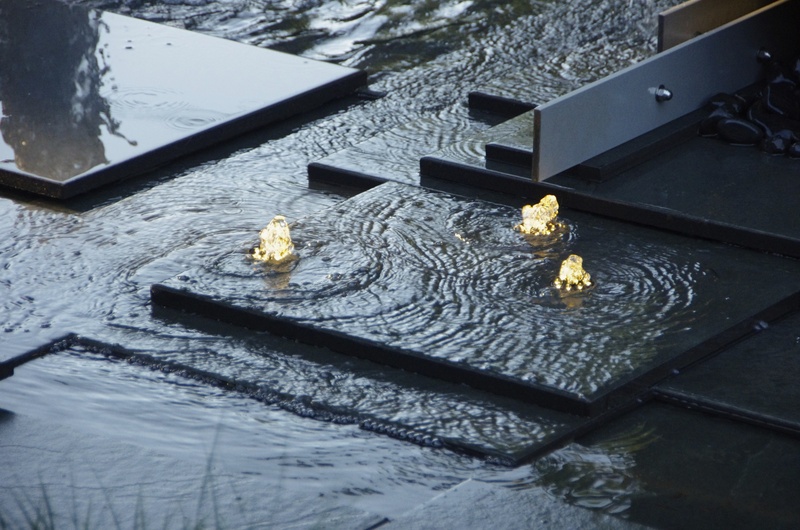 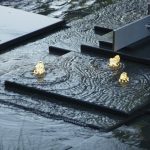 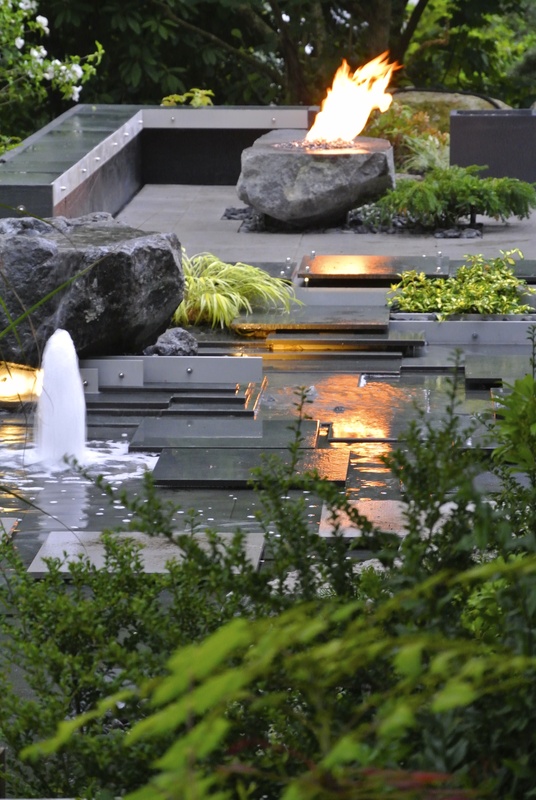 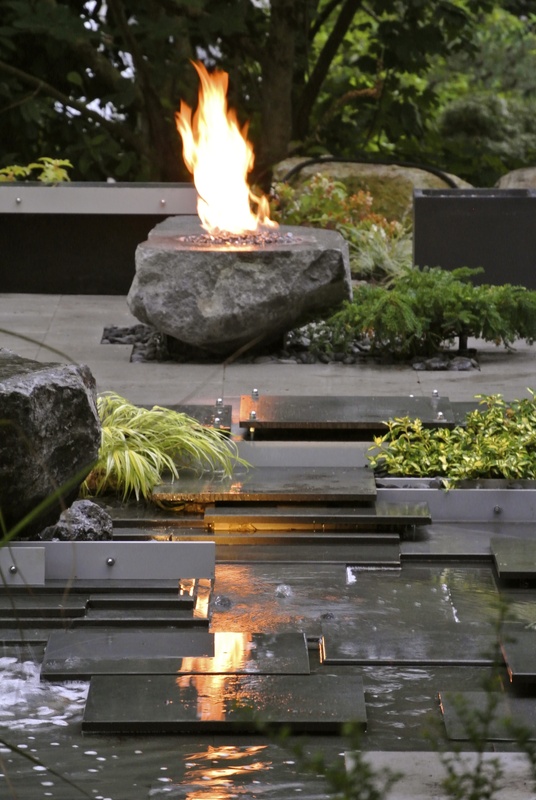 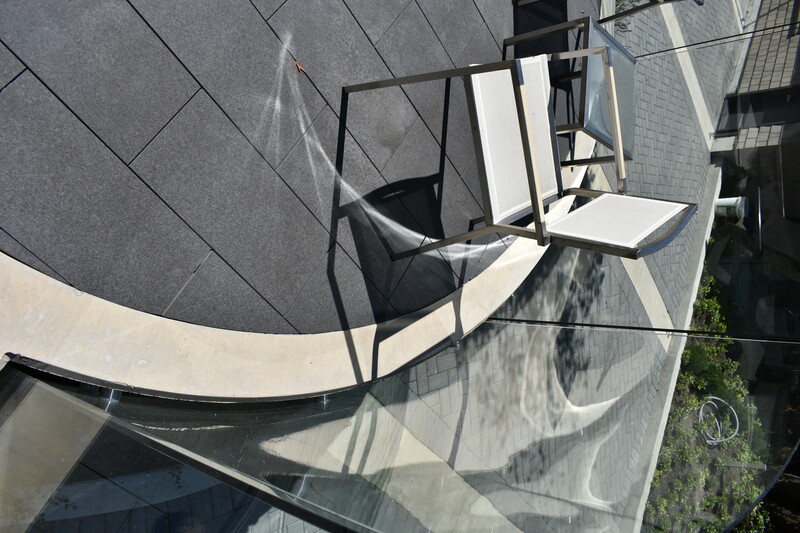 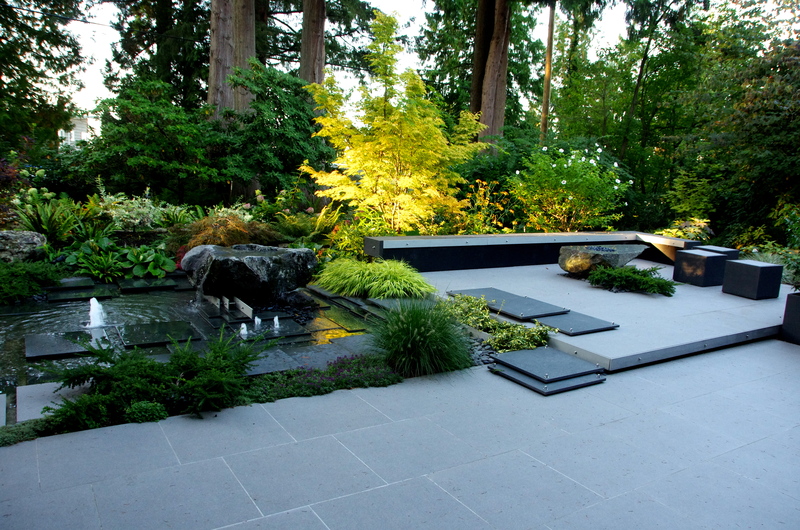 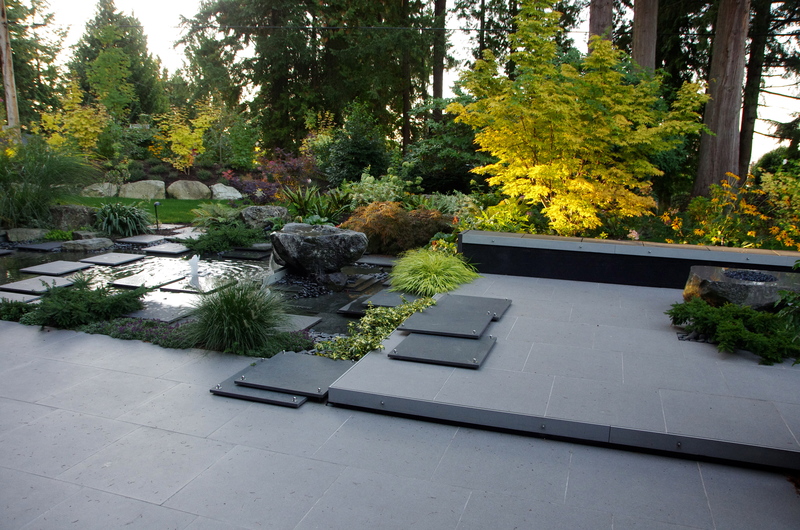 Very few properties can integrate both architecture and landscape architecture with flow and seamless transition. 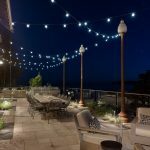 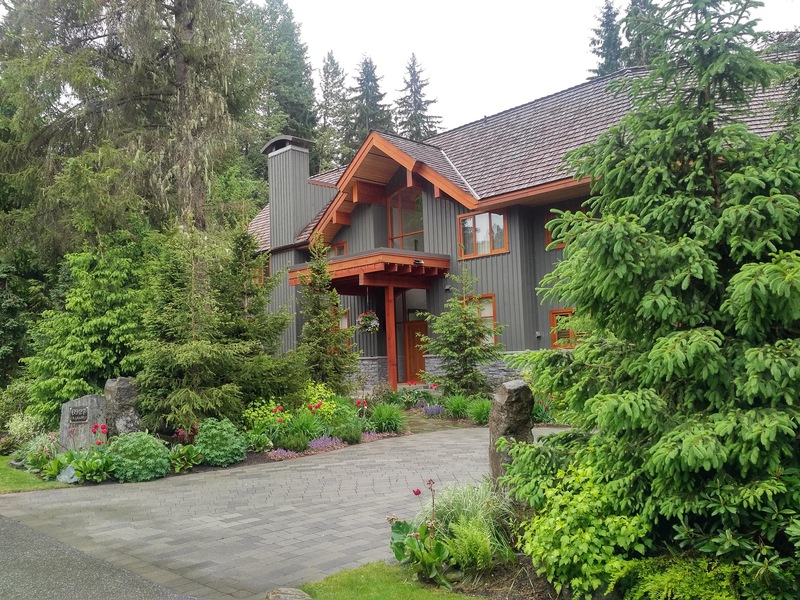 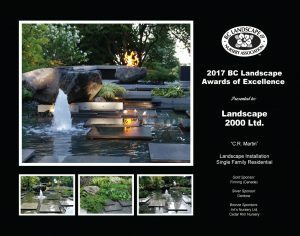 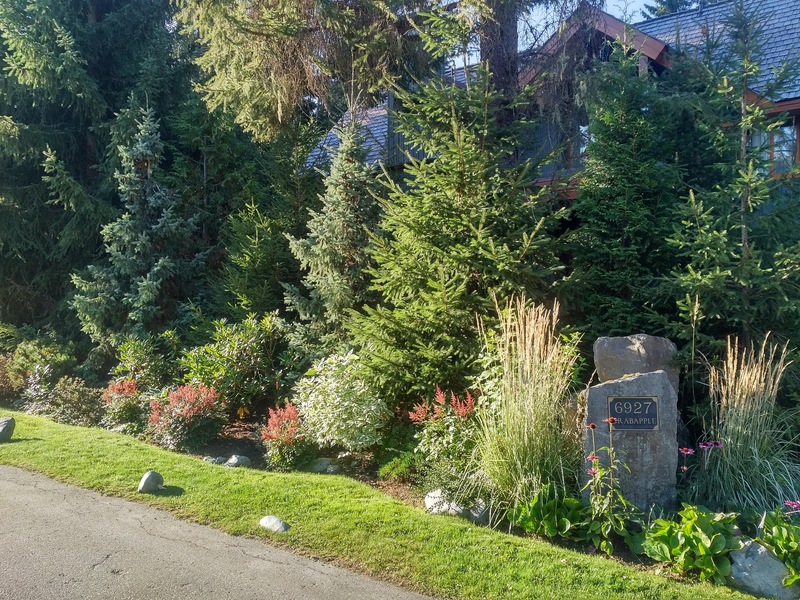 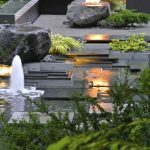 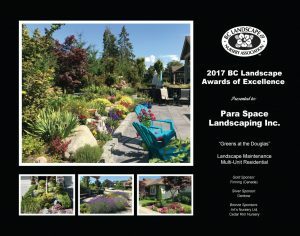 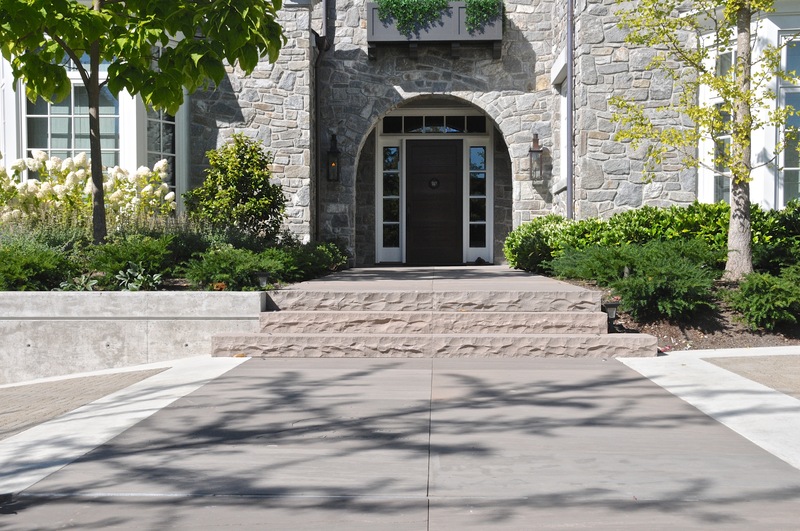 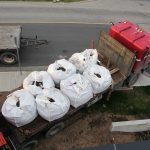 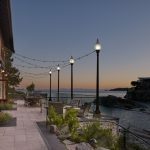 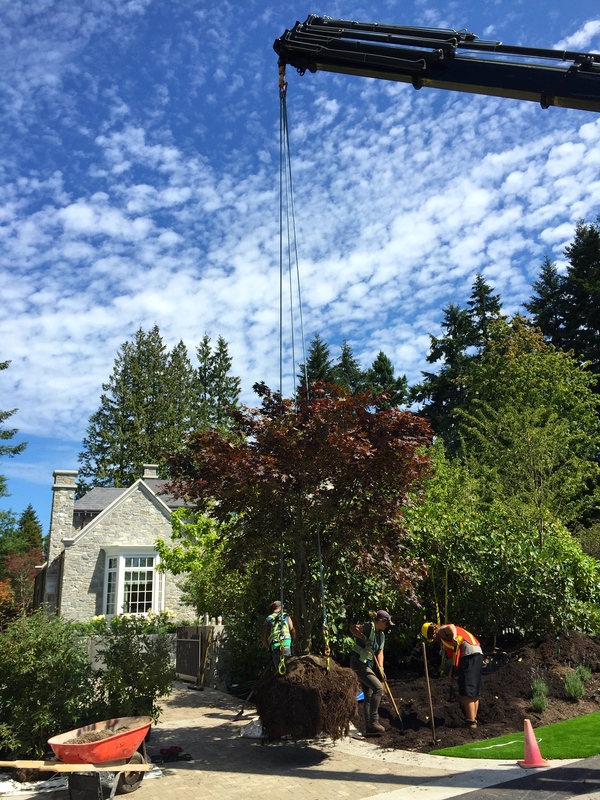 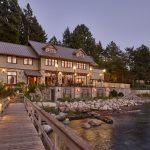 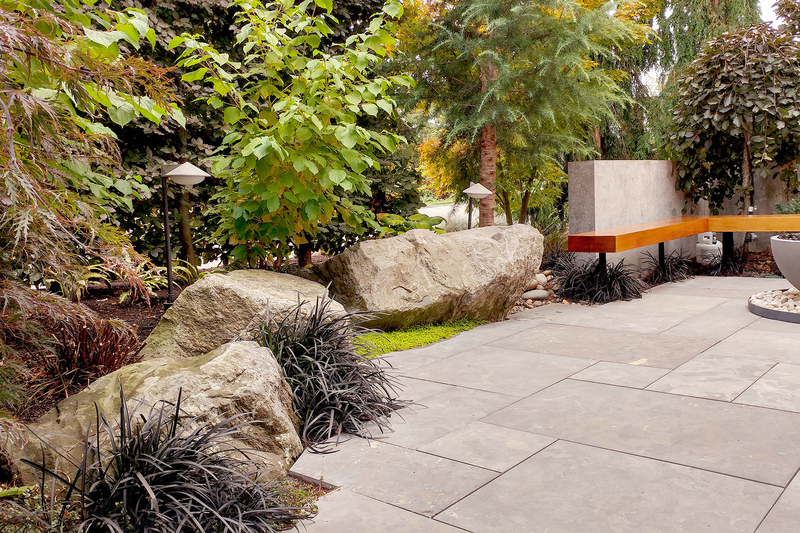 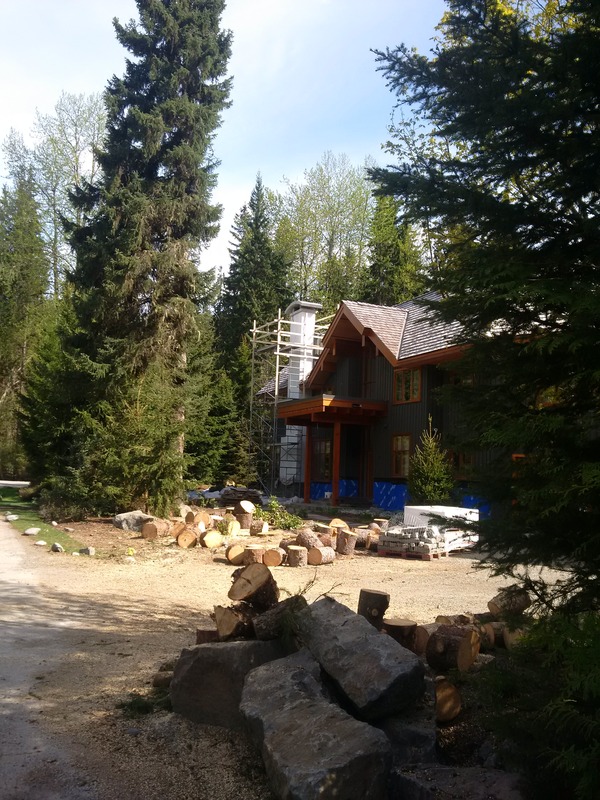 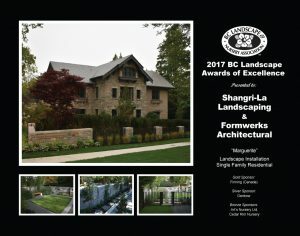 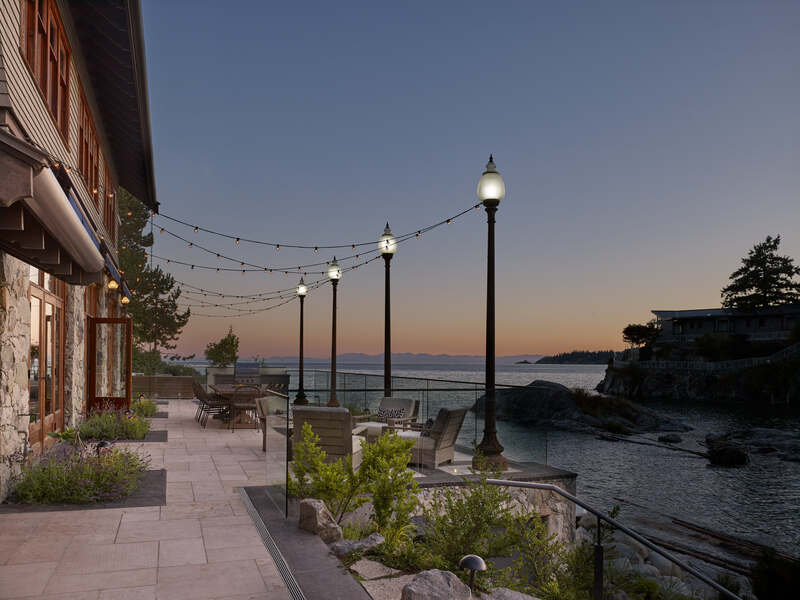 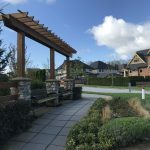 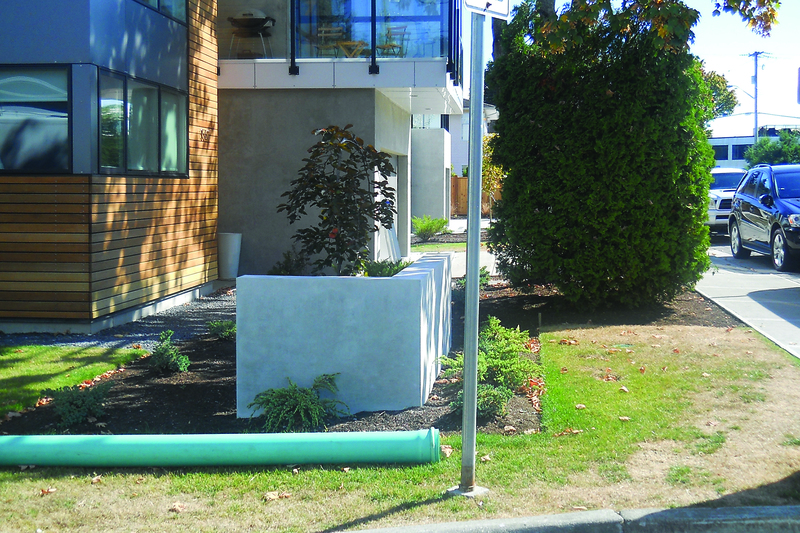 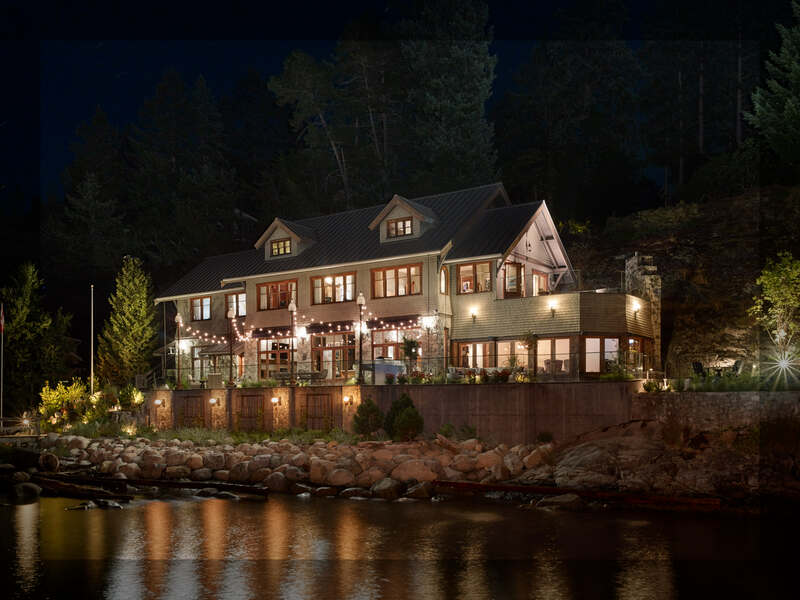 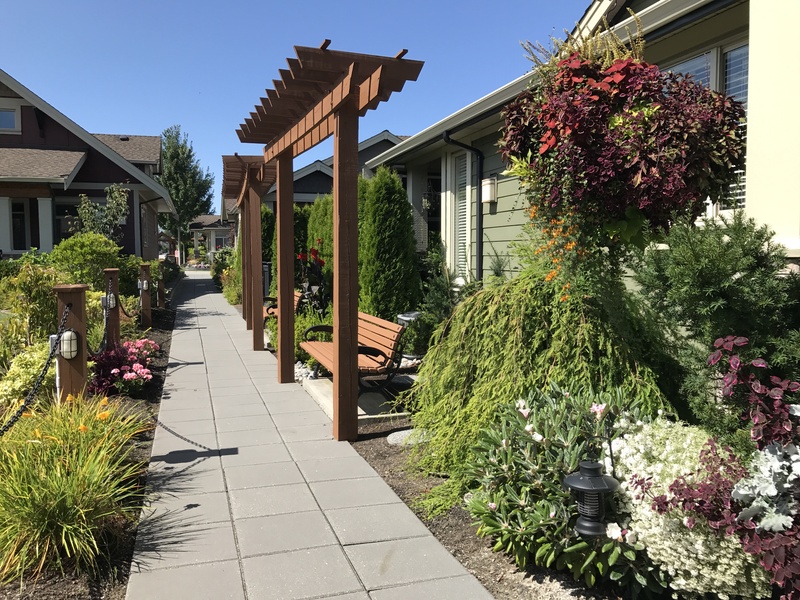 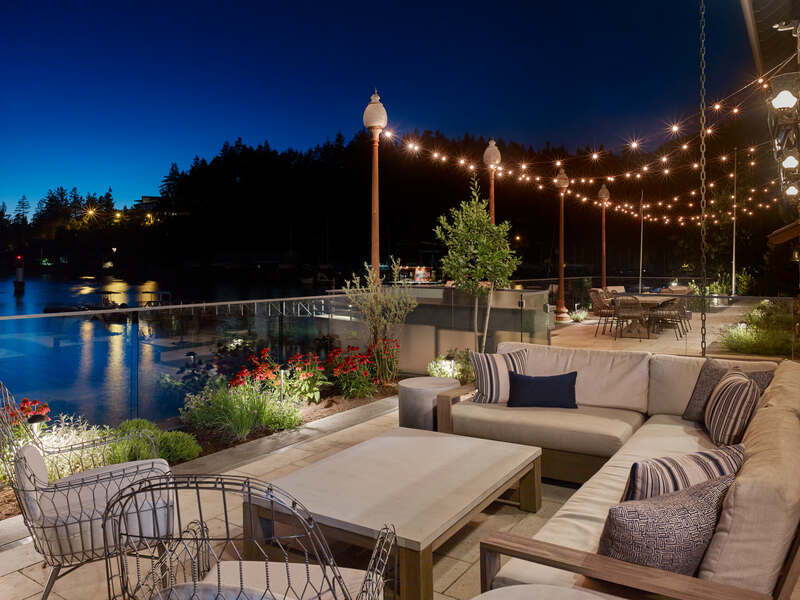 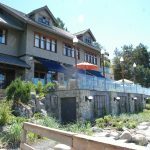 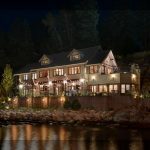 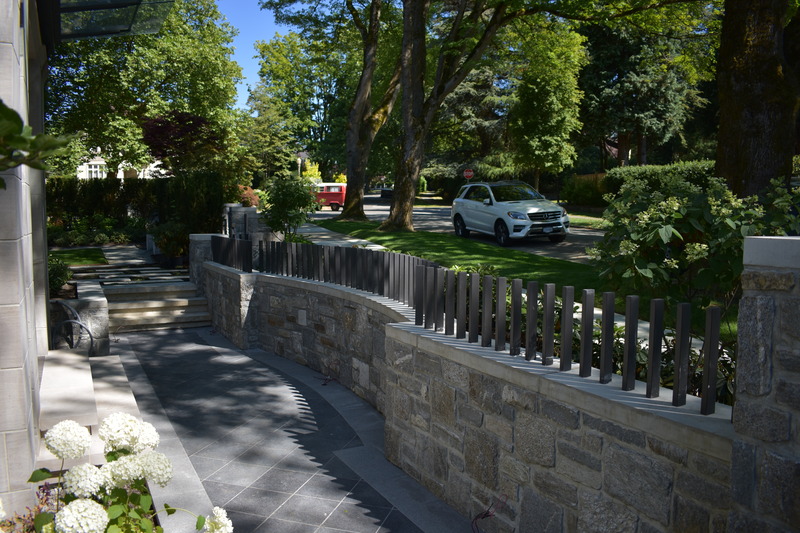 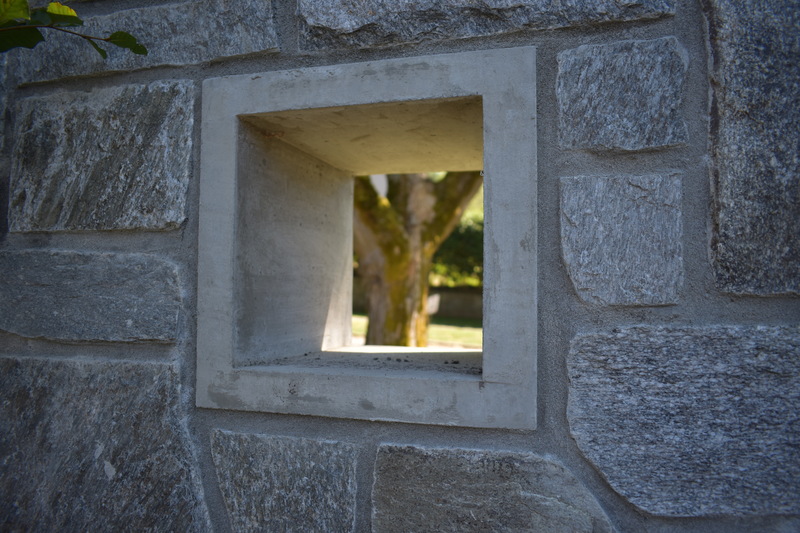 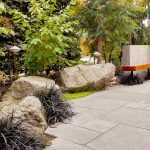 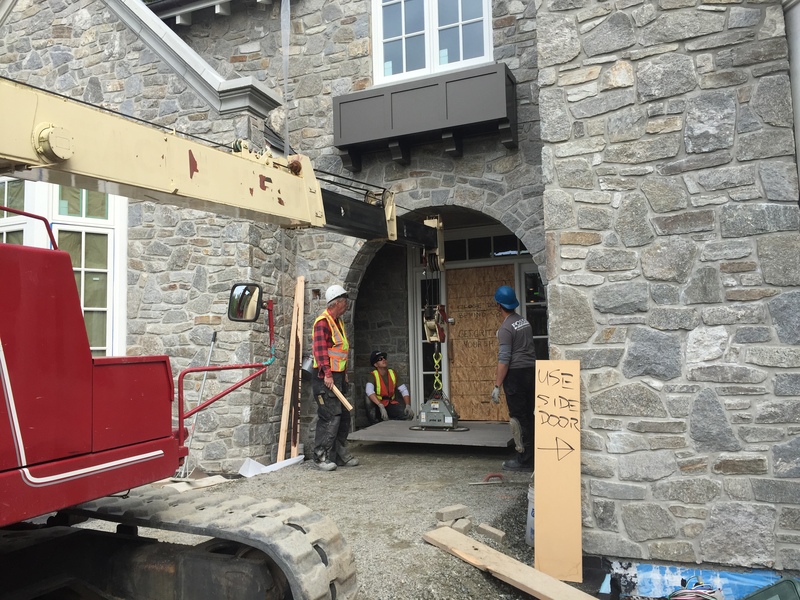 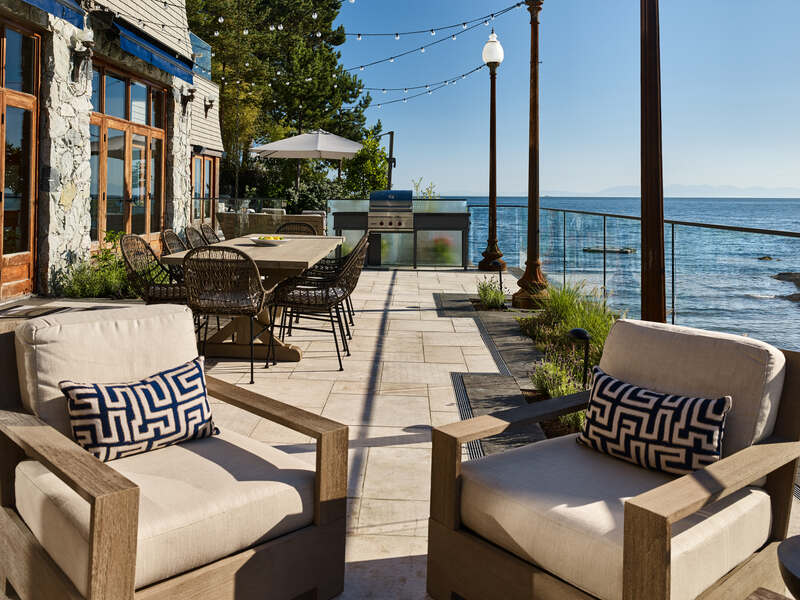 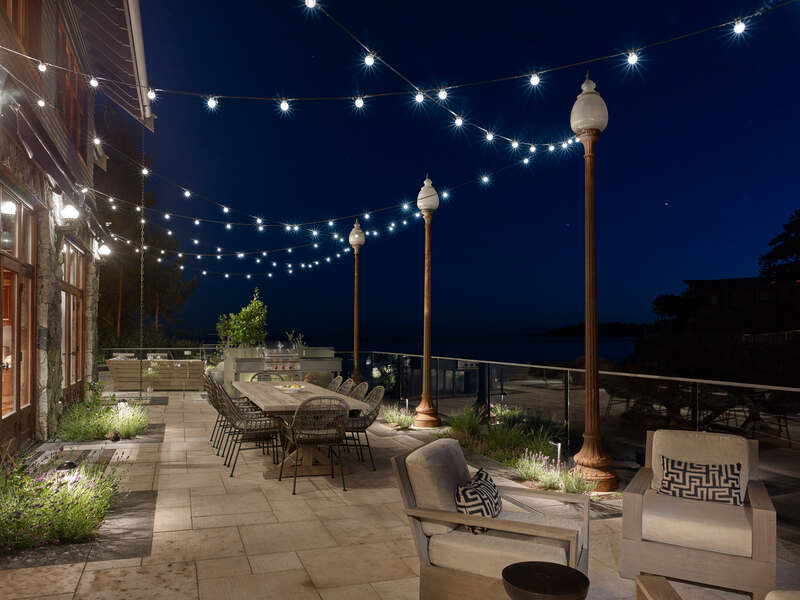 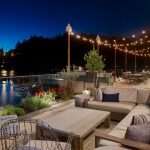 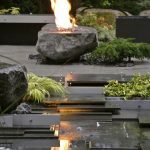 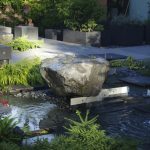 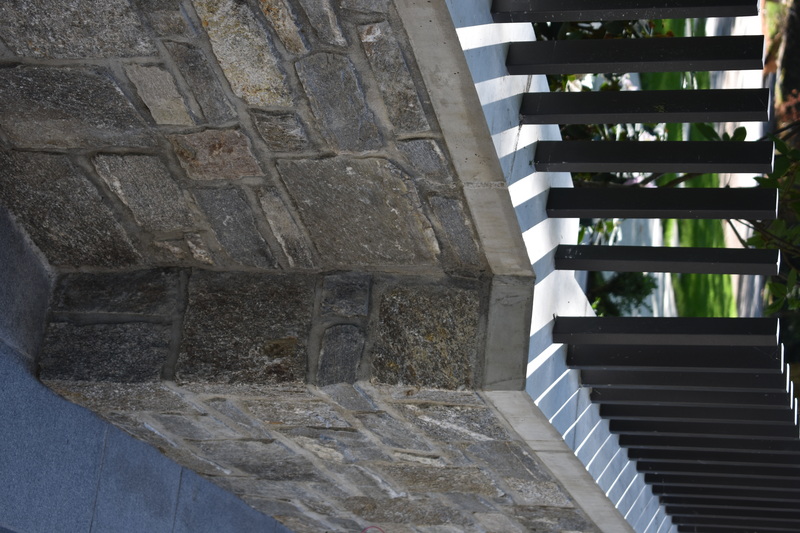 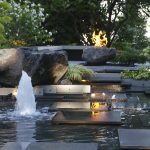 As the chosen landscape contractor, Shangri-la showcased its multidisciplinary landscape construction capabilities, including tile setting, form-working, stone masonry, concrete finishing, irrigation and planting. 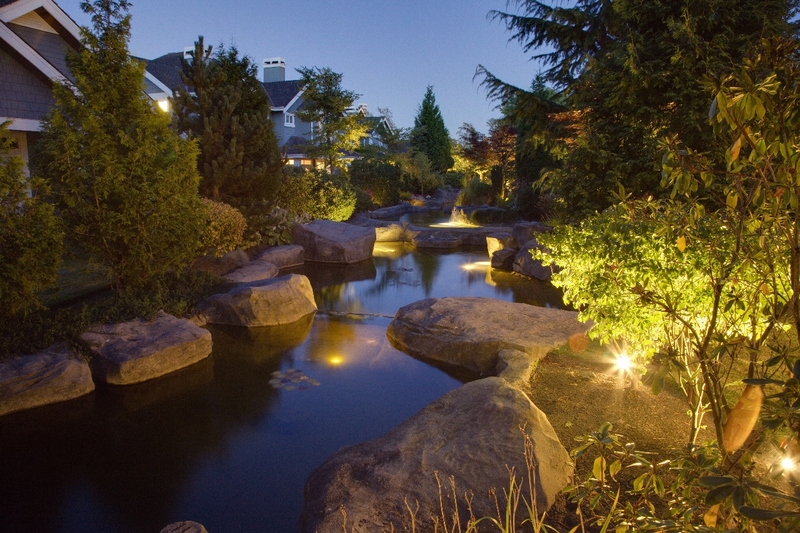 We also facilitated the coordination between pool and light contractors. 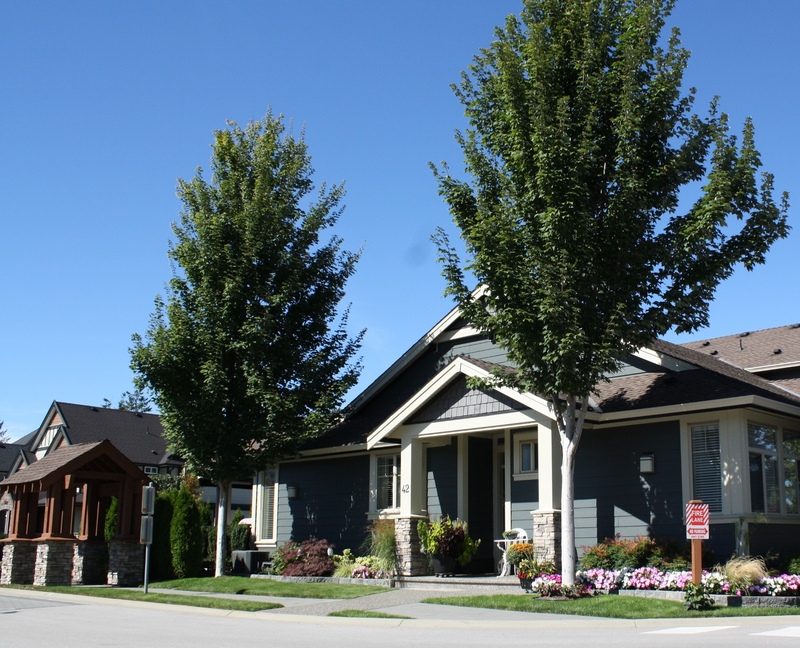 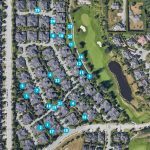 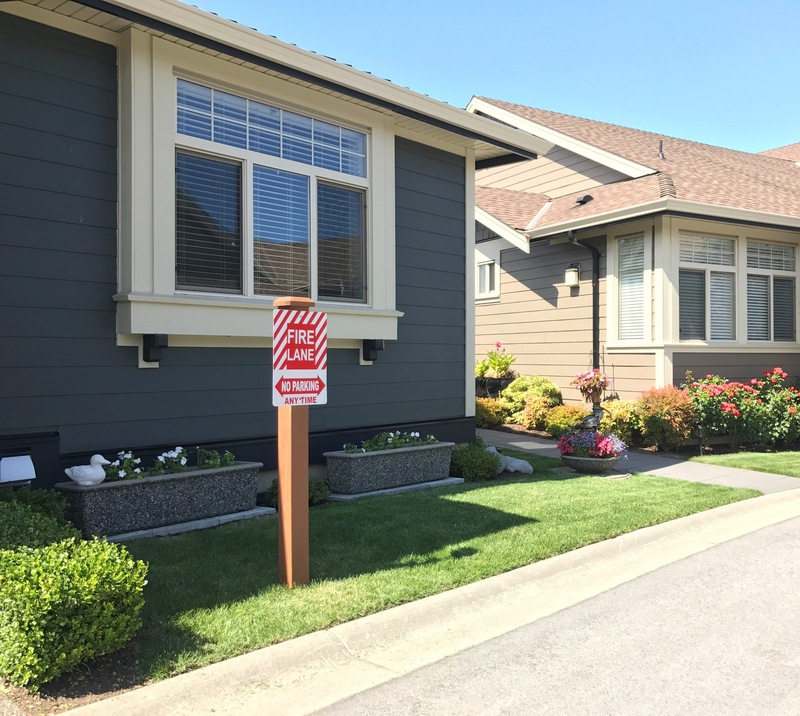 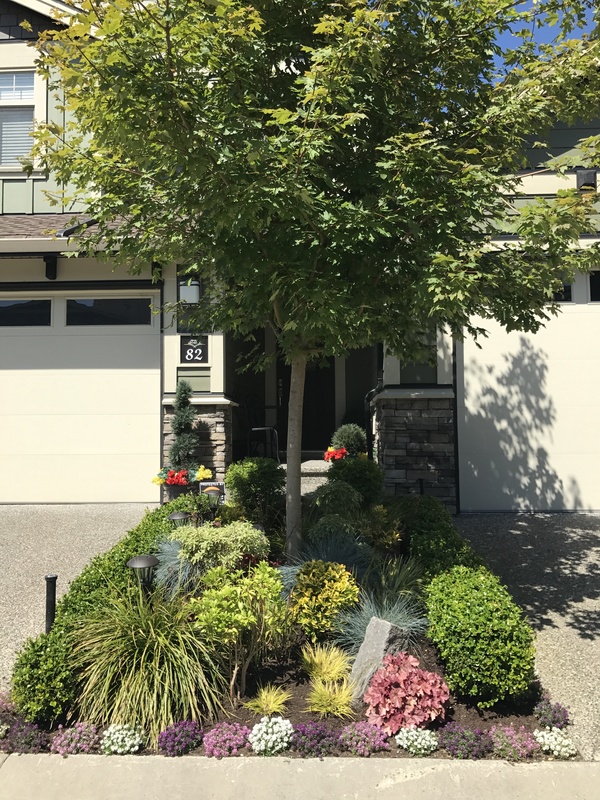 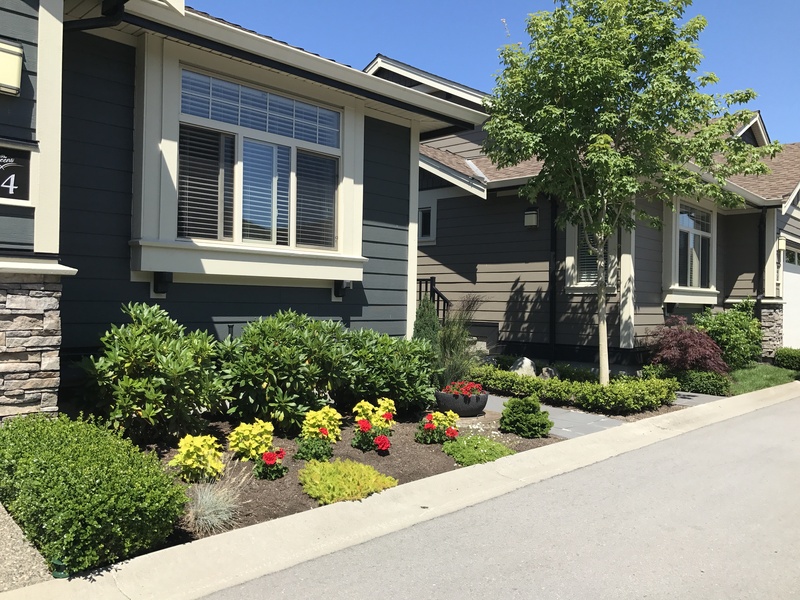 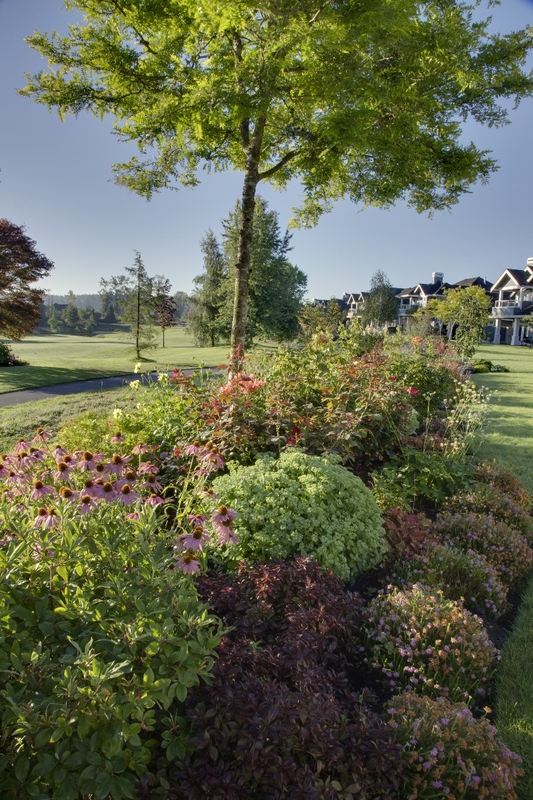 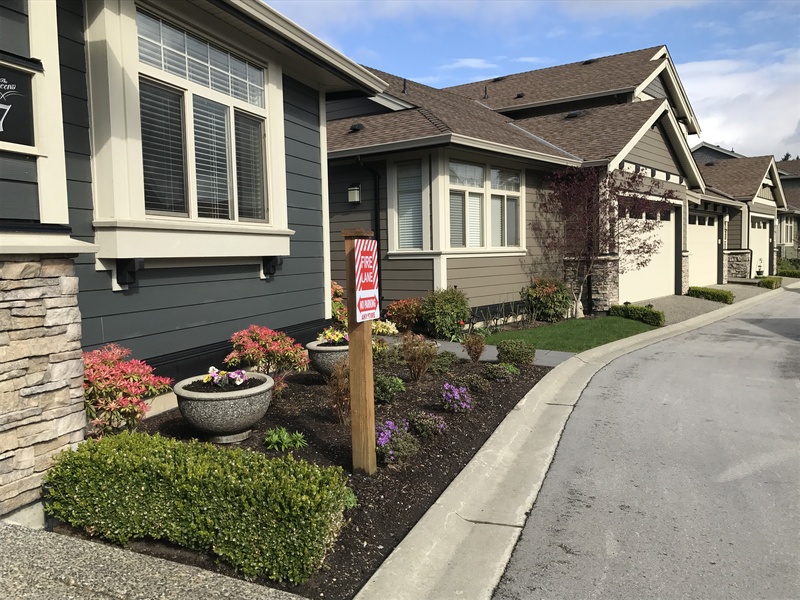 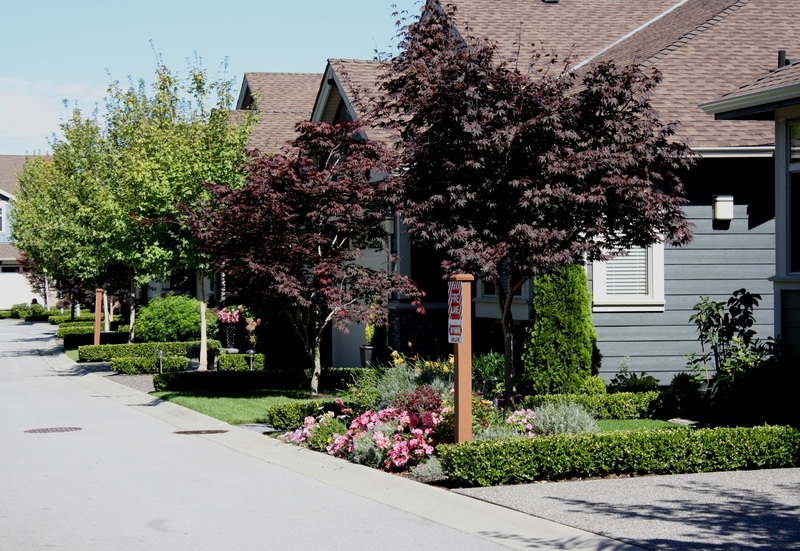 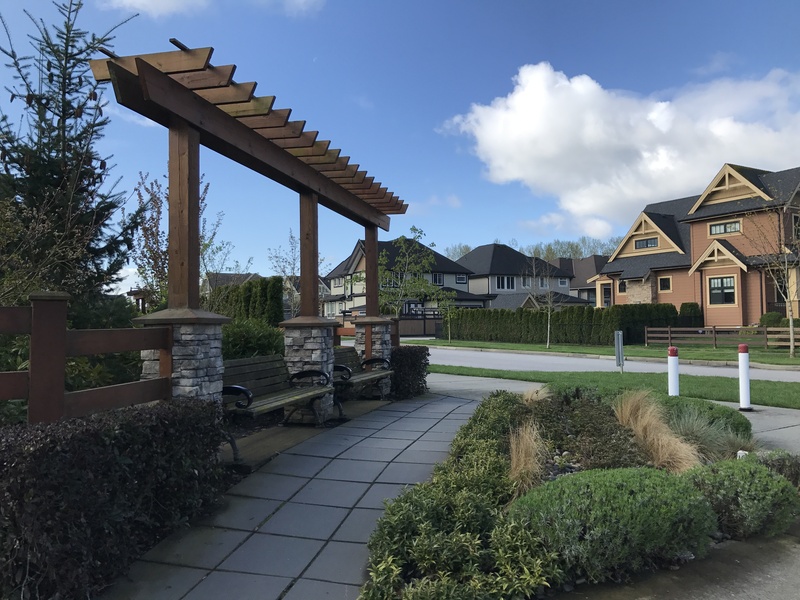 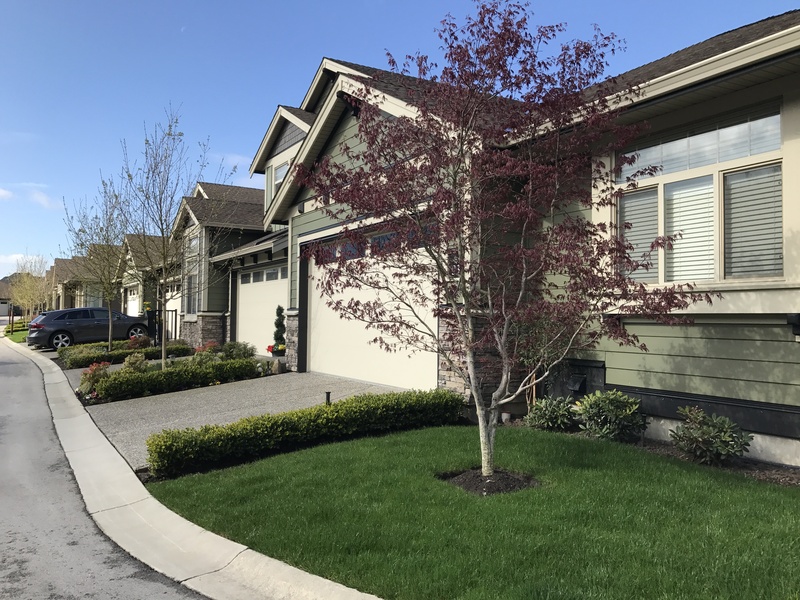 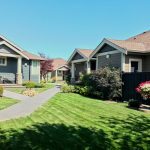 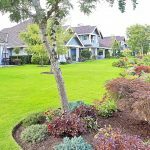 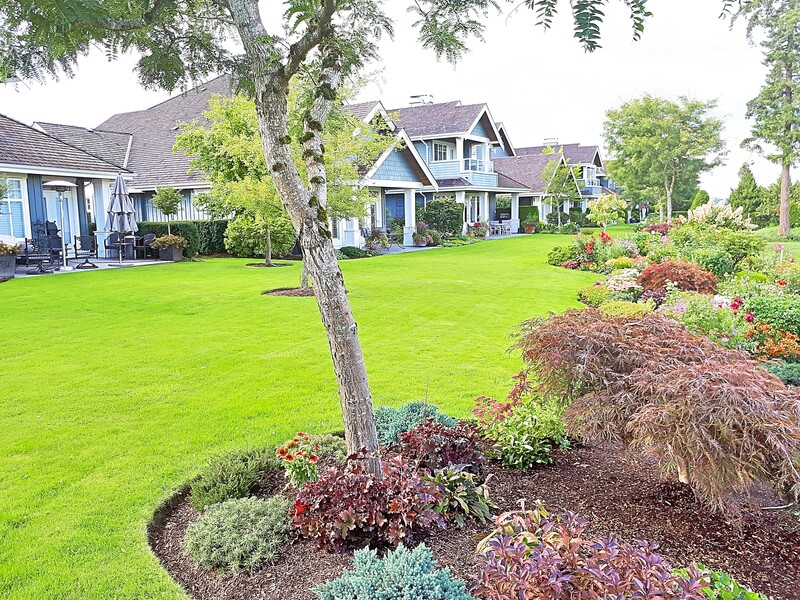 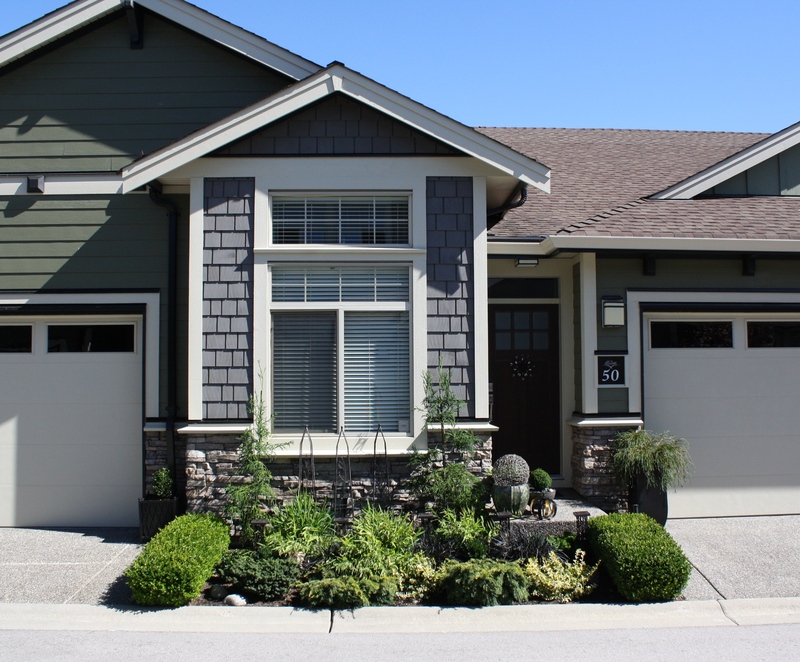 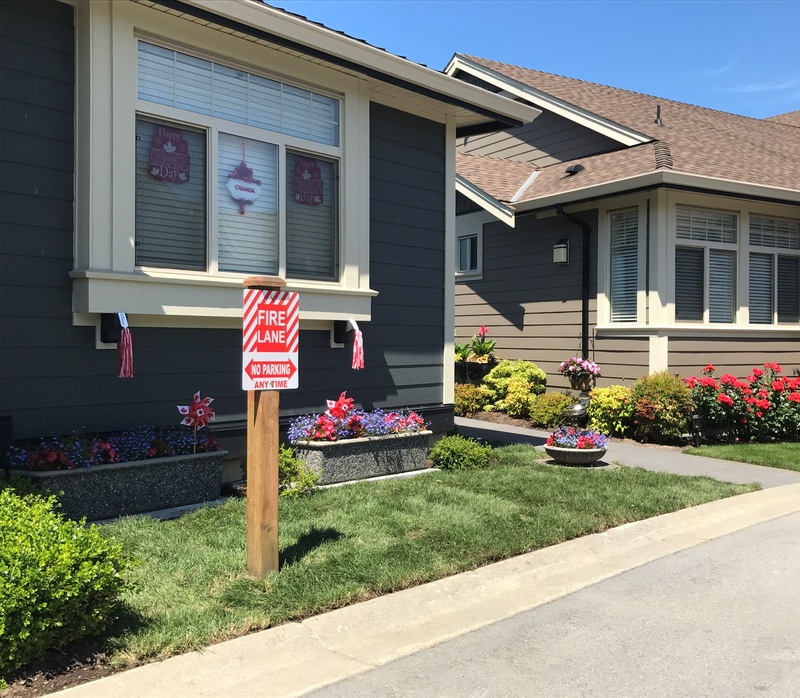 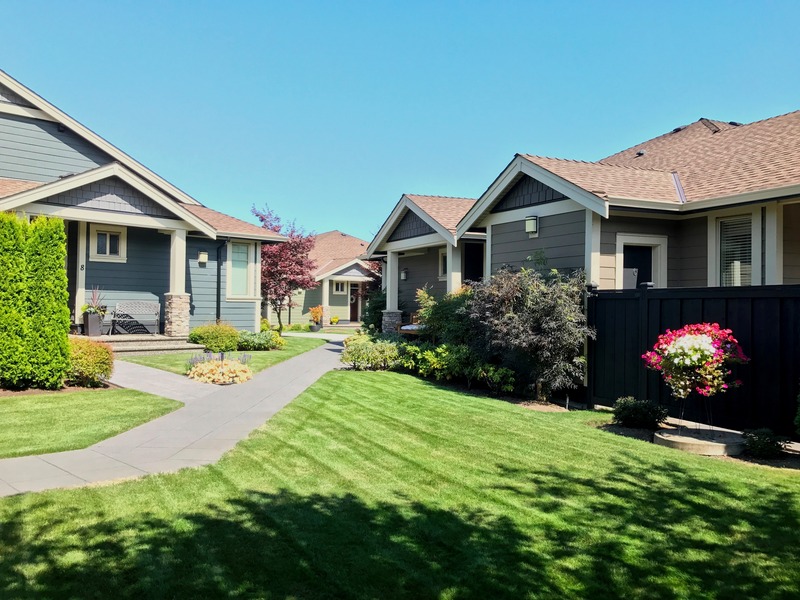 Greens at the Douglas is located in rural South Surrey and offers a tranquil setting with multiple seating areas and a putting green! 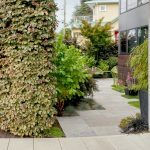 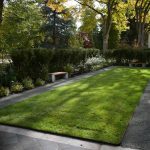 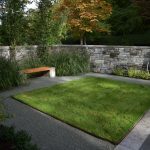 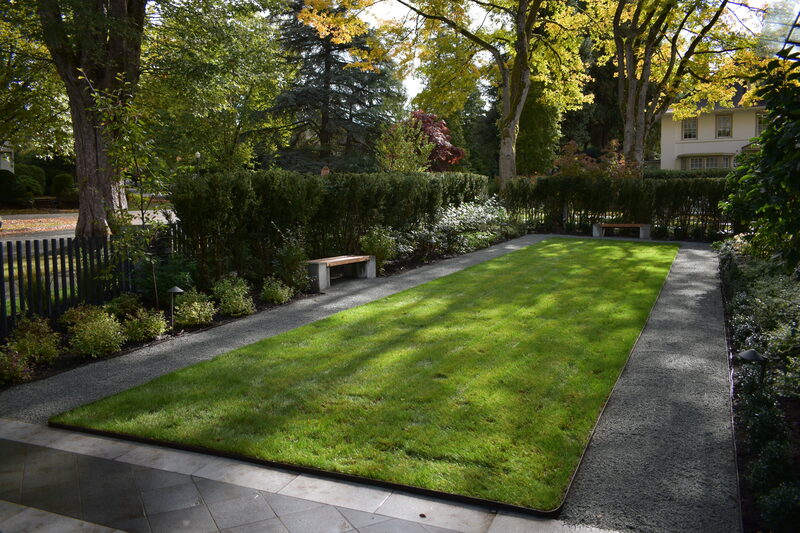 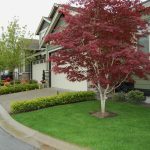 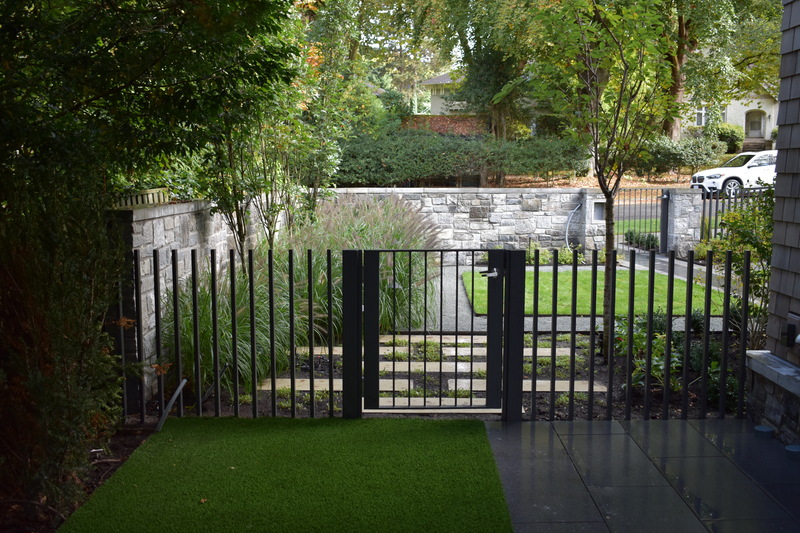 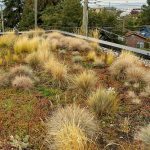 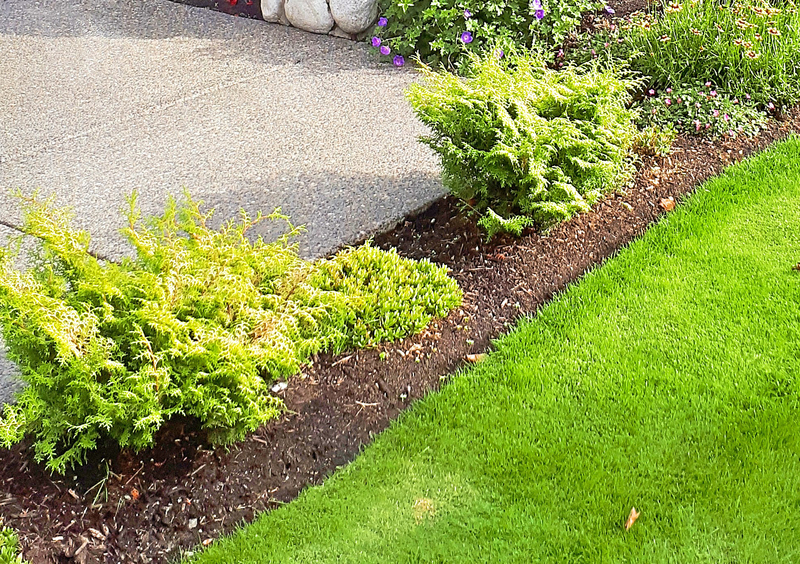 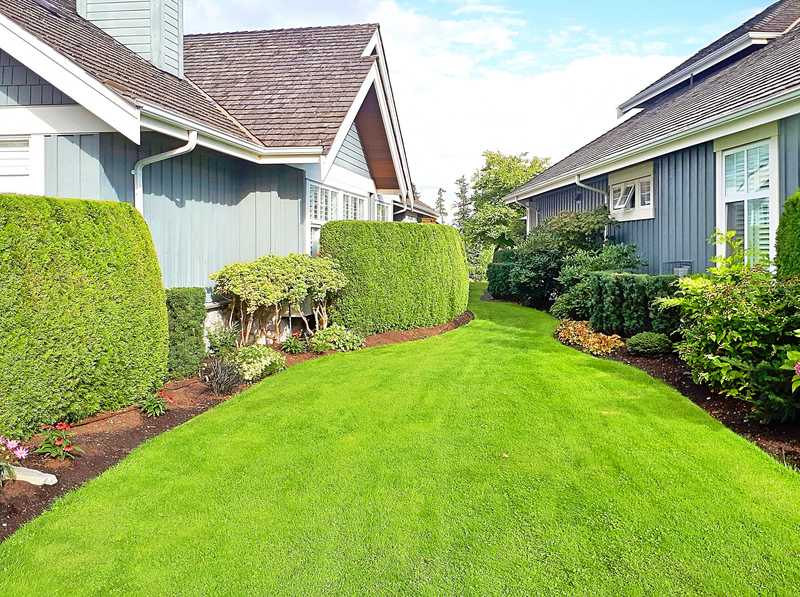 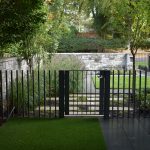 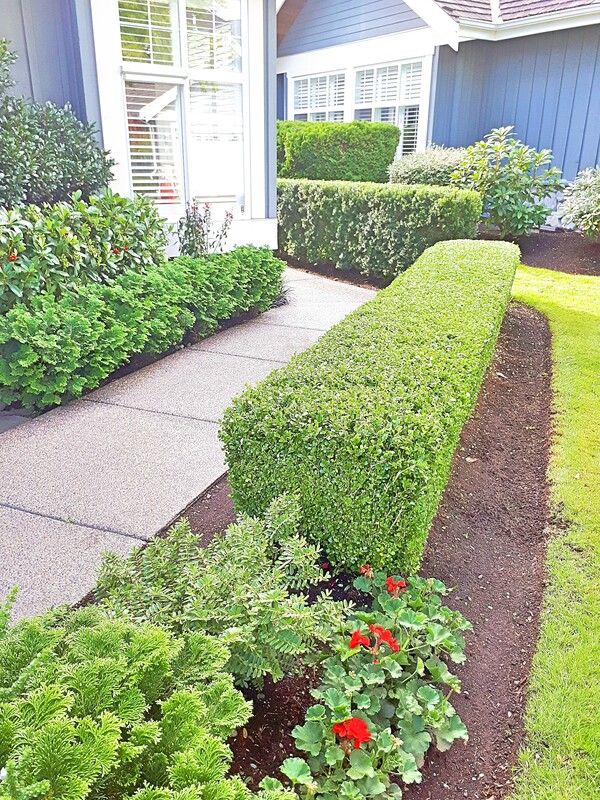 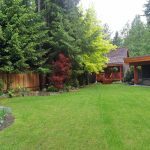 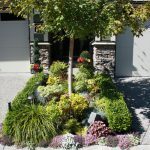 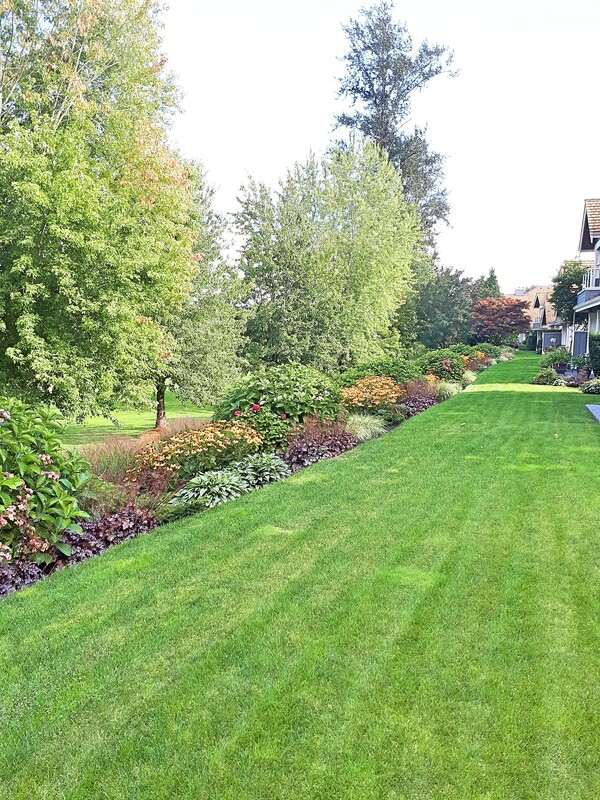 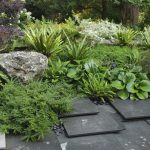 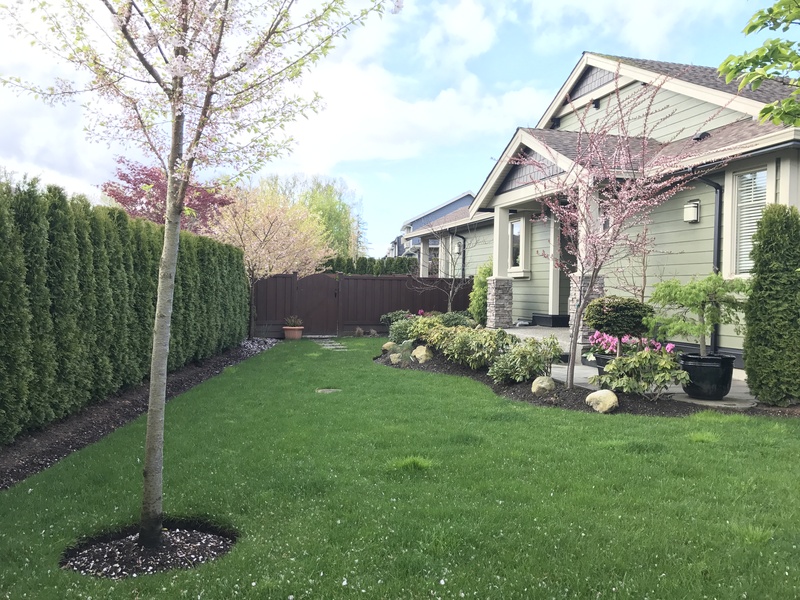 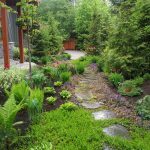 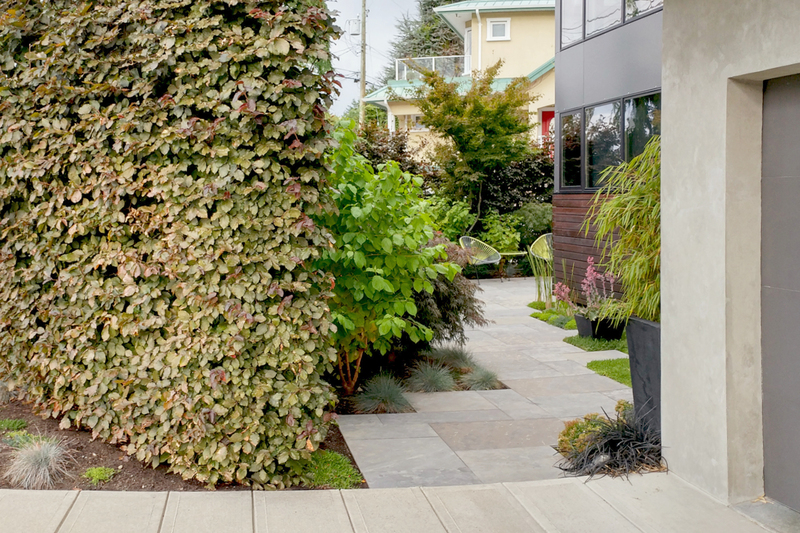 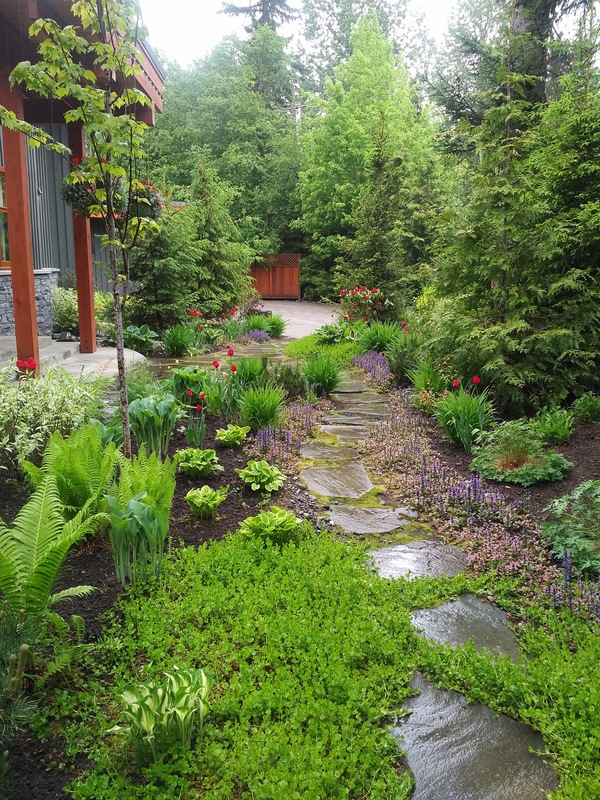 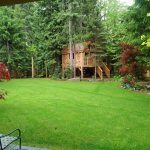 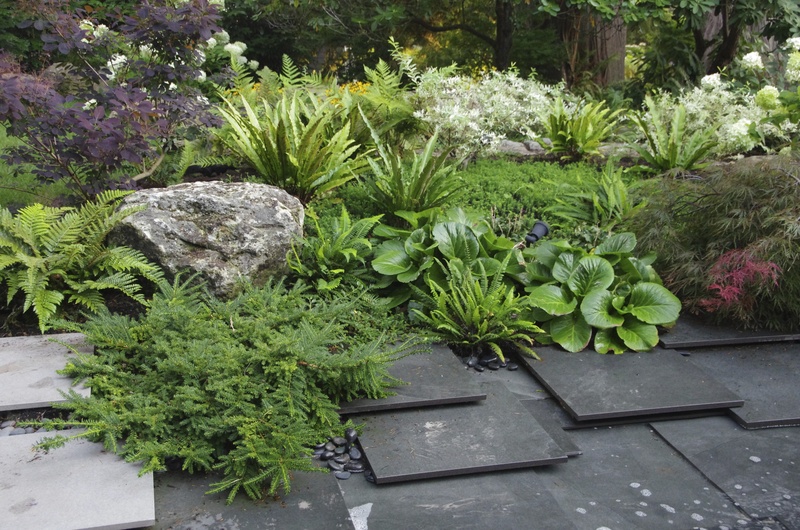 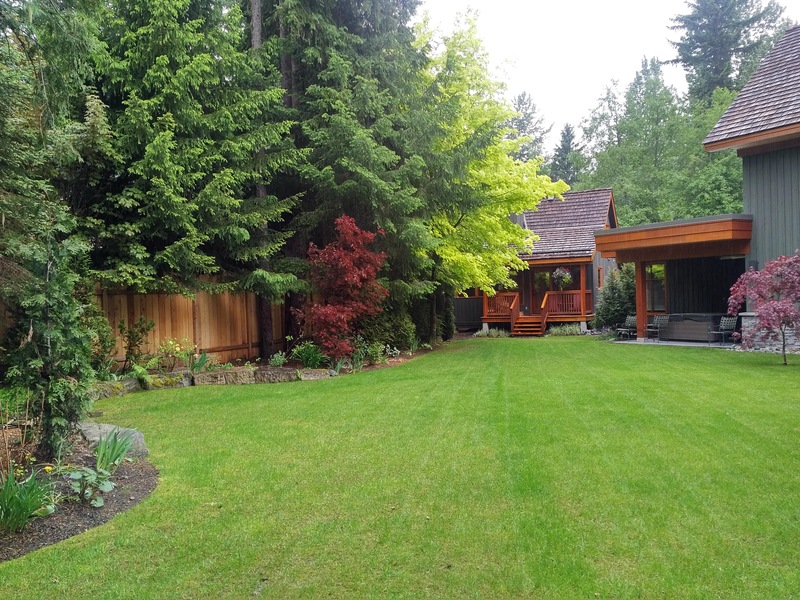 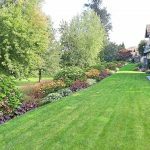 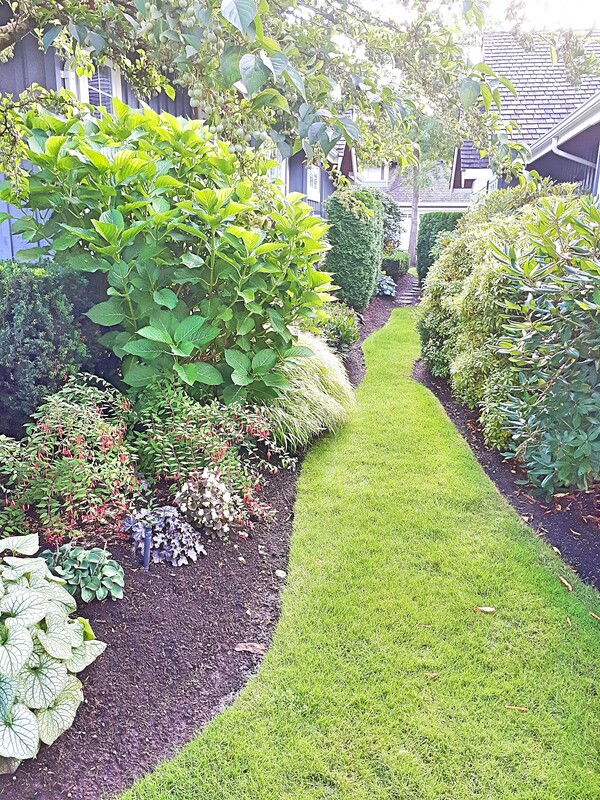 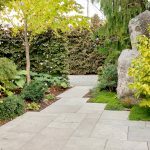 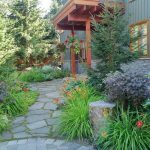 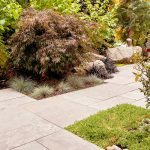 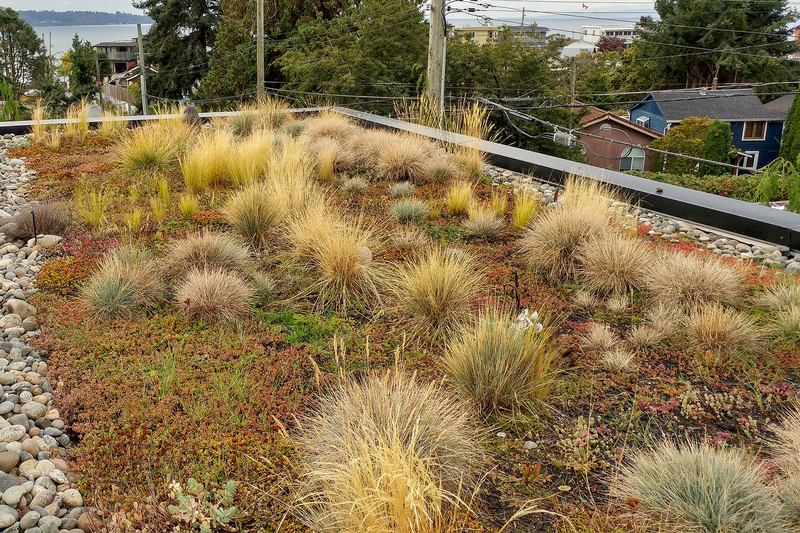 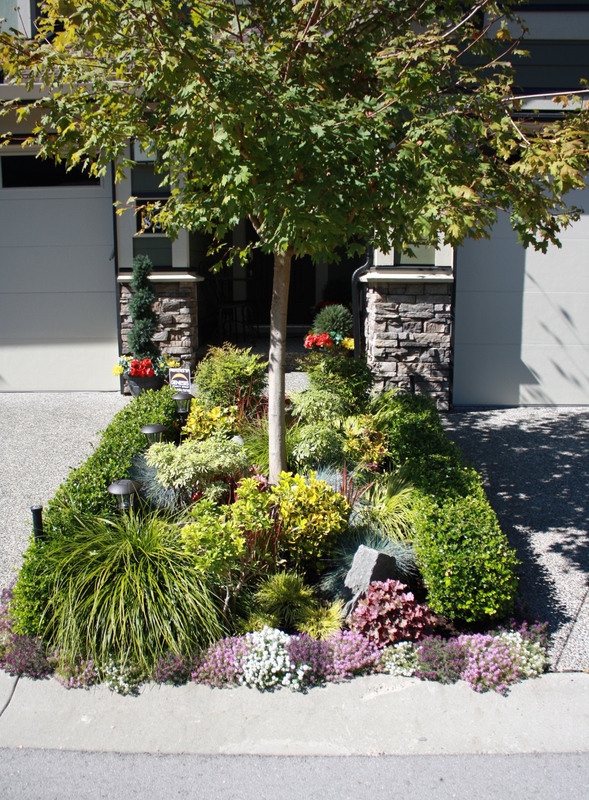 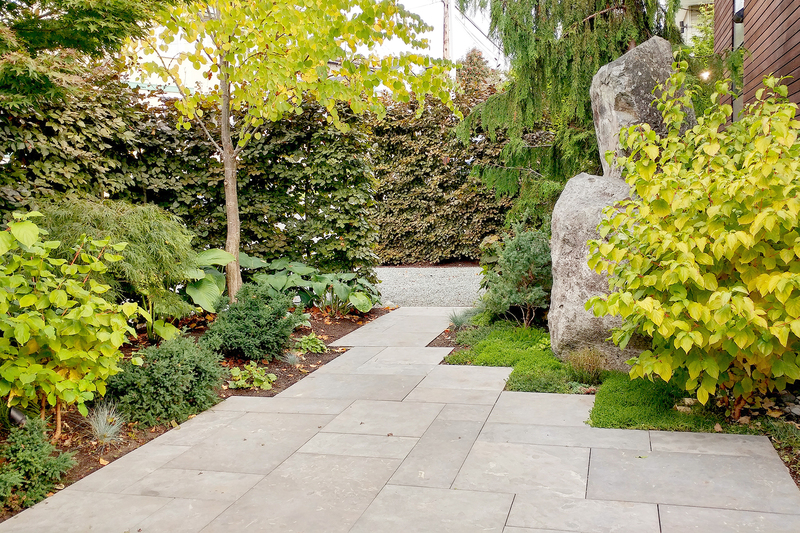 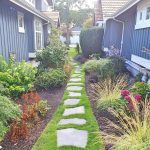 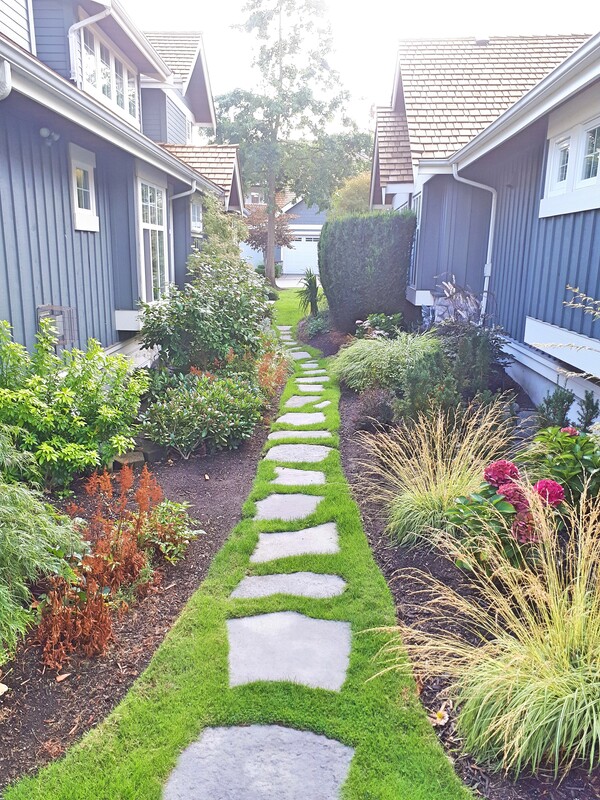 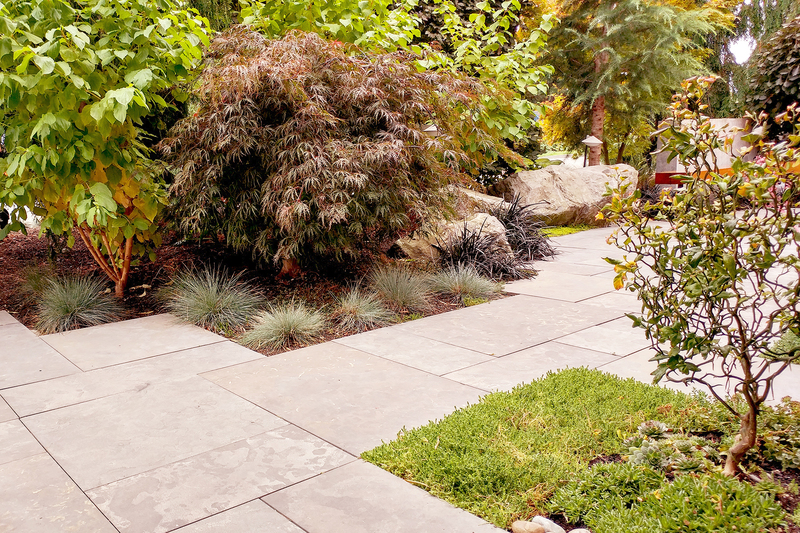 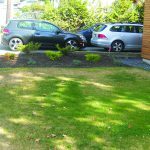 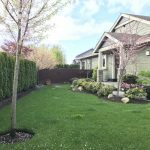 This lush, spacious landscape features expansive turfed areas and a wide variety of plant material, providing a touch of both formal and informal elements. 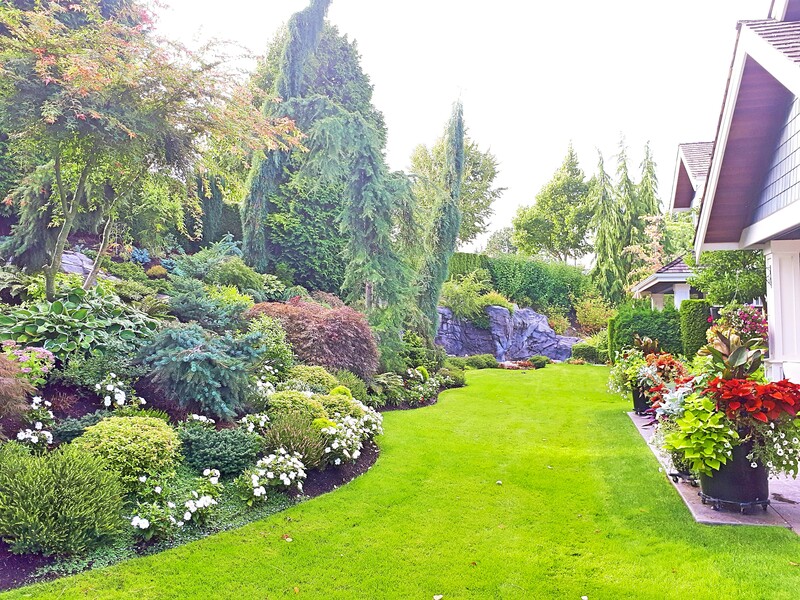 Relaxing at home is made easy when you have this well manicured landscape to enjoy! 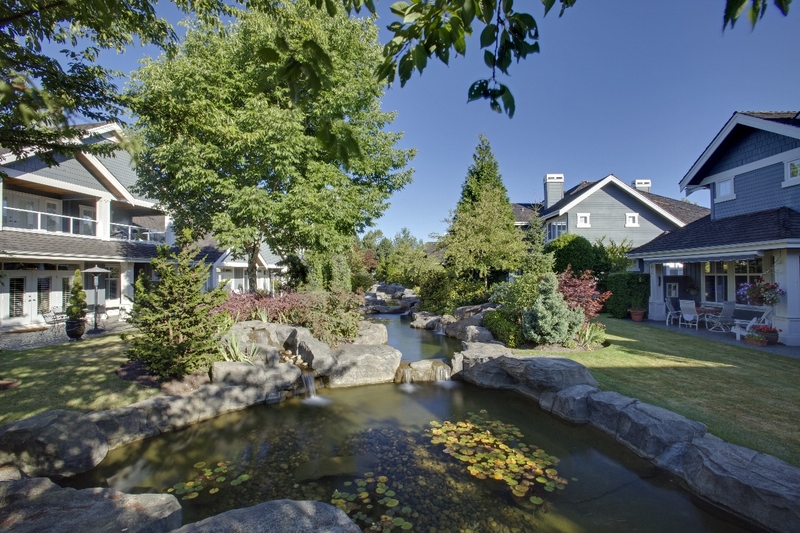 Wedgewood is a multi-unit residential development that spans 17 acres and features 19 beautiful water features, exquisite gardens and exceptional layout. 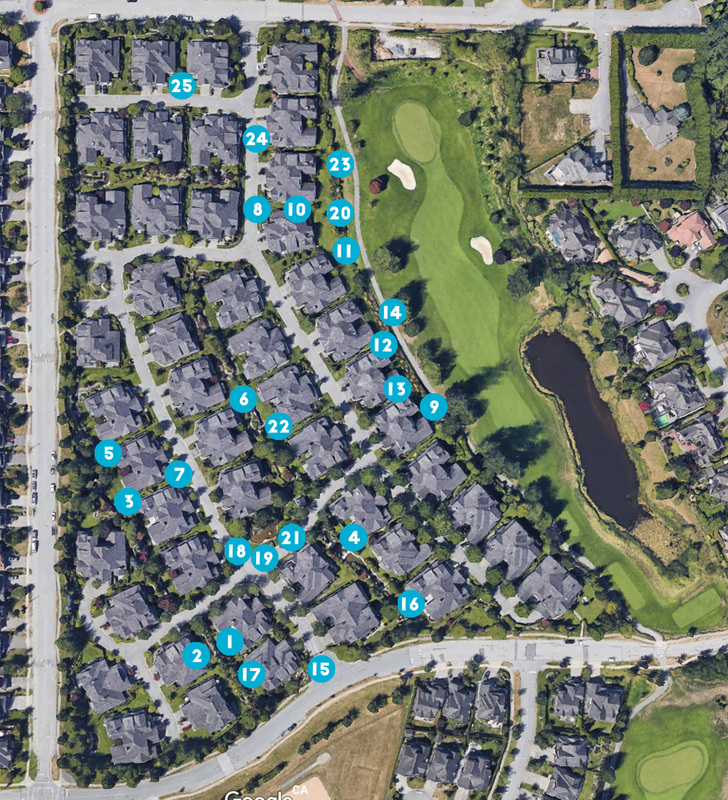 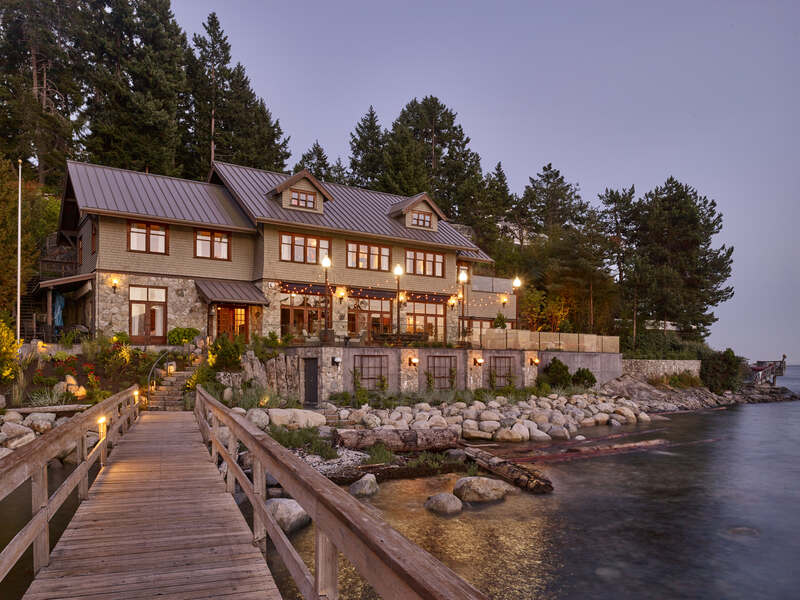 All 96 homes either have a golf course view or back up onto serene waterscapes. 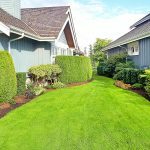 The plant material alone exceeds other multi-unit residential complexes in its beauty, variability, quality and overall aesthetics. 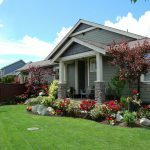 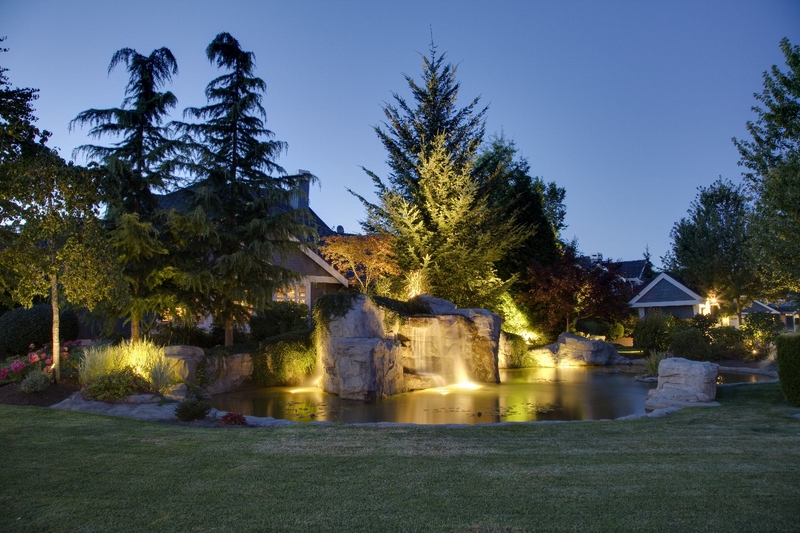 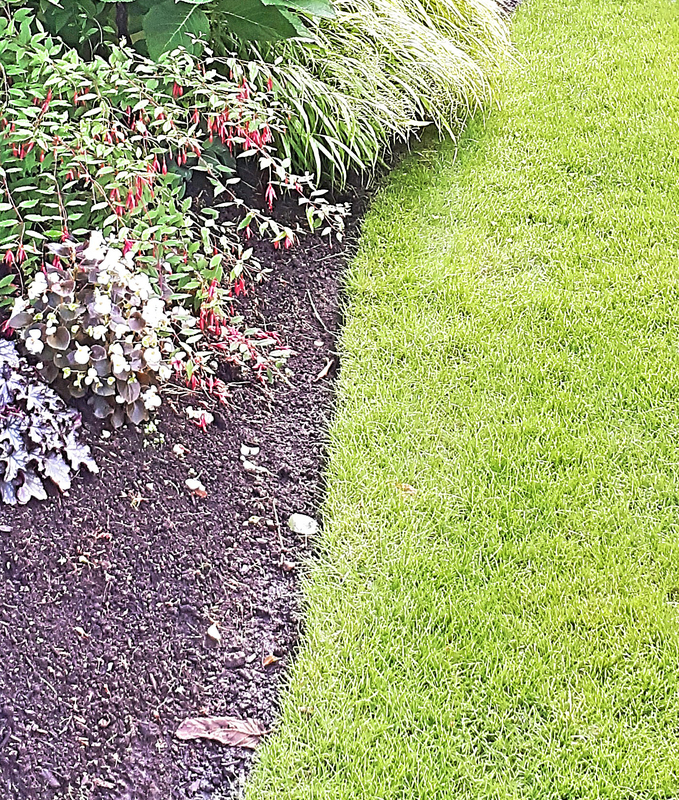 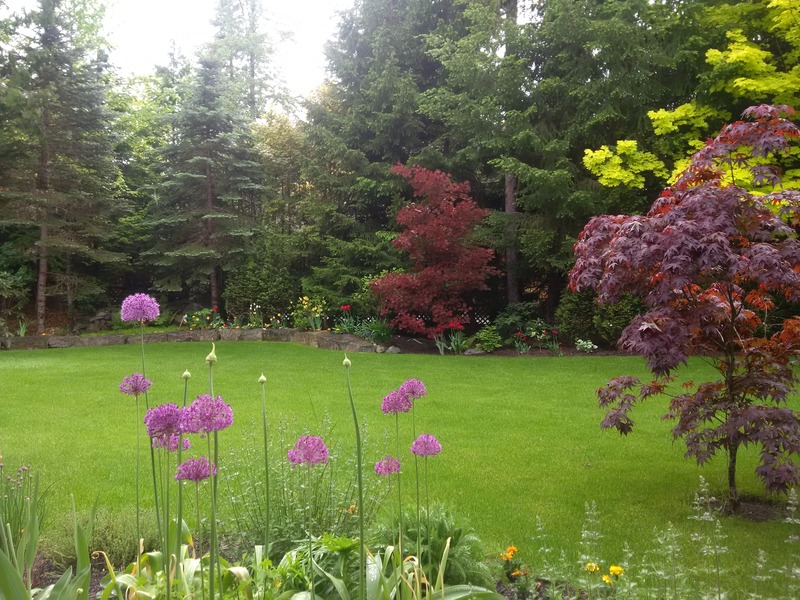 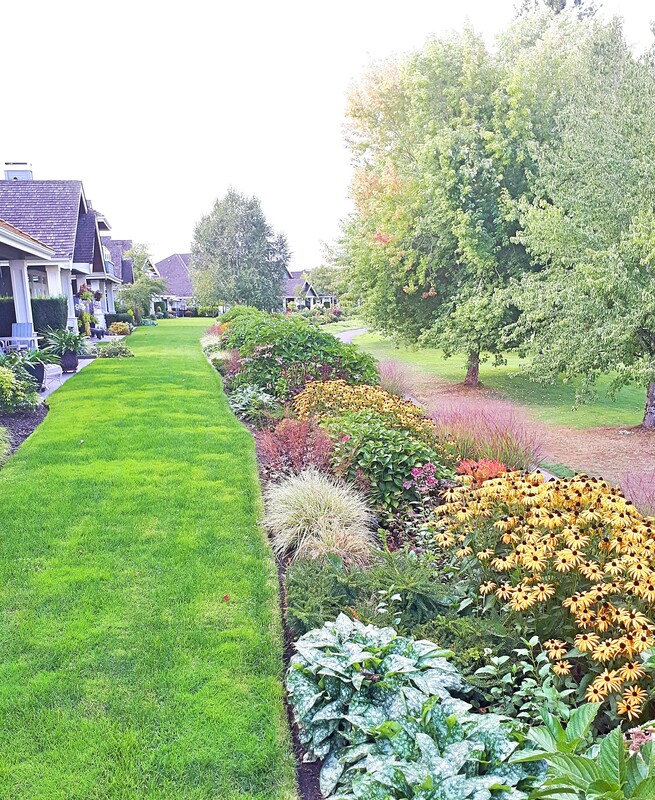 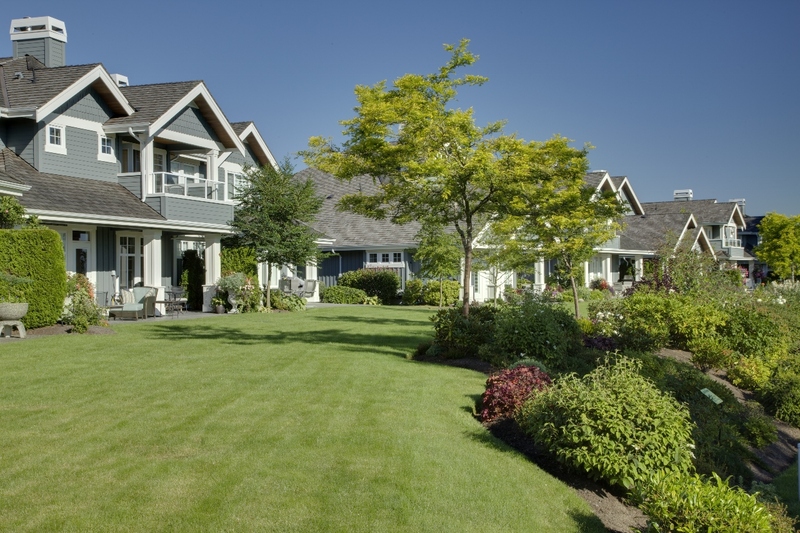 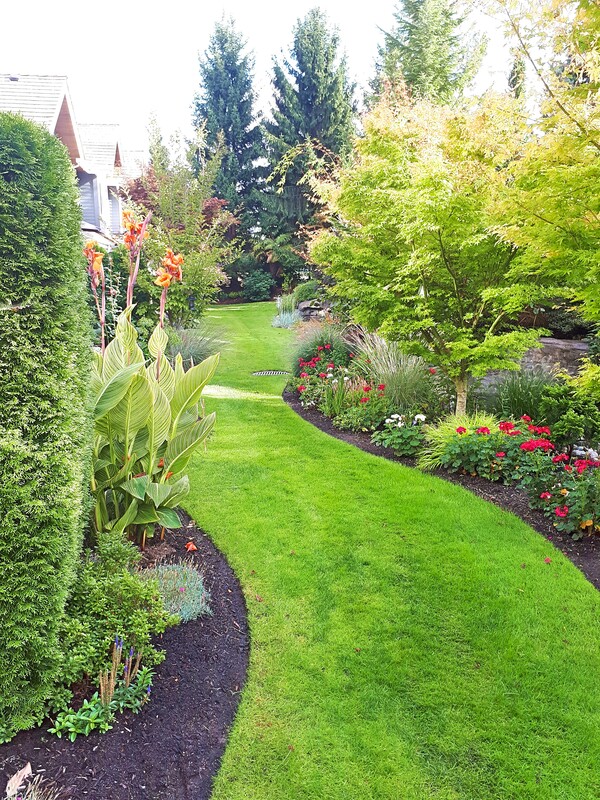 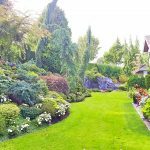 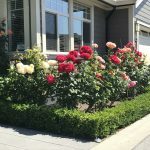 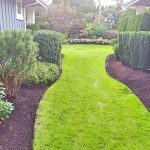 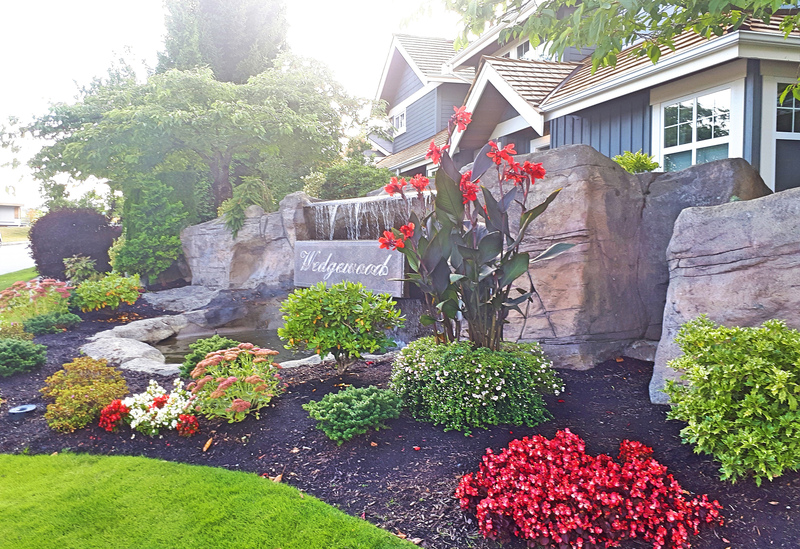 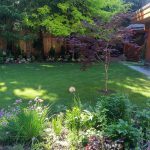 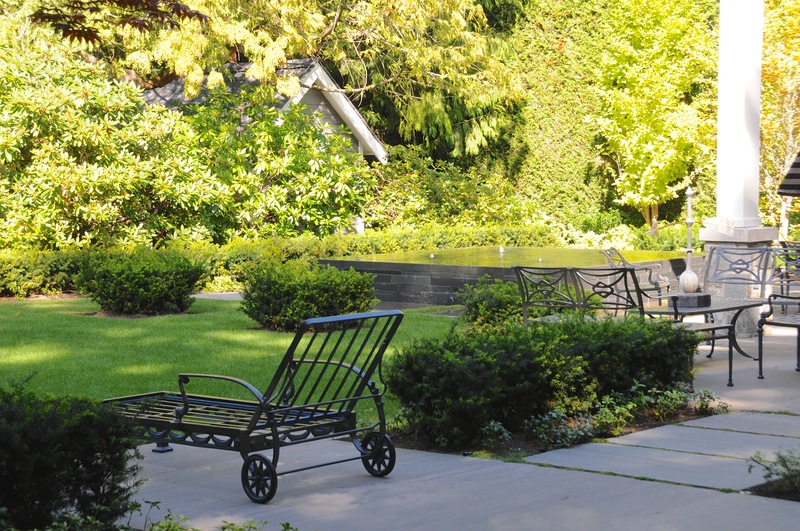 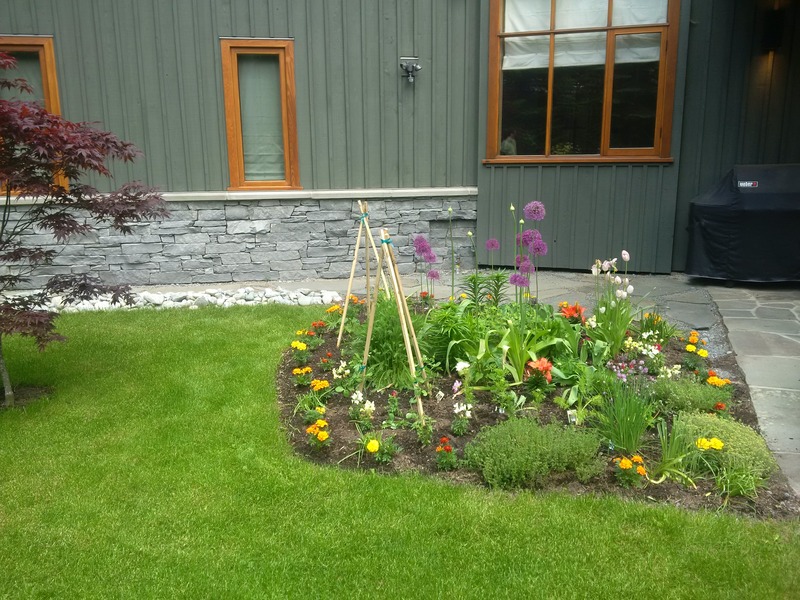 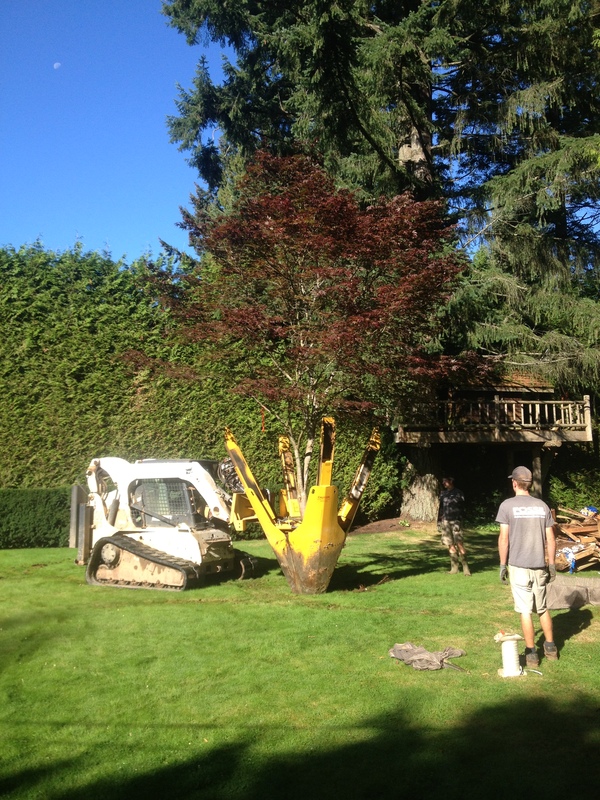 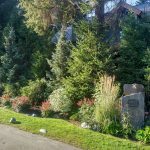 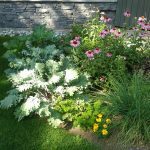 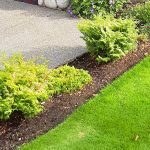 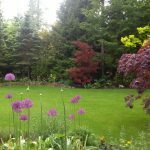 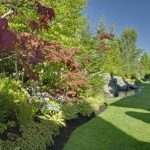 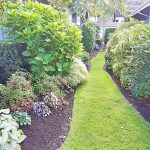 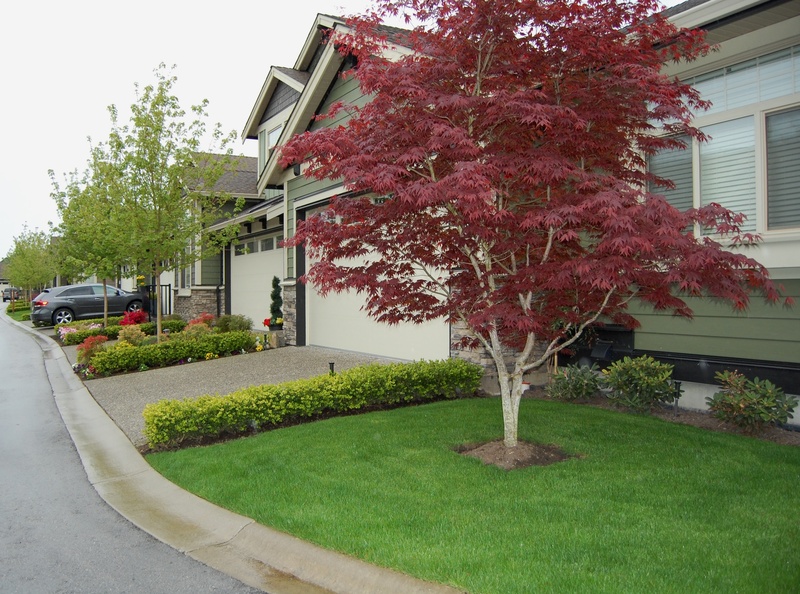 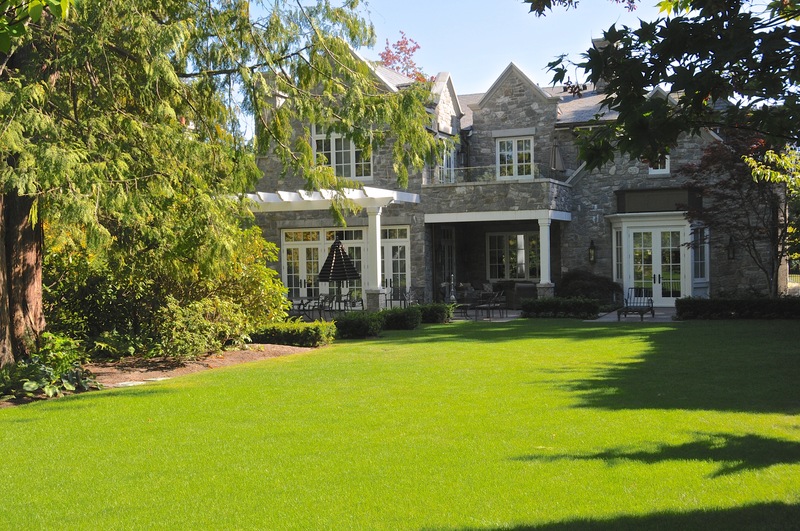 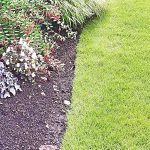 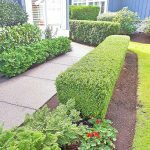 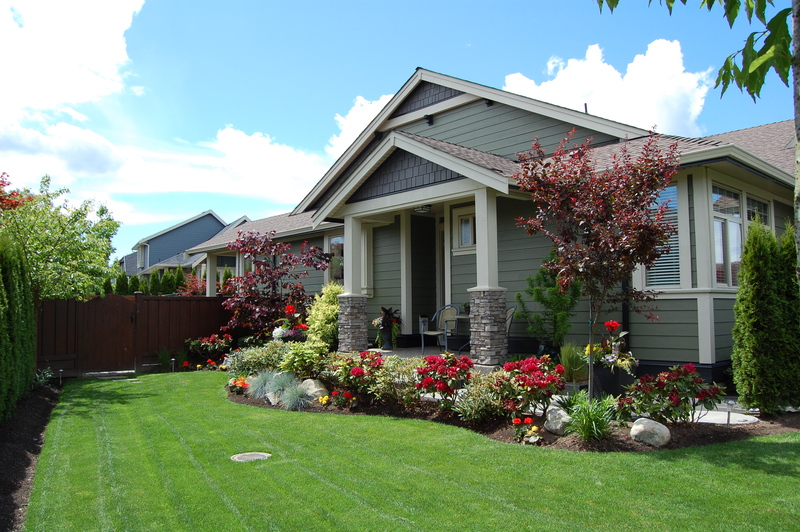 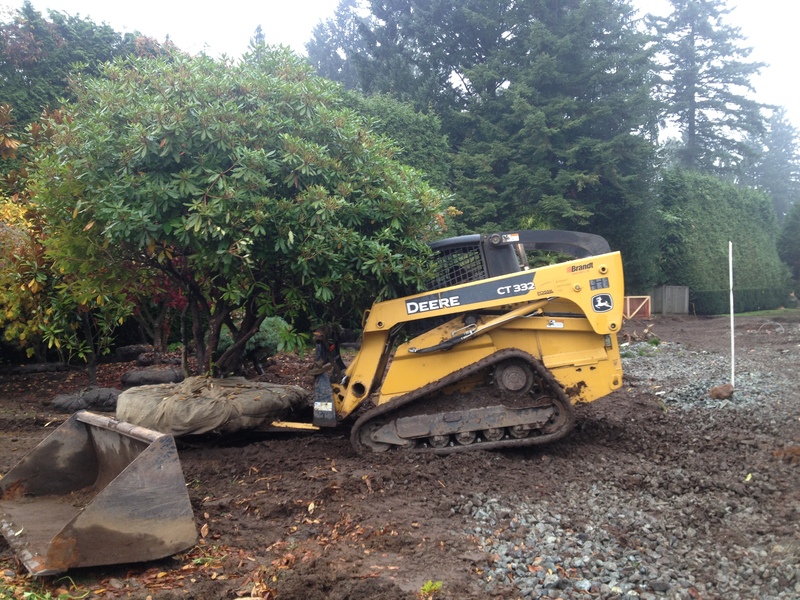 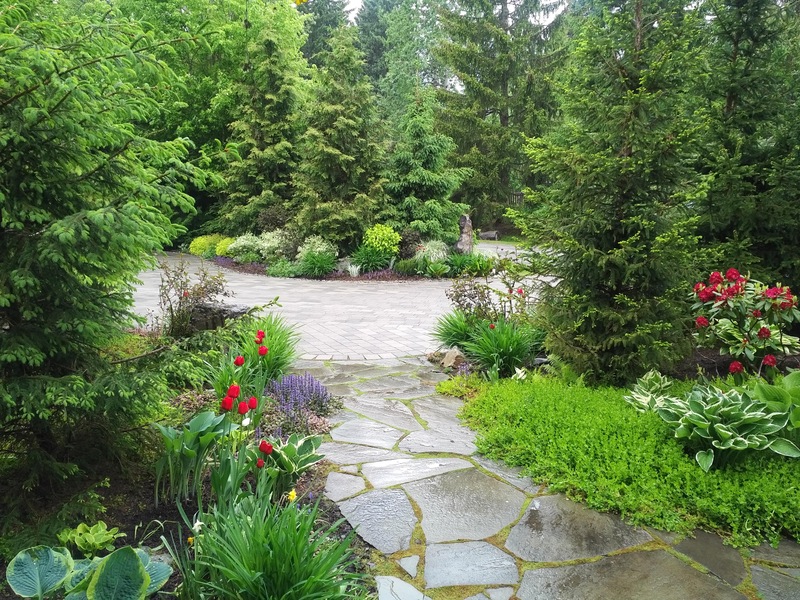 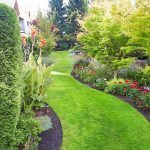 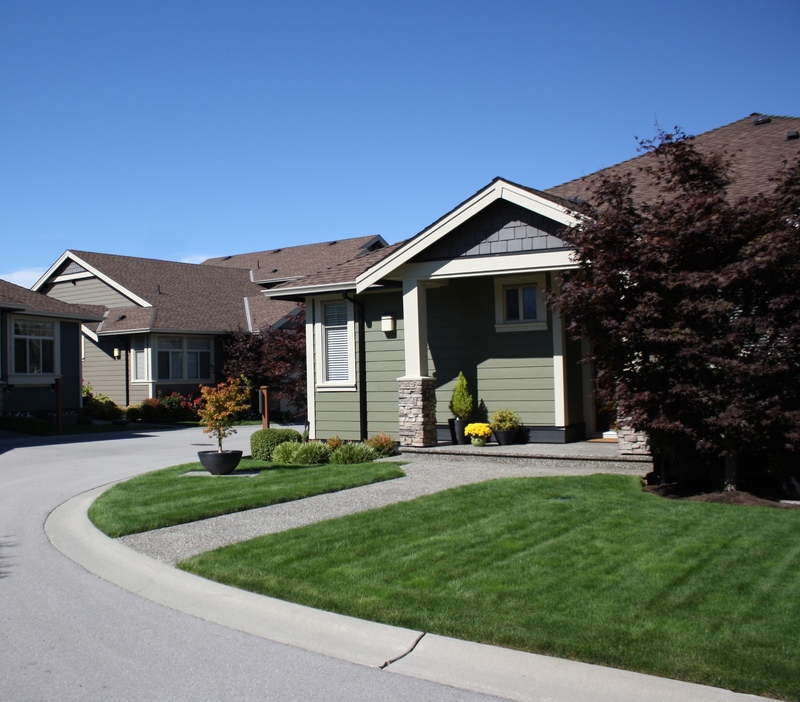 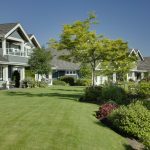 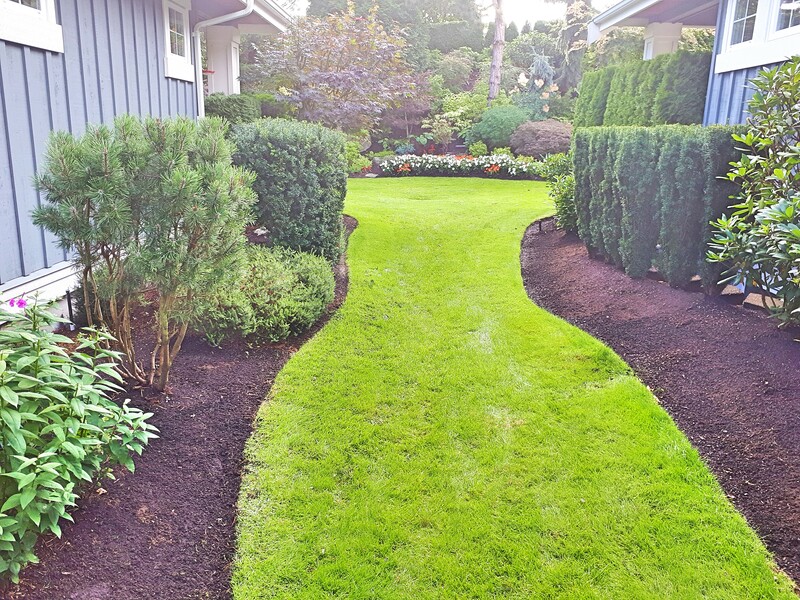 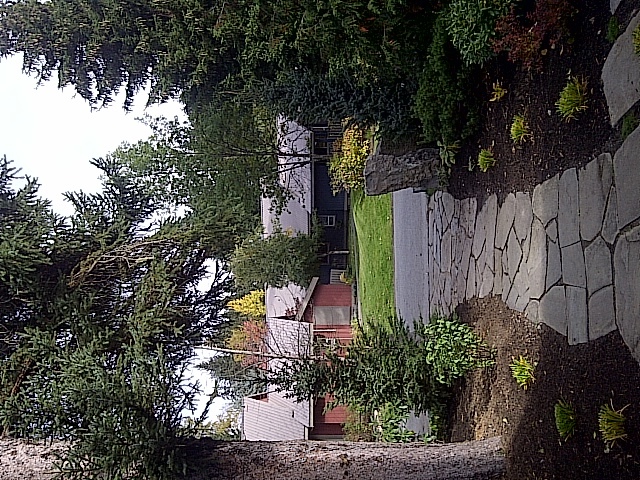 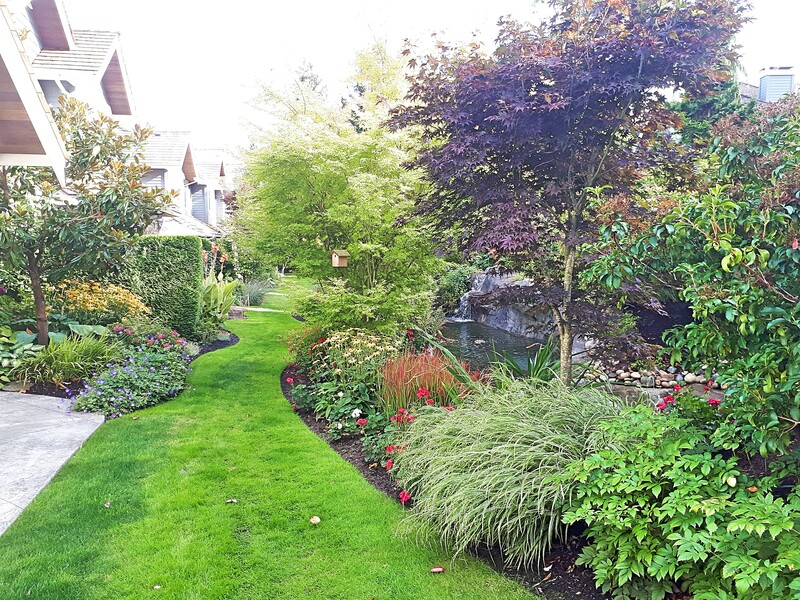 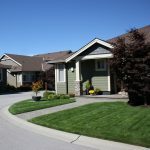 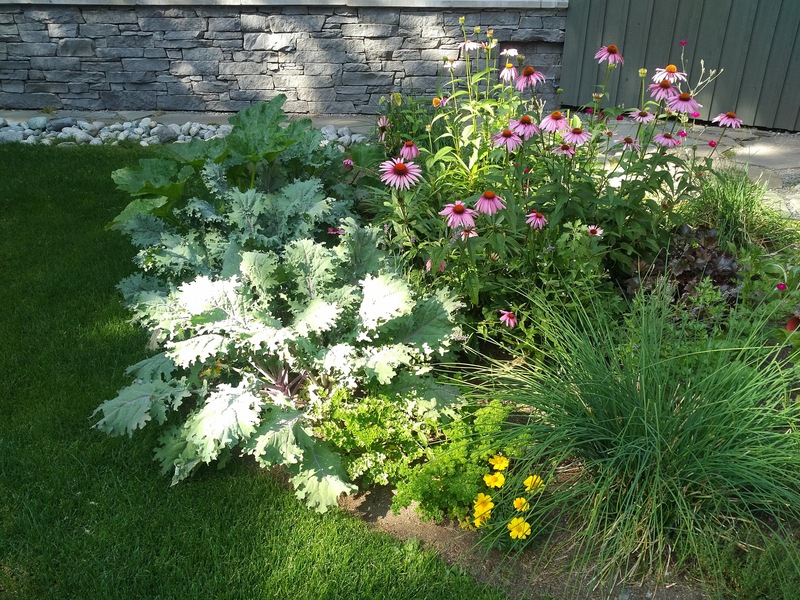 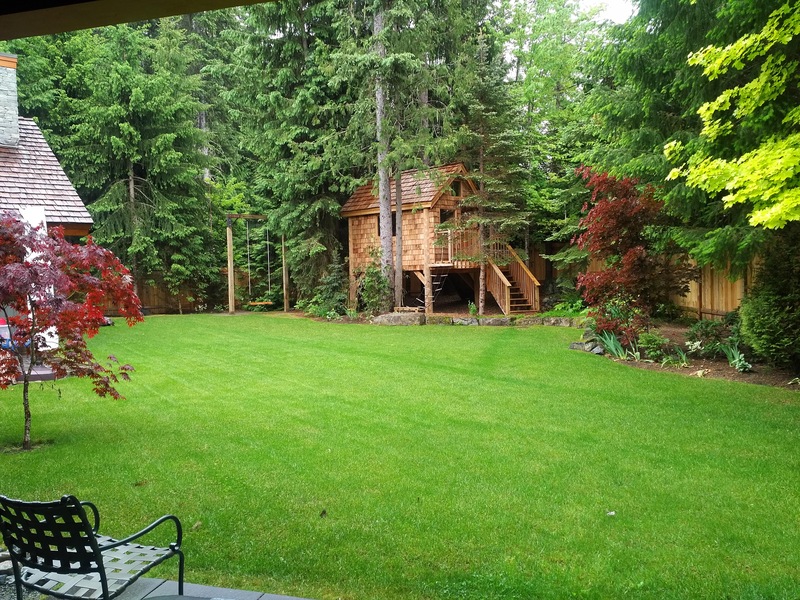 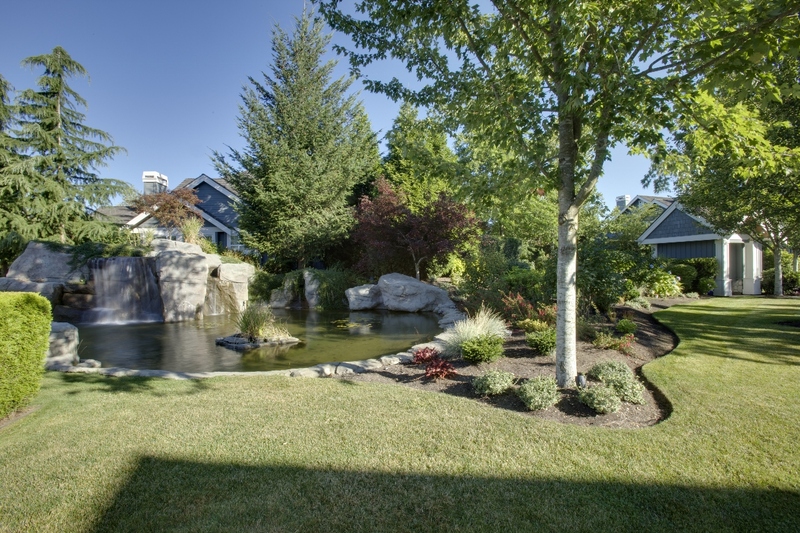 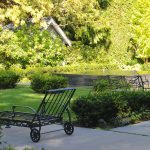 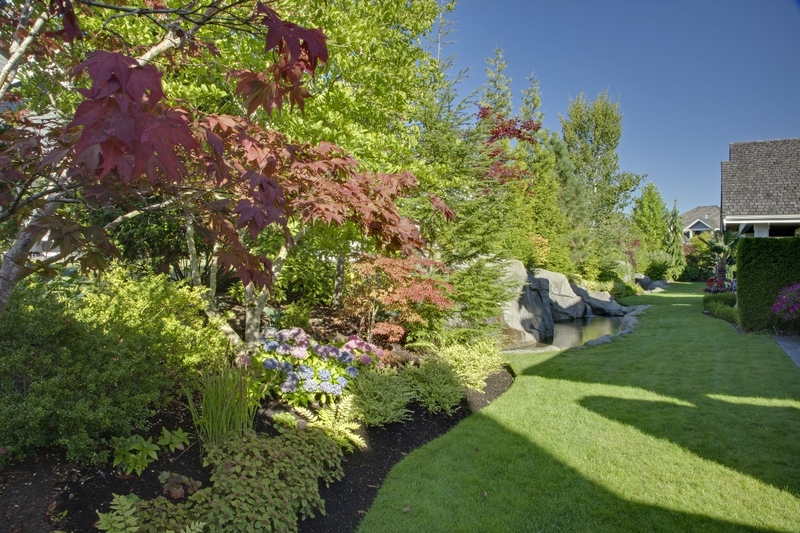 We have had the pleasure of maintaining Wedgewood’s landscape for the past 11 years.